All "Likelihood of Returning" evaluations take into account (1) how close to my home it is and (2) the infinite number of competing new places to explore in Maine - not just the nature of the location itself. Here's a word about THE EQUIPMENT. 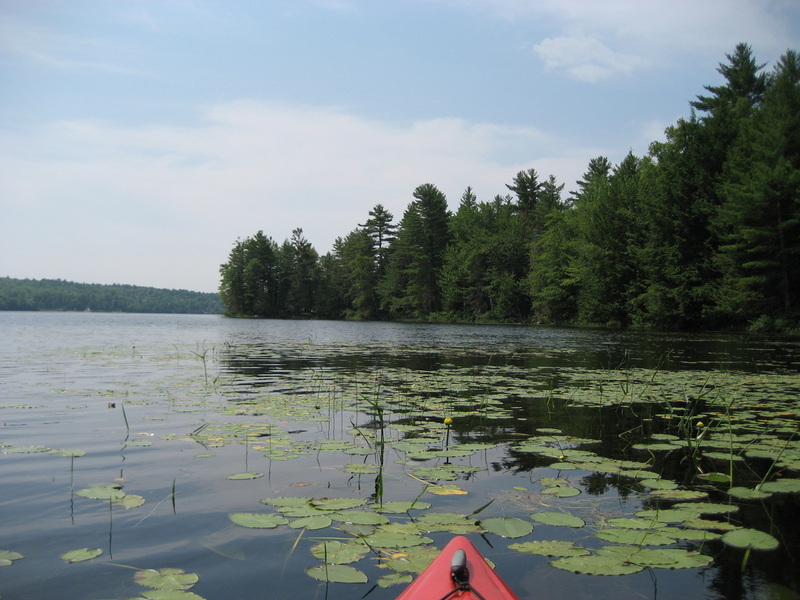 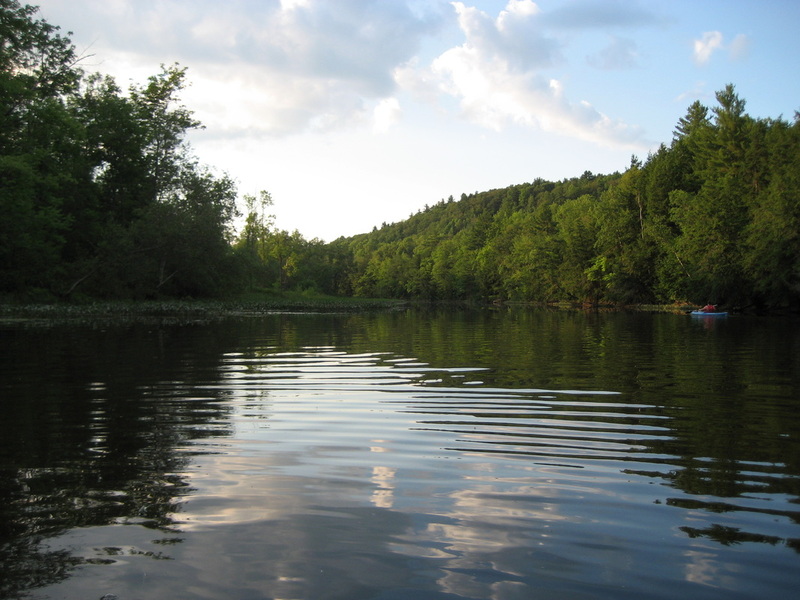 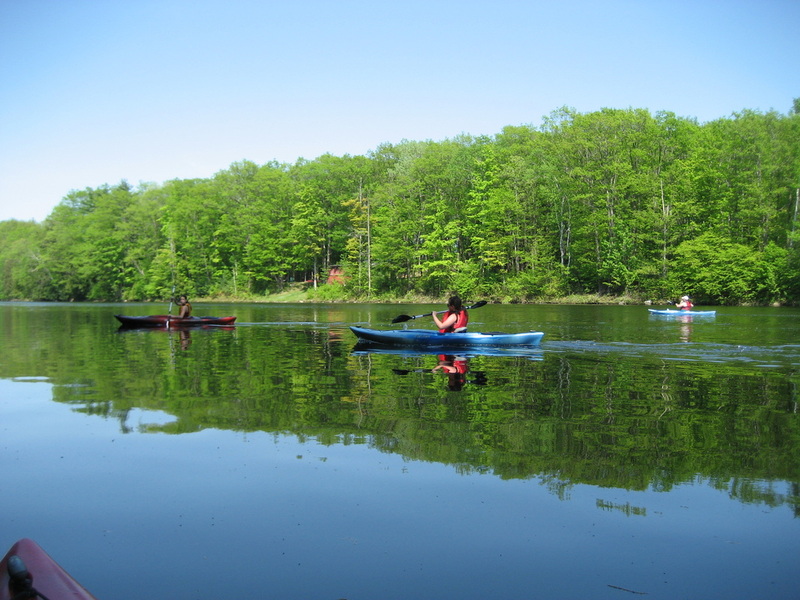 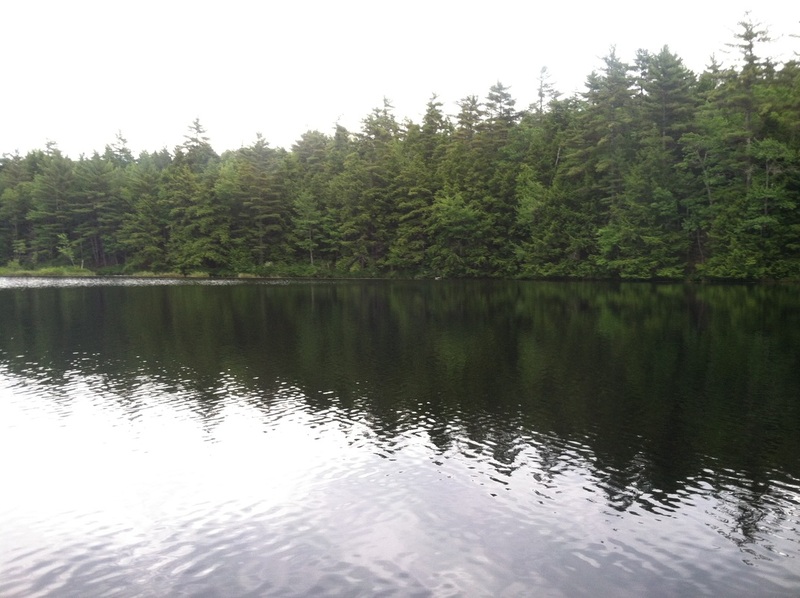 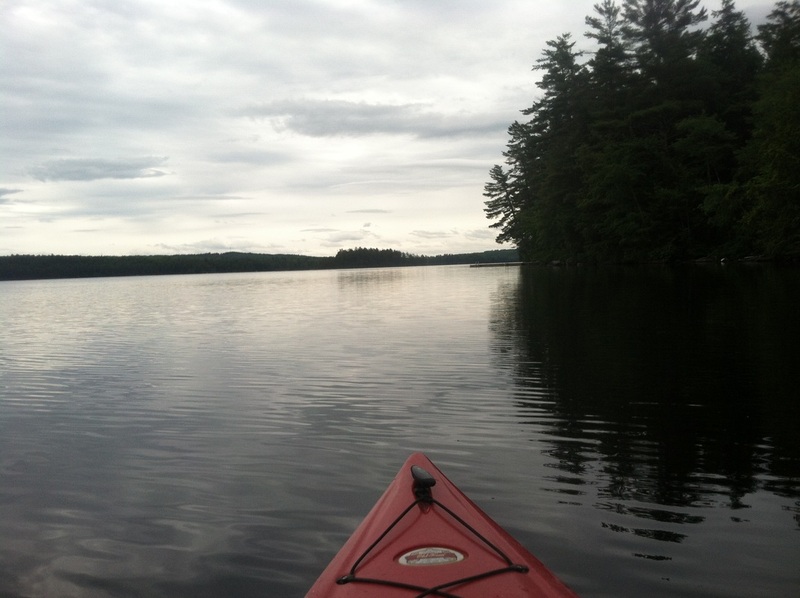 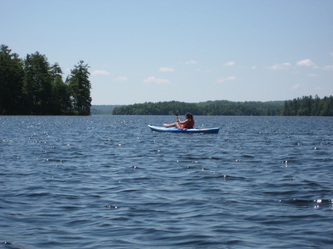 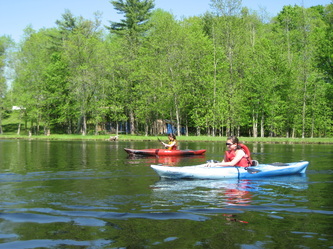 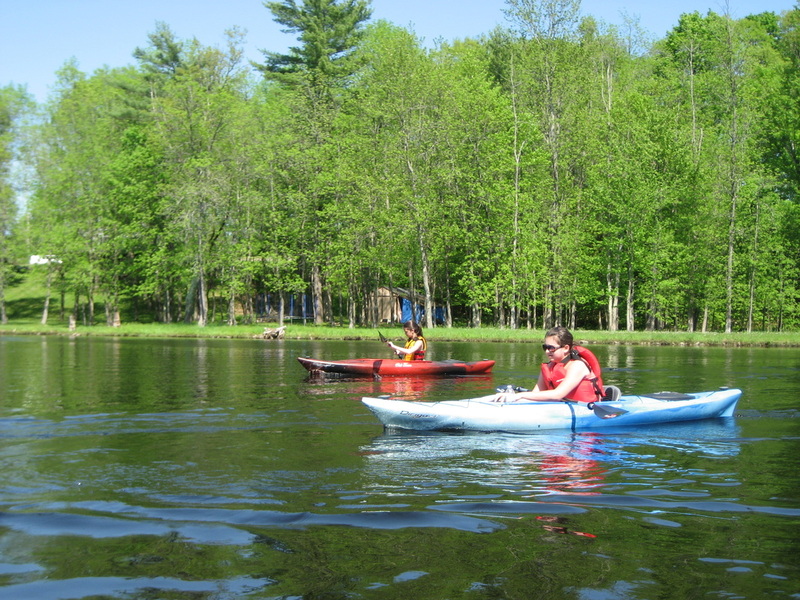 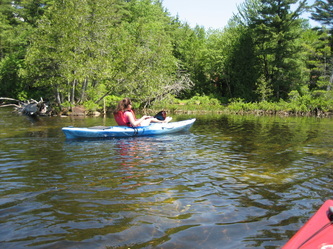 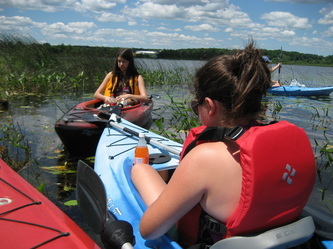 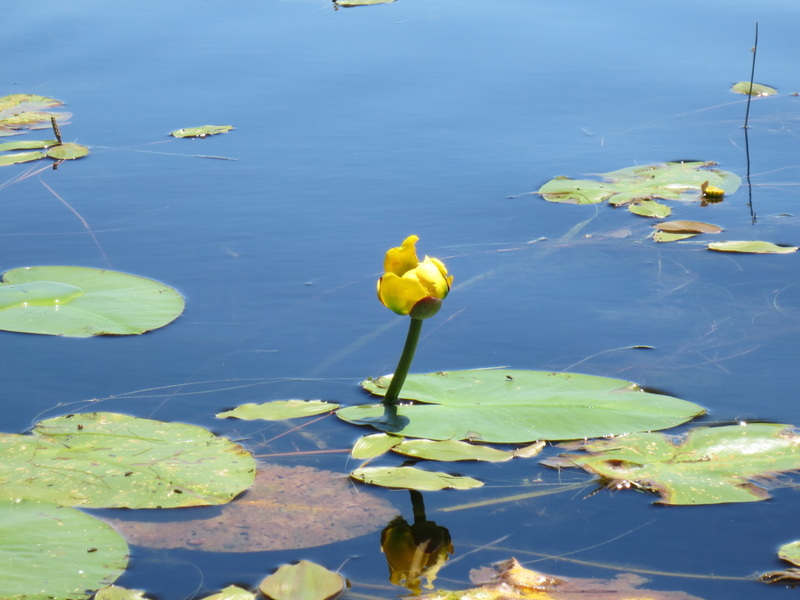 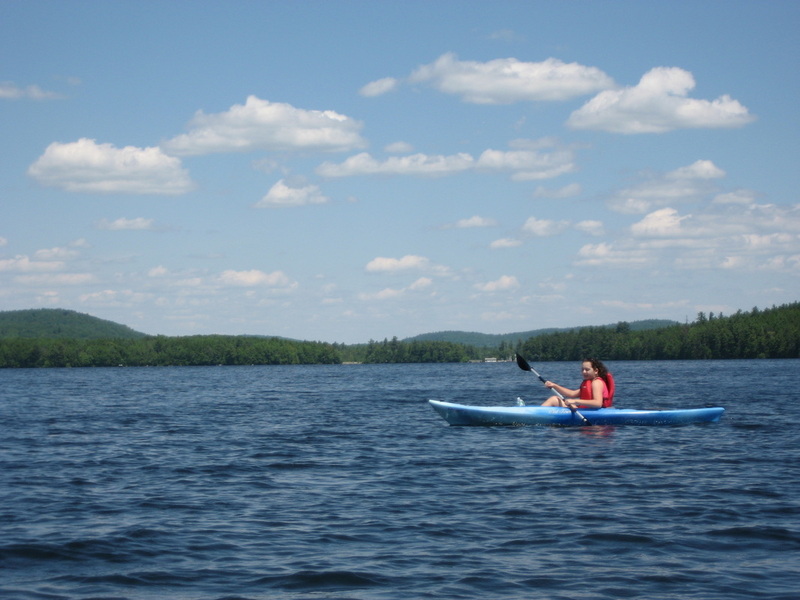 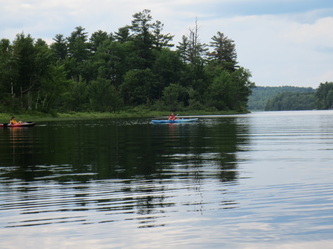 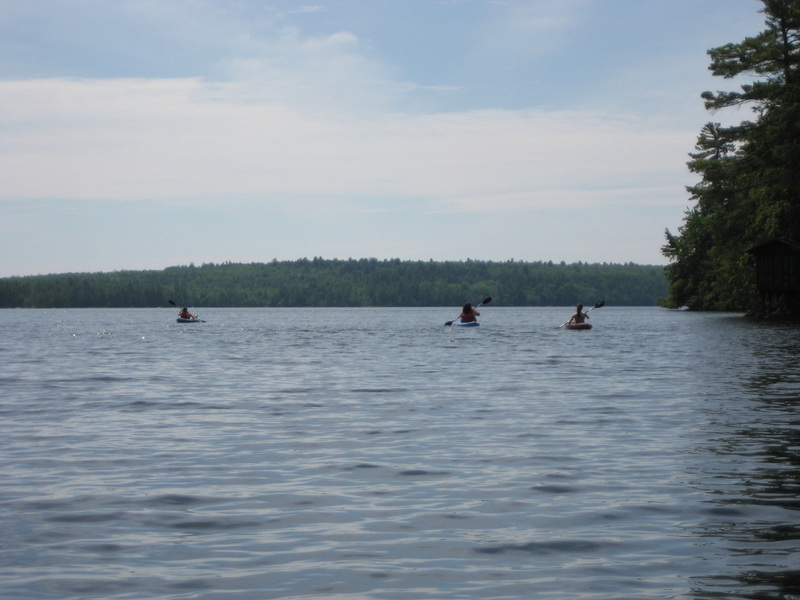 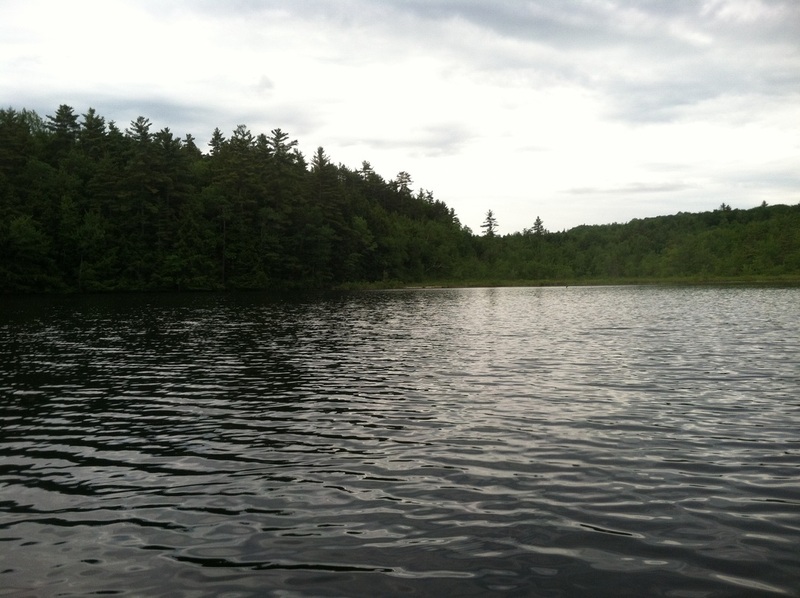 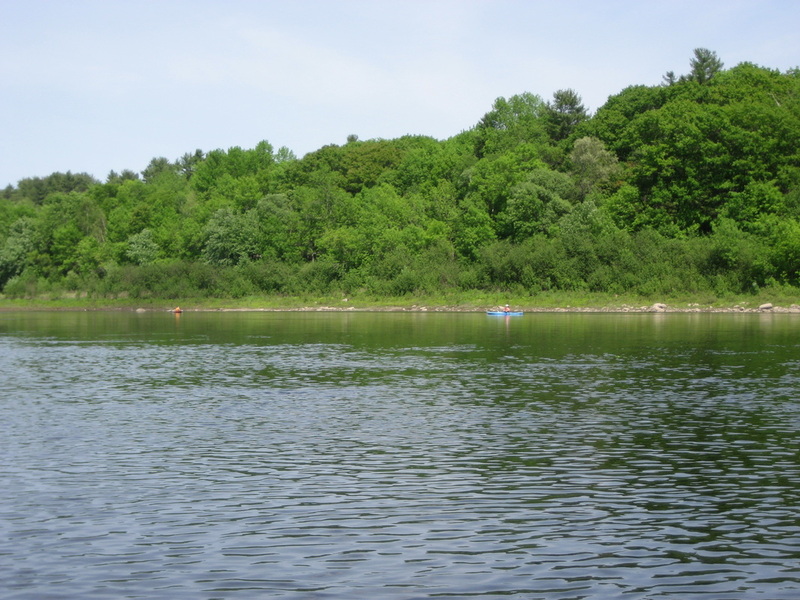 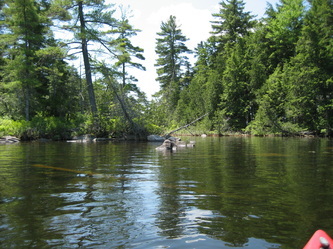 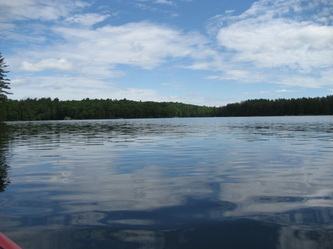 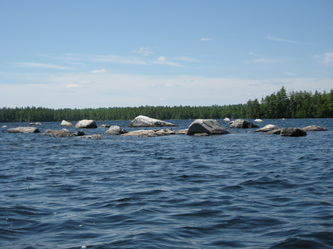 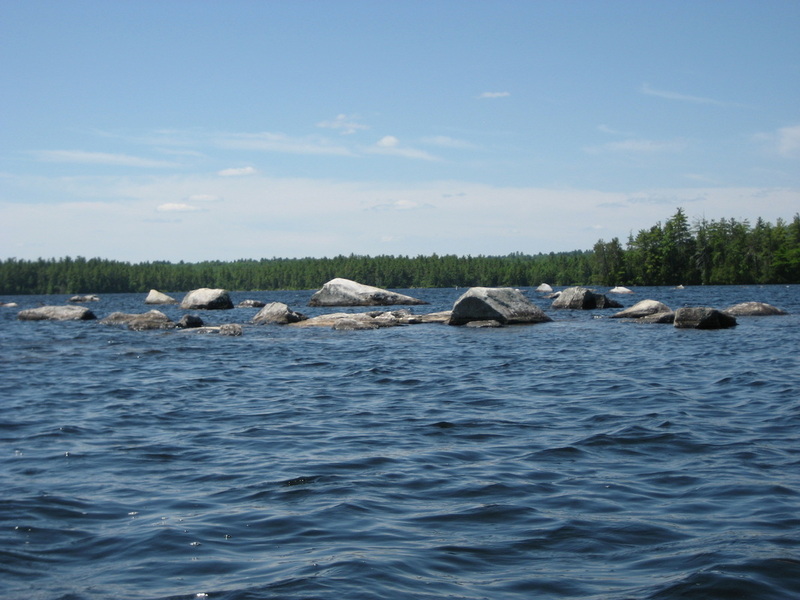 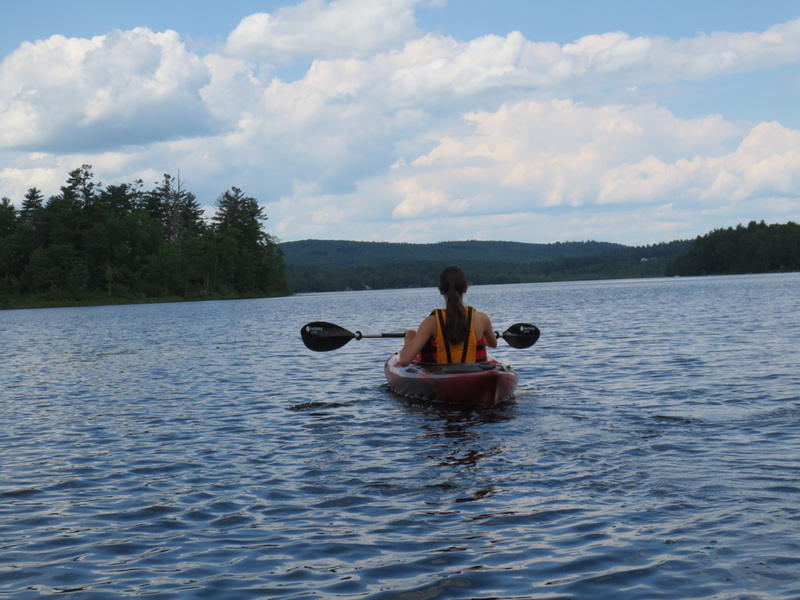 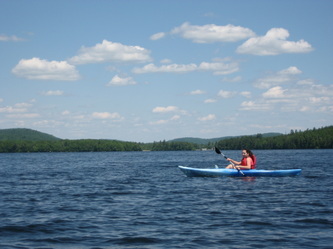 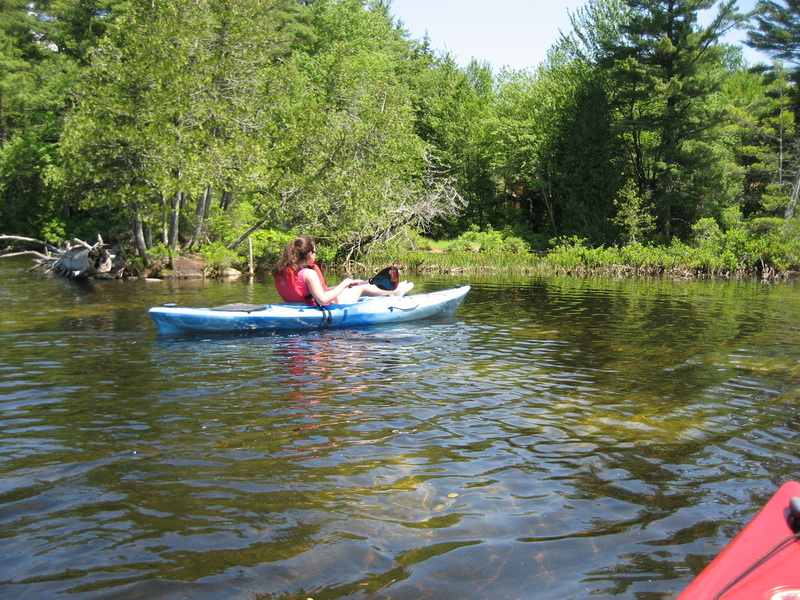 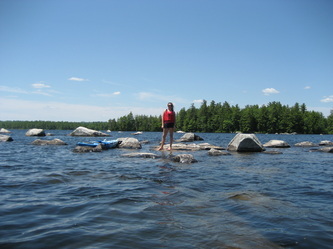 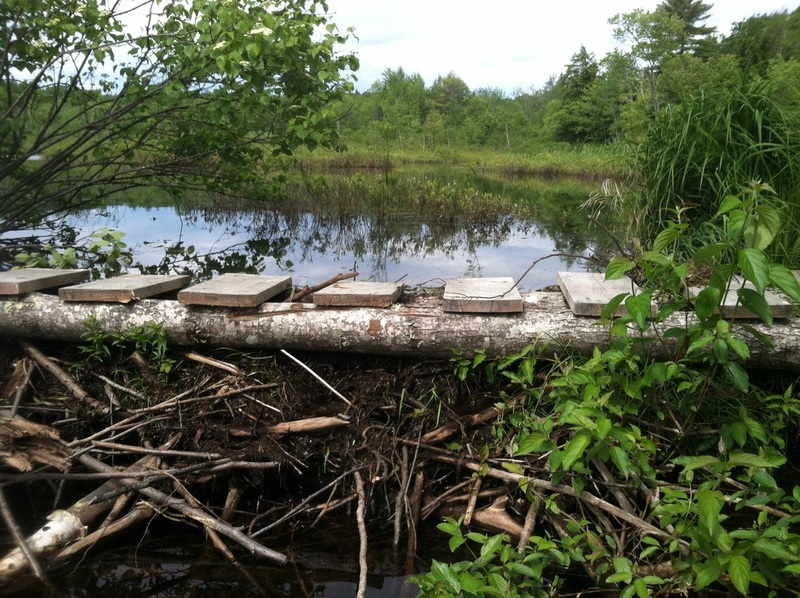 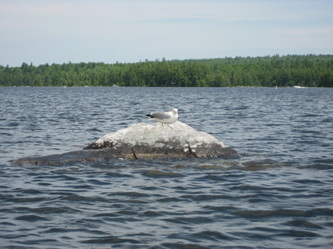 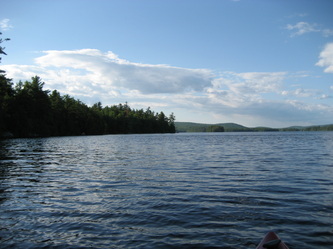 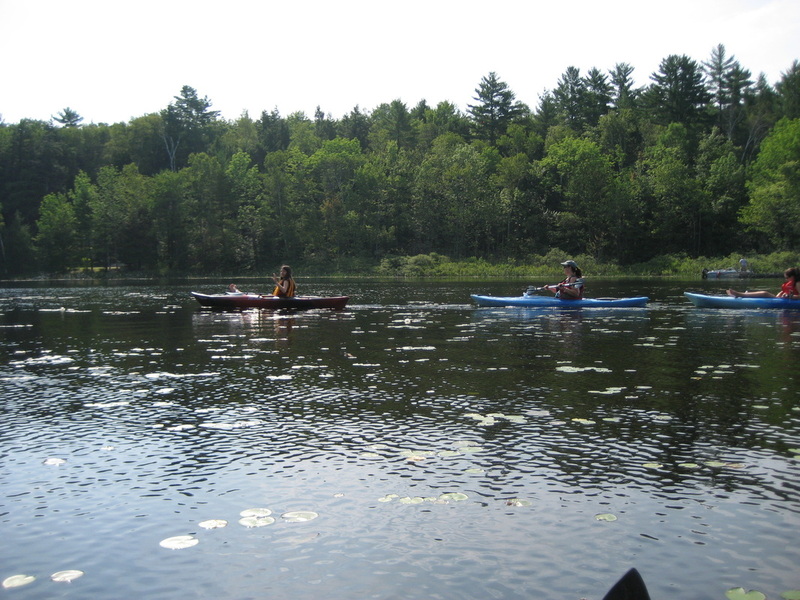 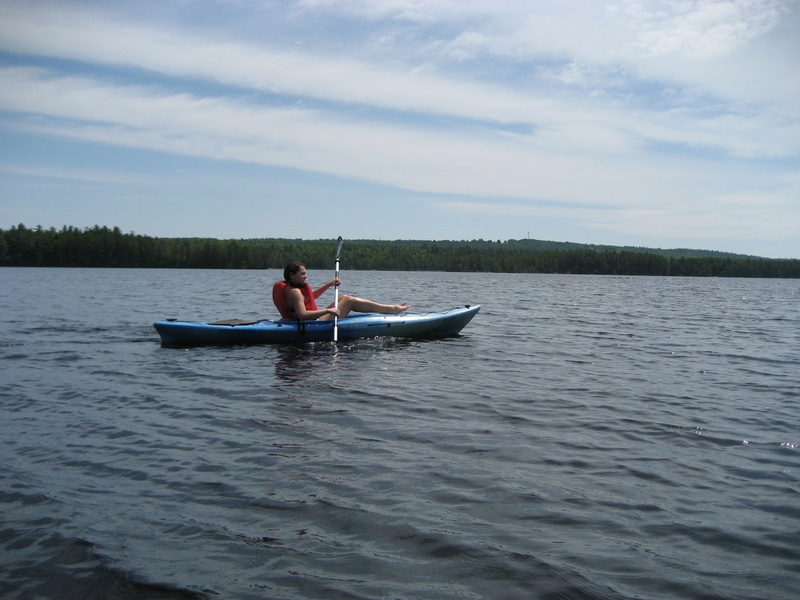 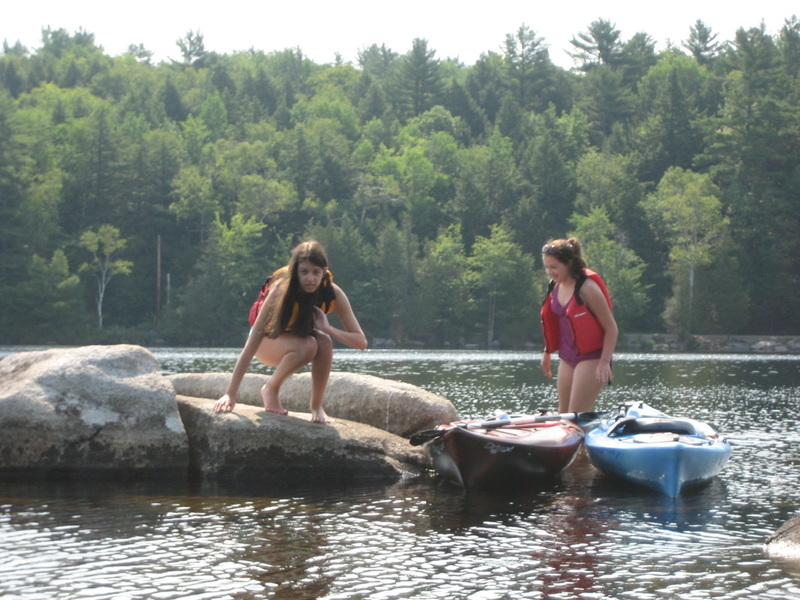 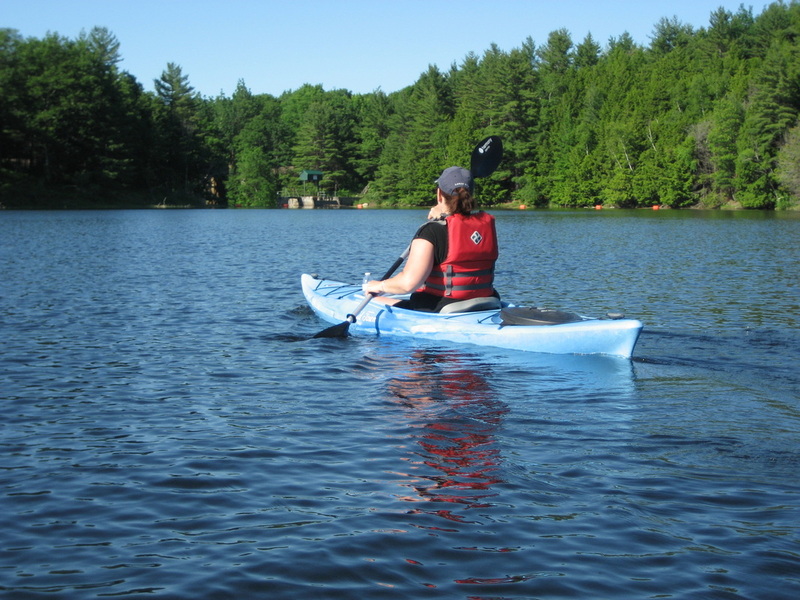 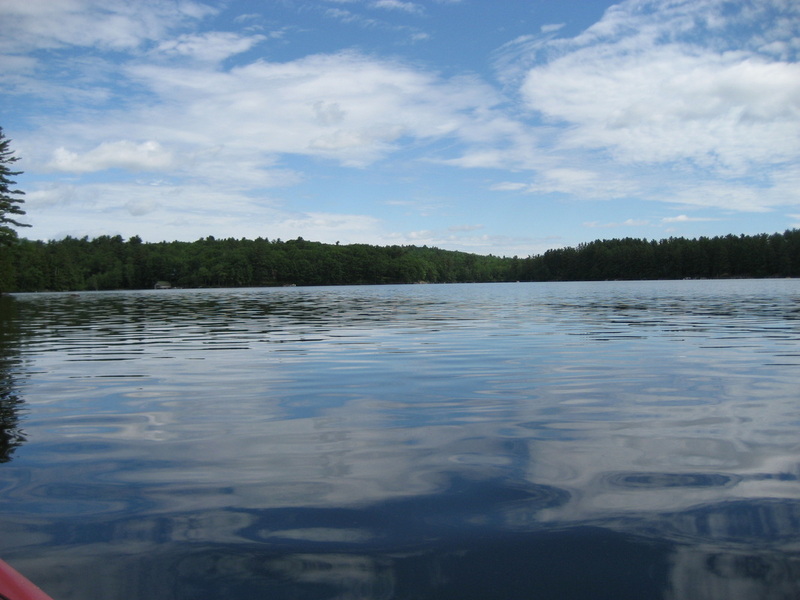 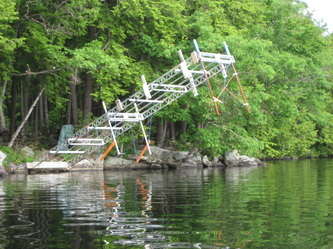 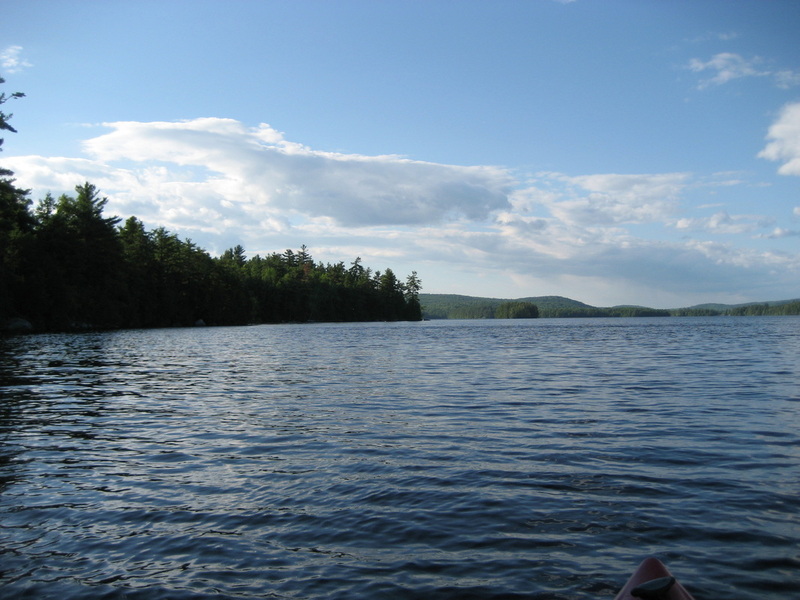 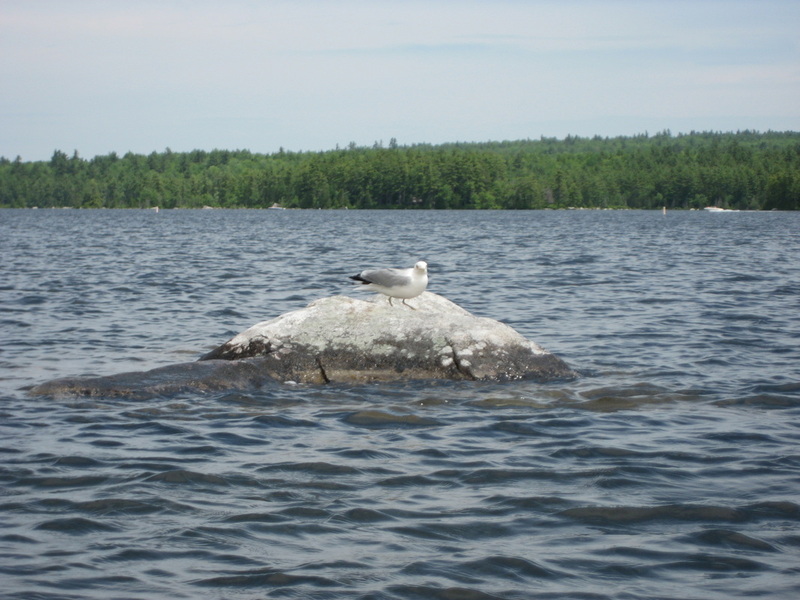 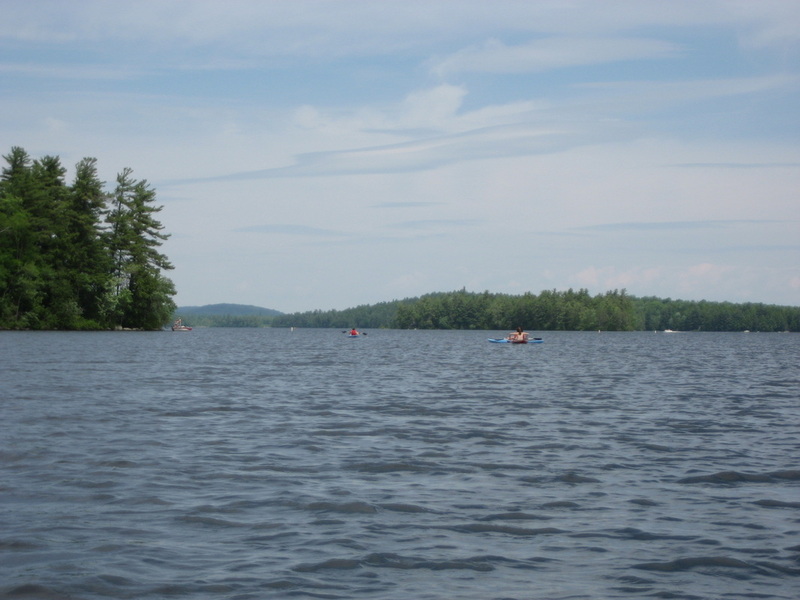 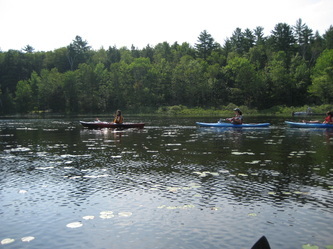 Description: We spent a week at Long Pond to decelerate from the school year. It's been a crazy weather year so far, and this was the first time we got the boats in the water. Much later than last year. 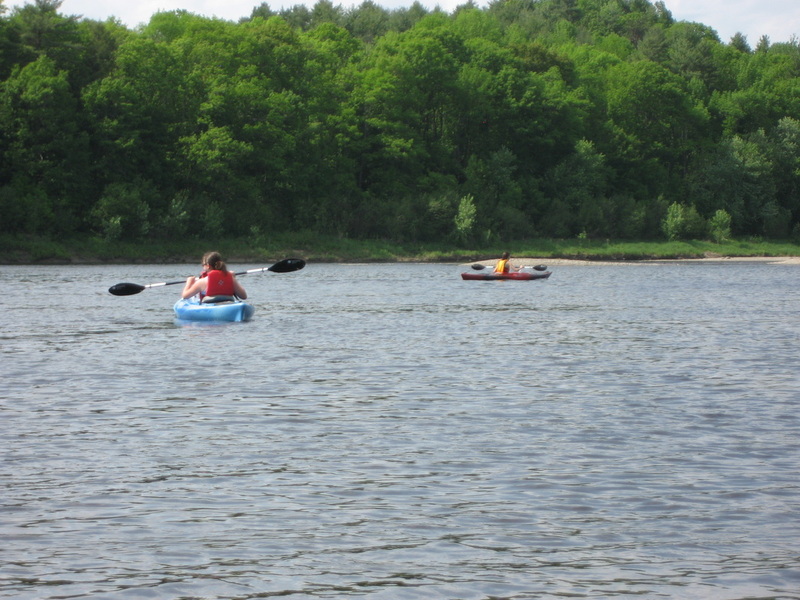 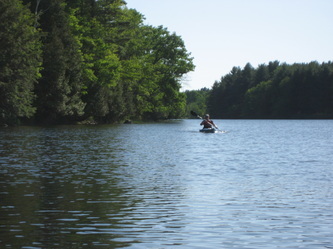 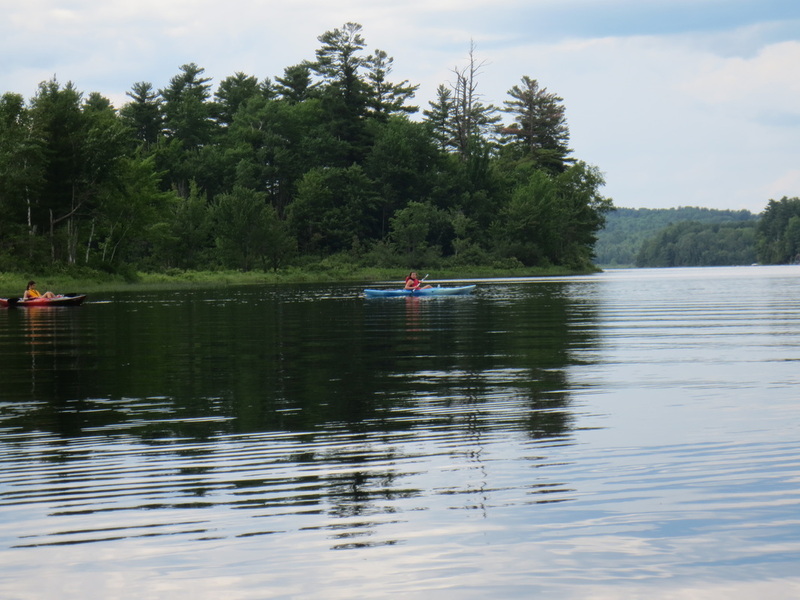 Some combination of family members managed to get out in the kayaks each day, exploring different areas of the lake. 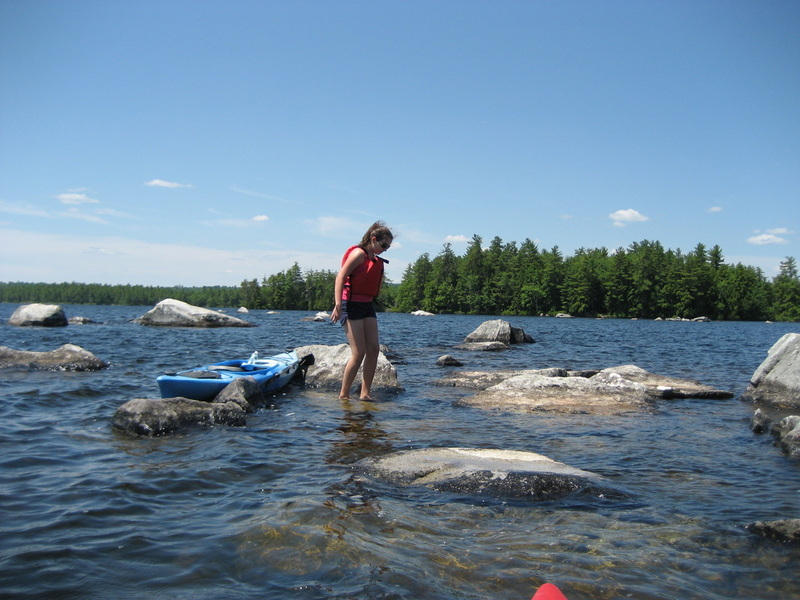 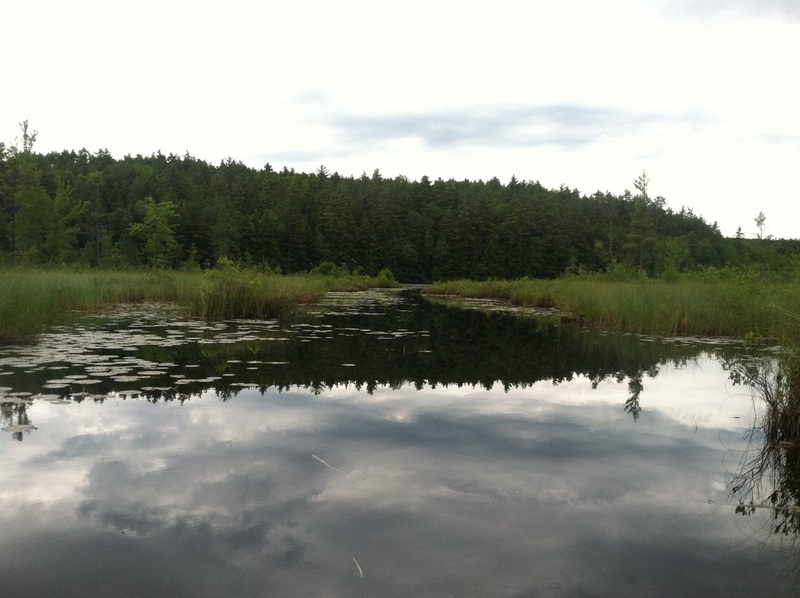 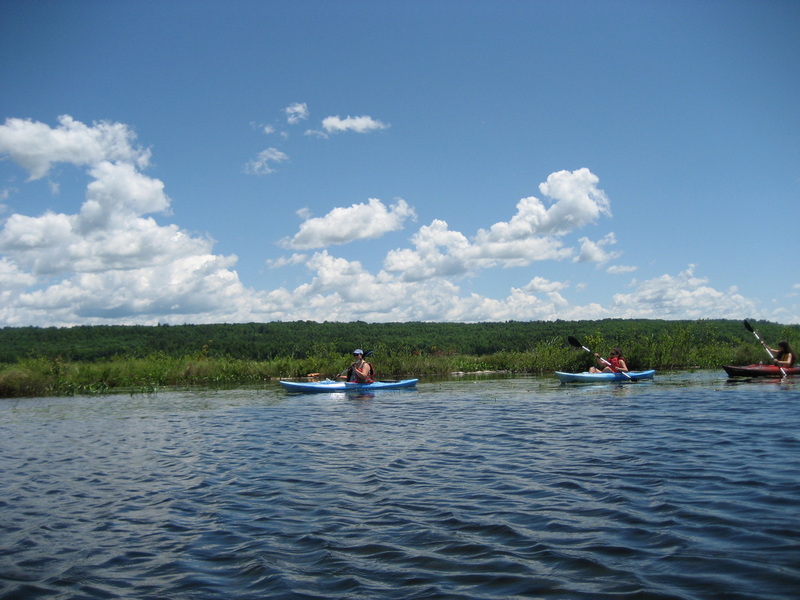 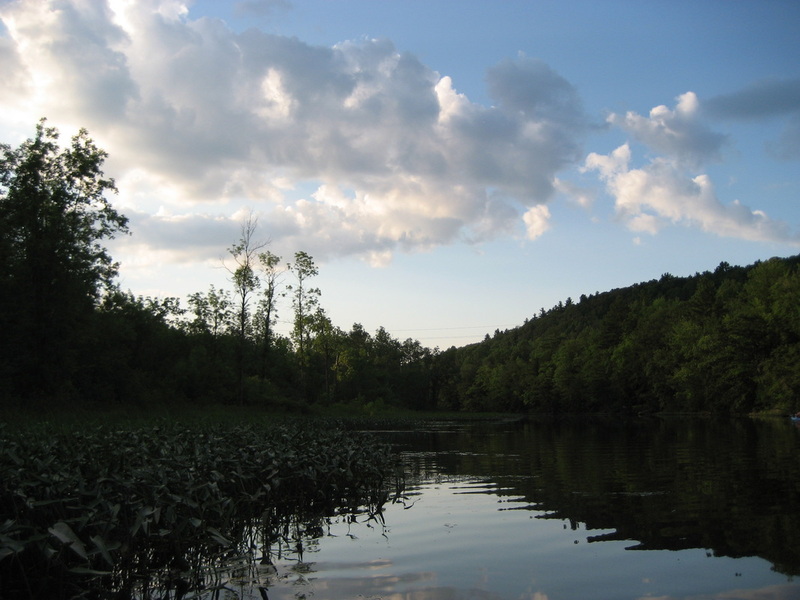 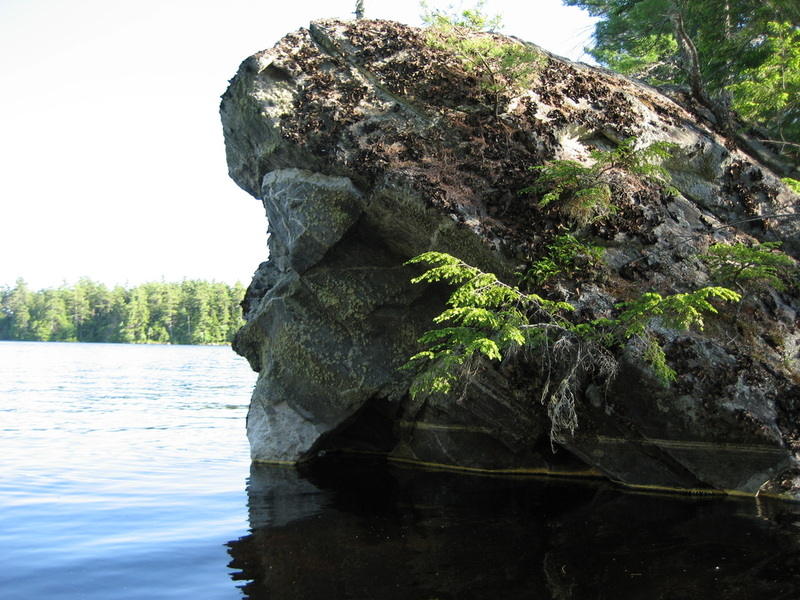 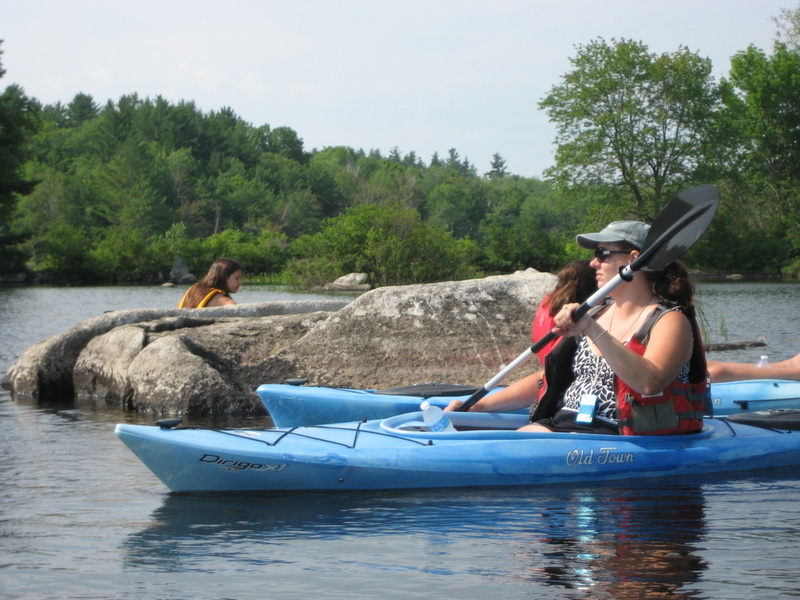 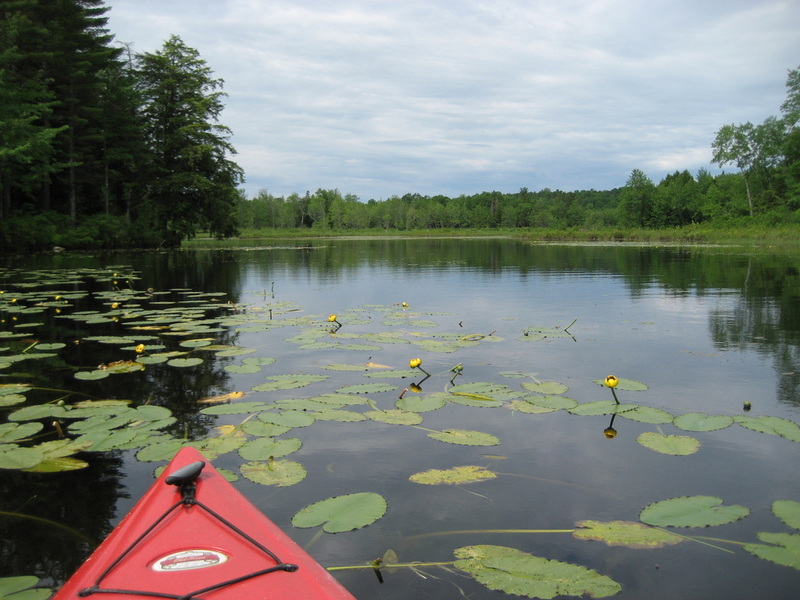 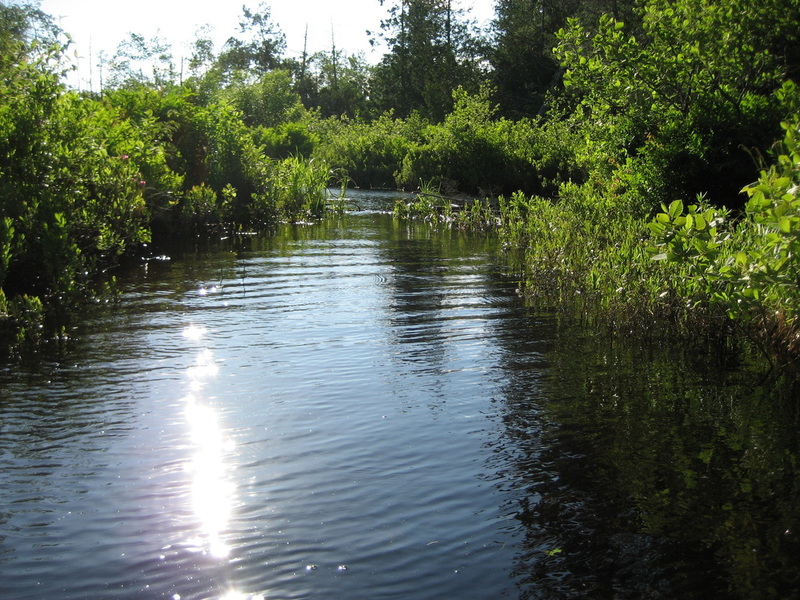 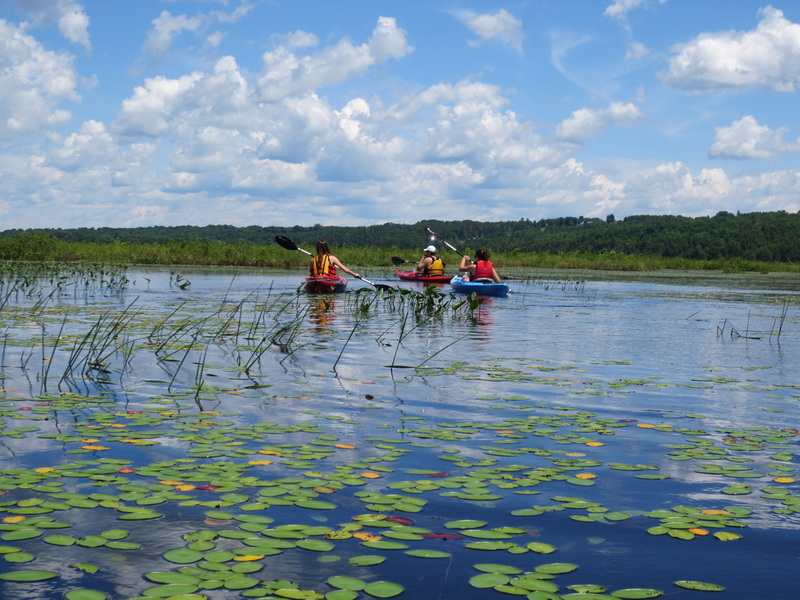 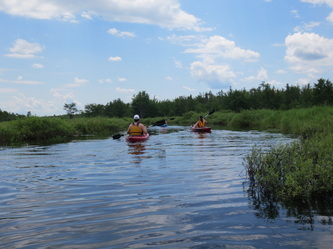 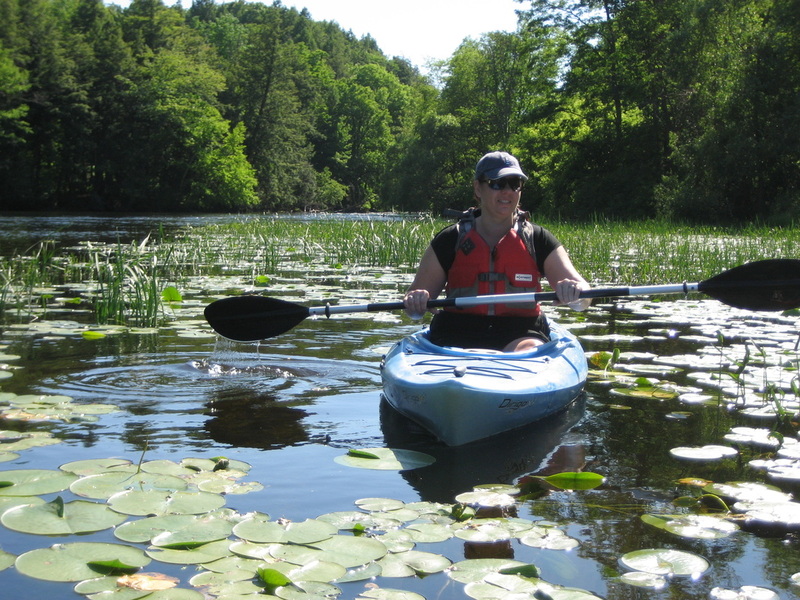 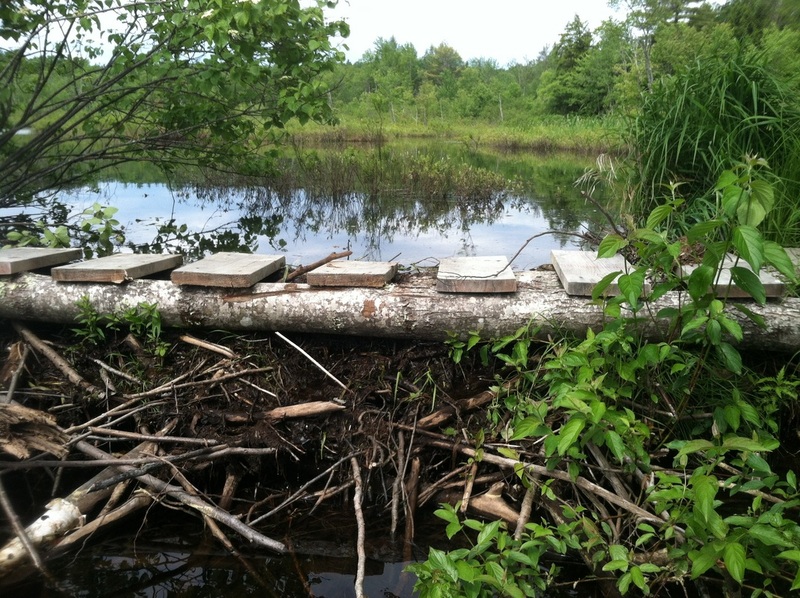 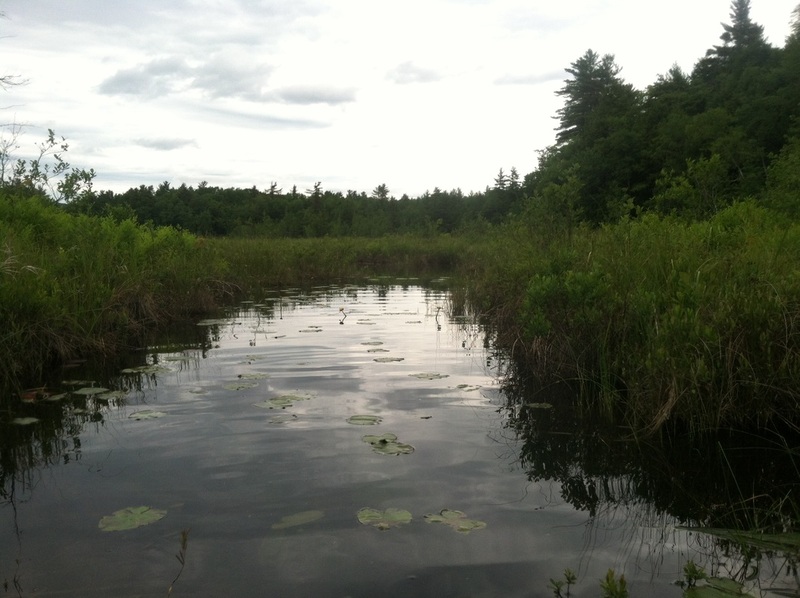 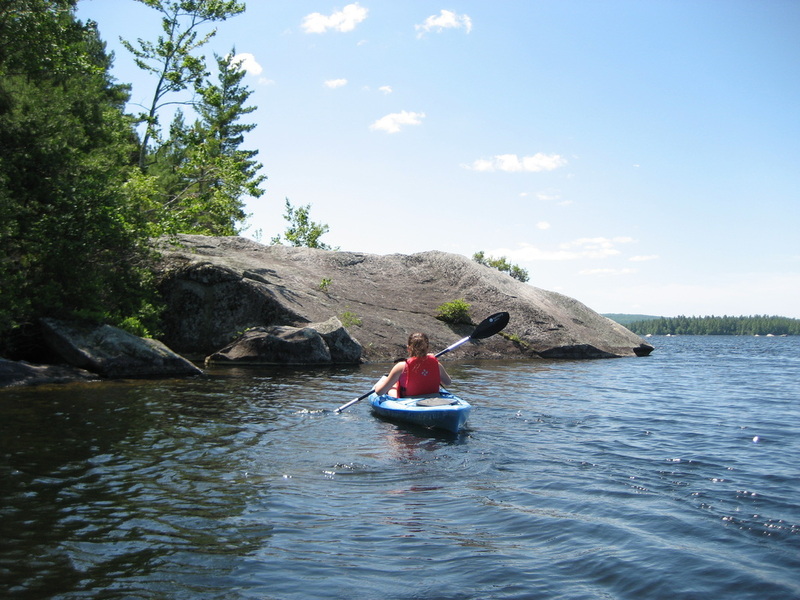 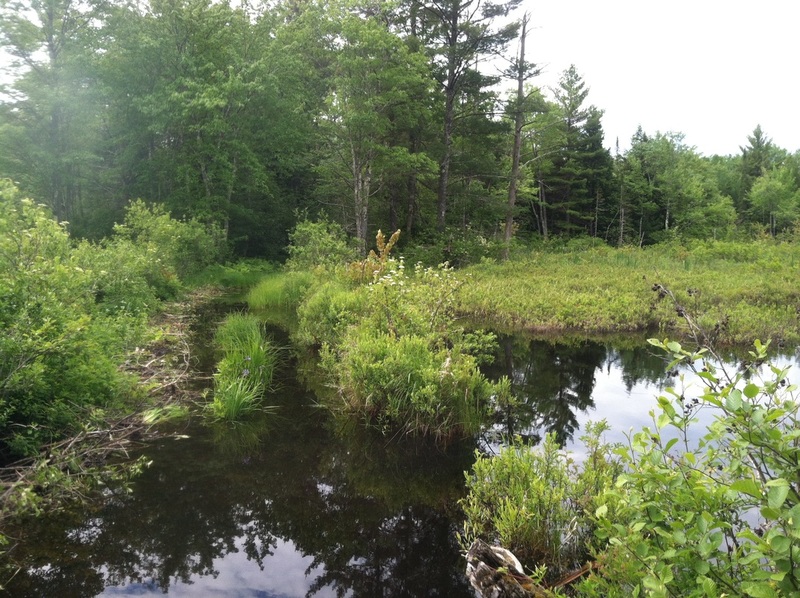 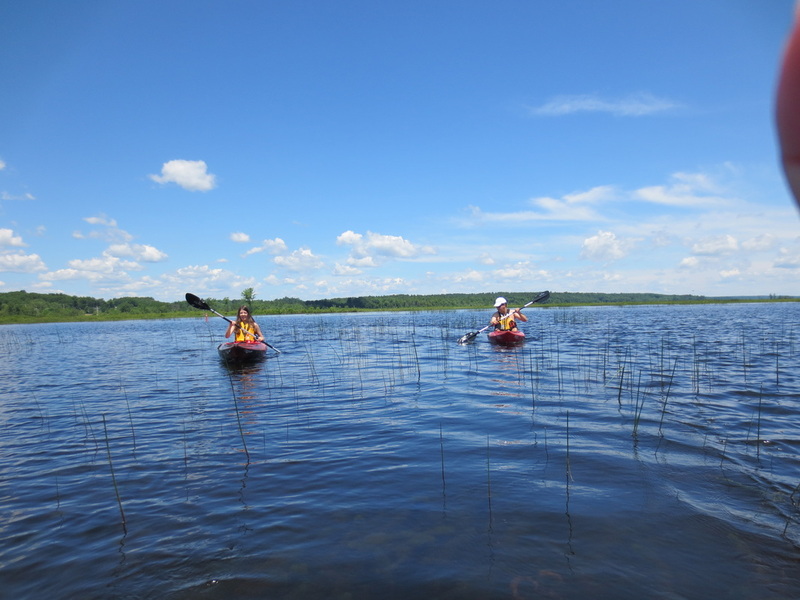 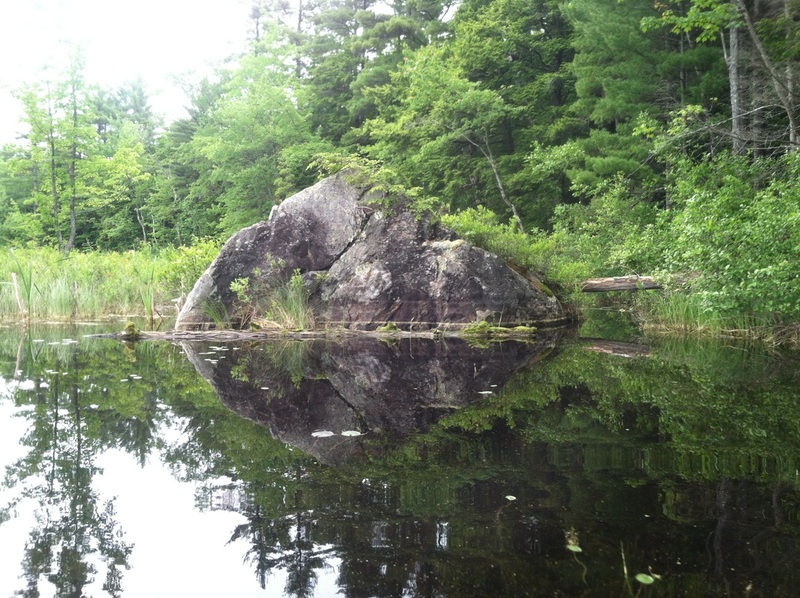 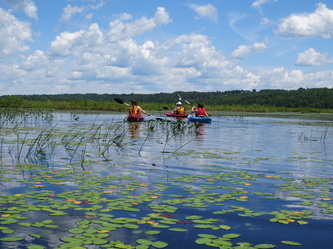 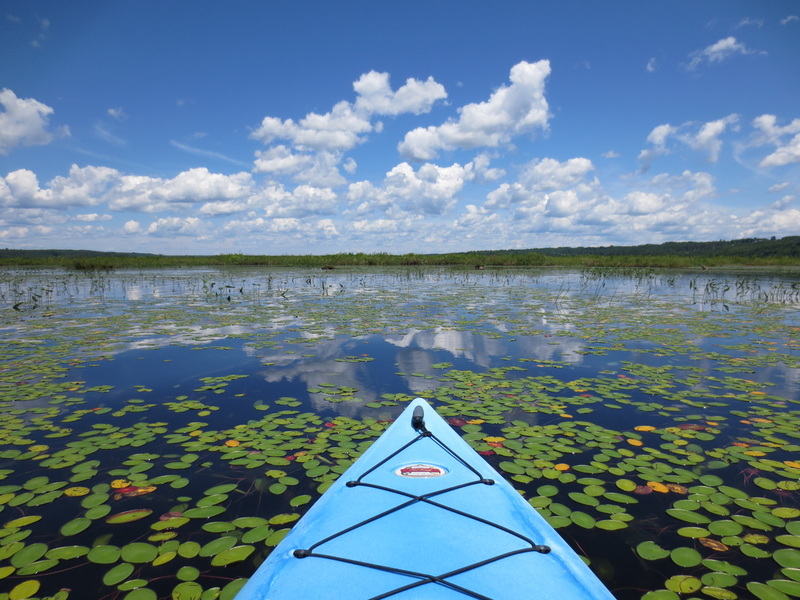 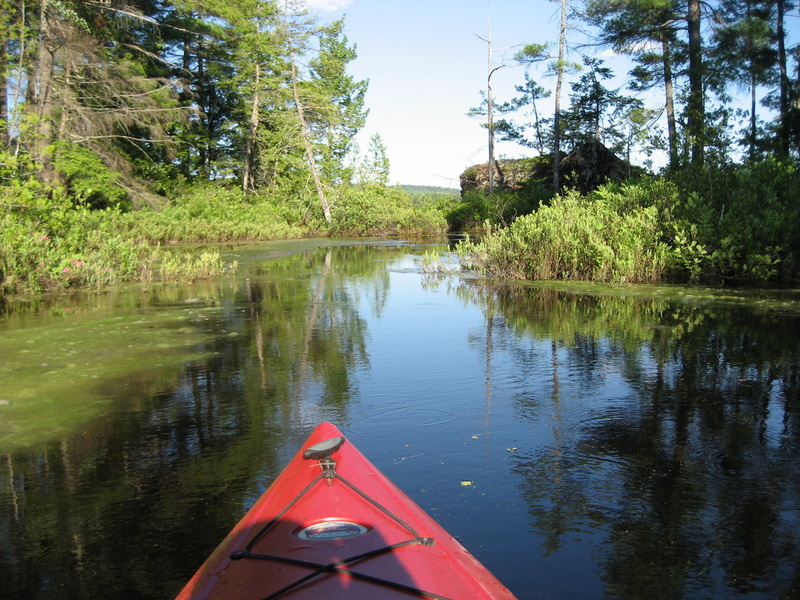 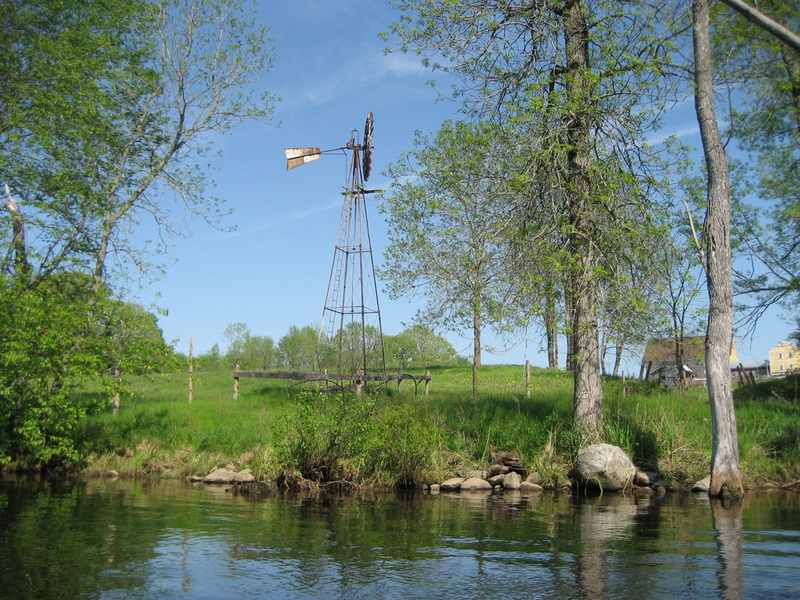 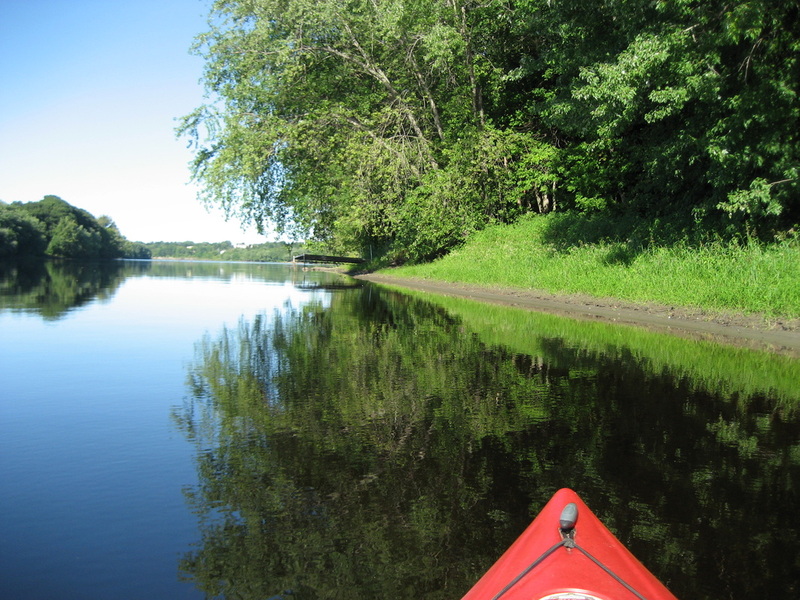 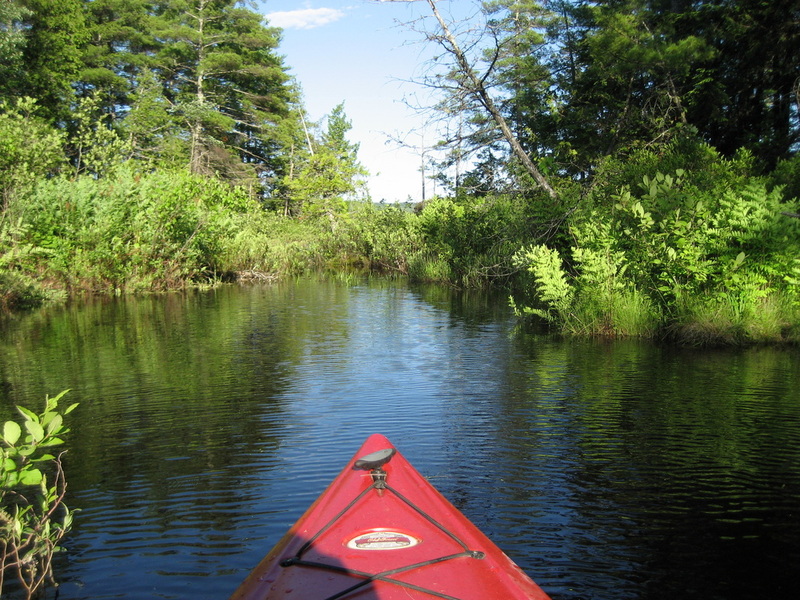 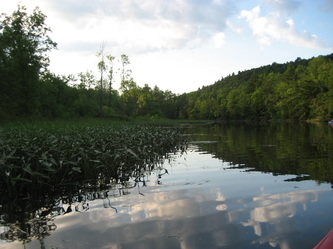 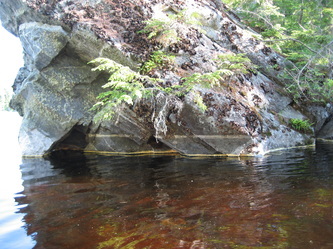 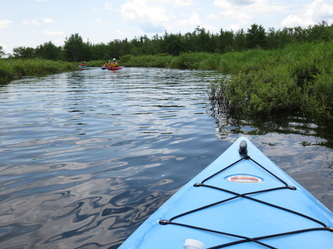 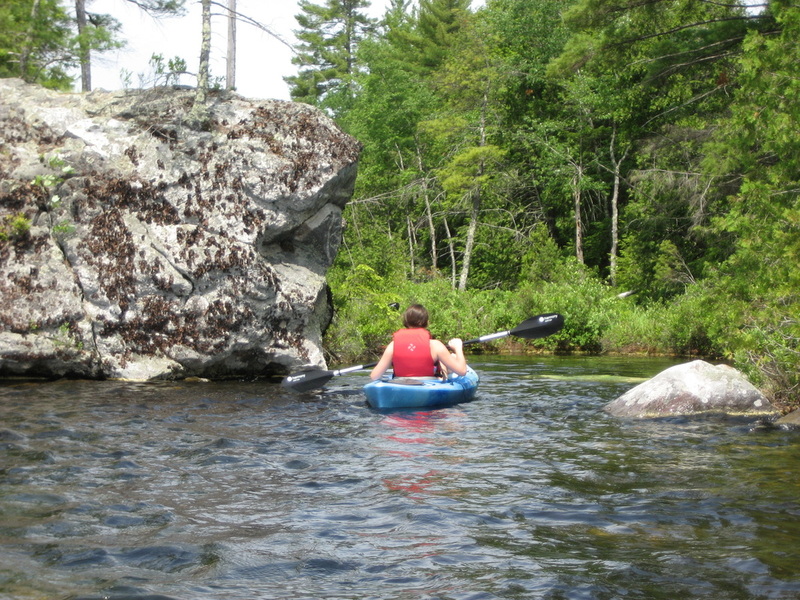 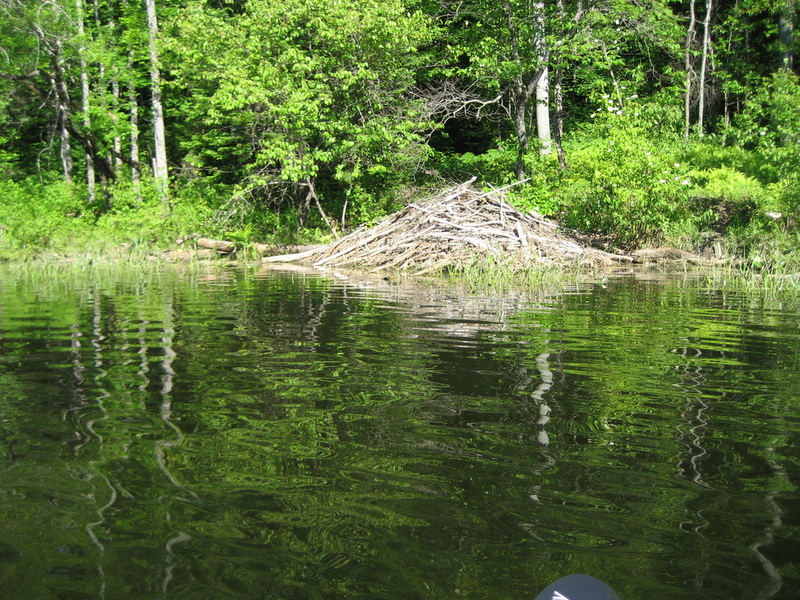 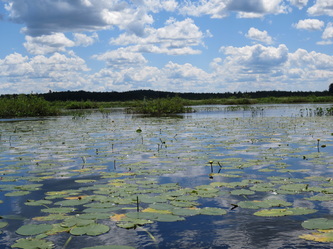 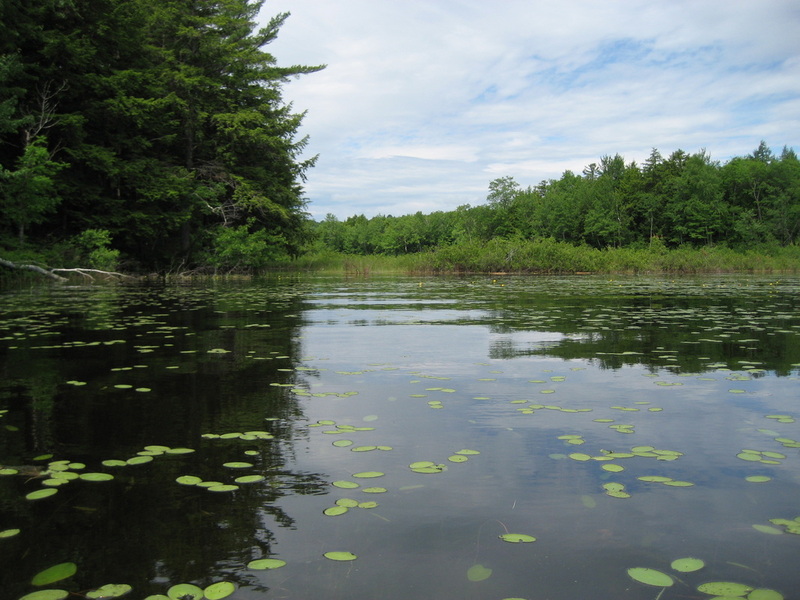 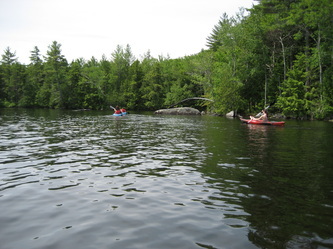 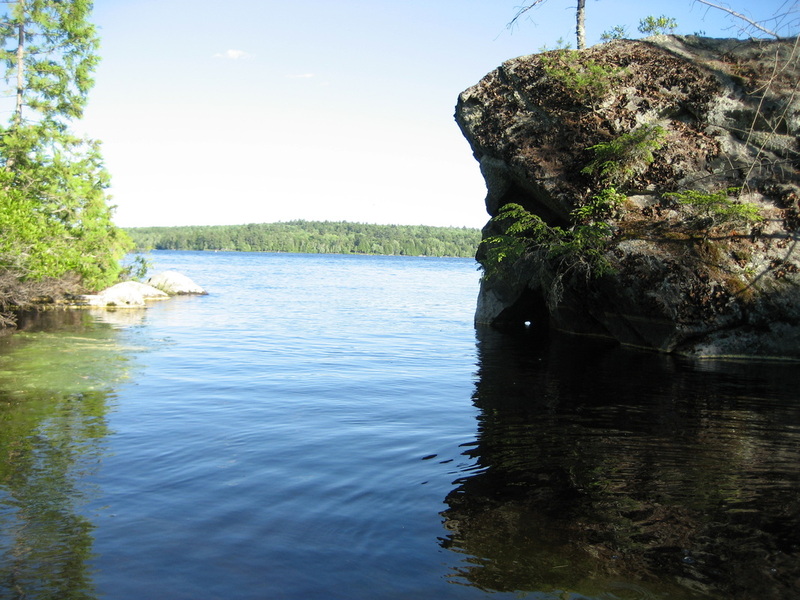 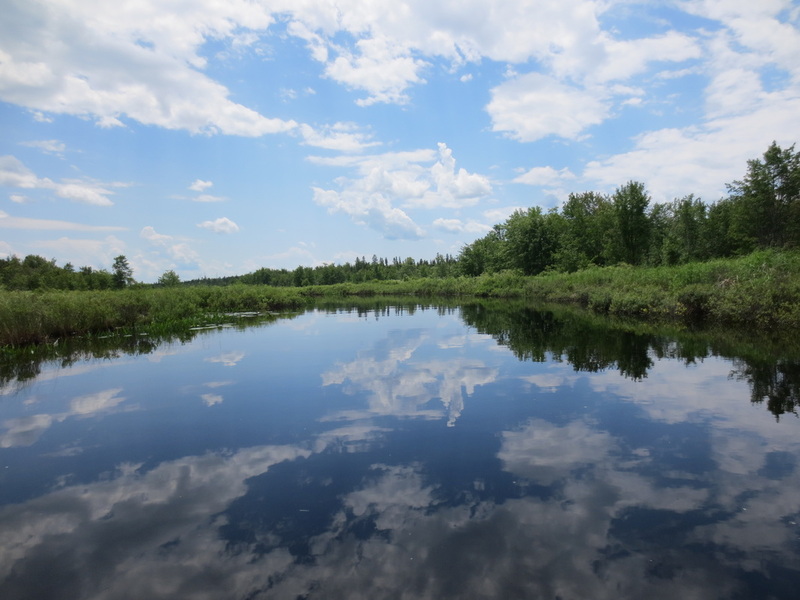 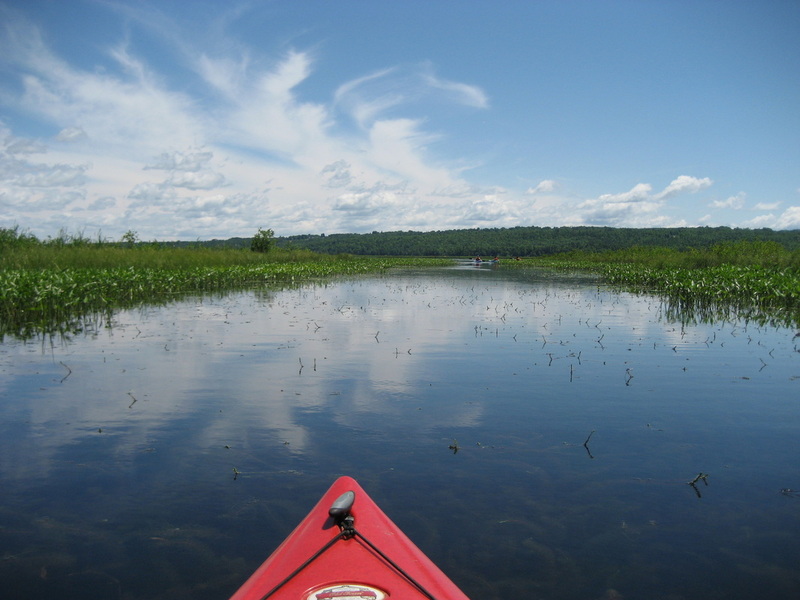 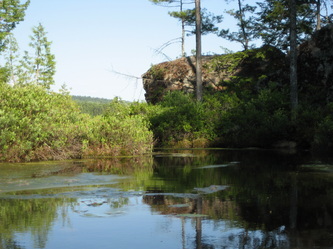 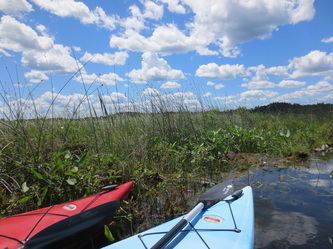 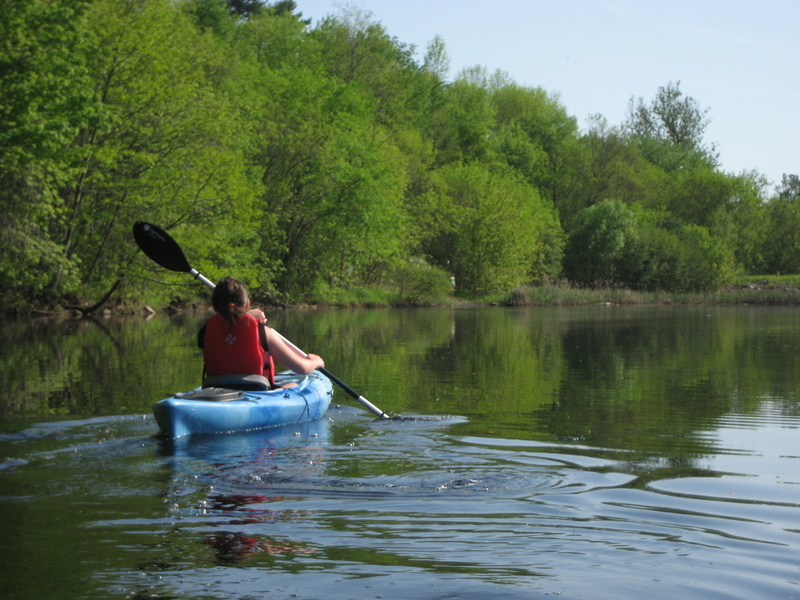 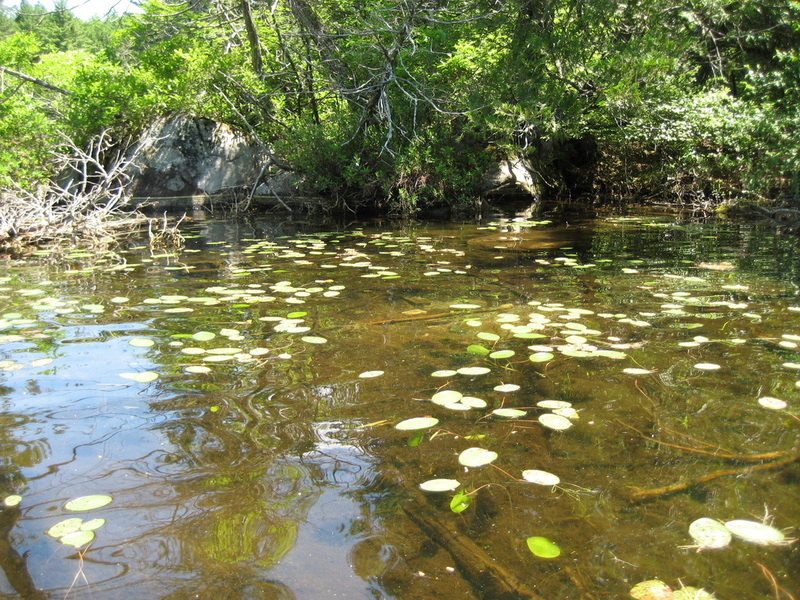 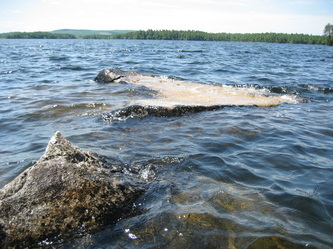 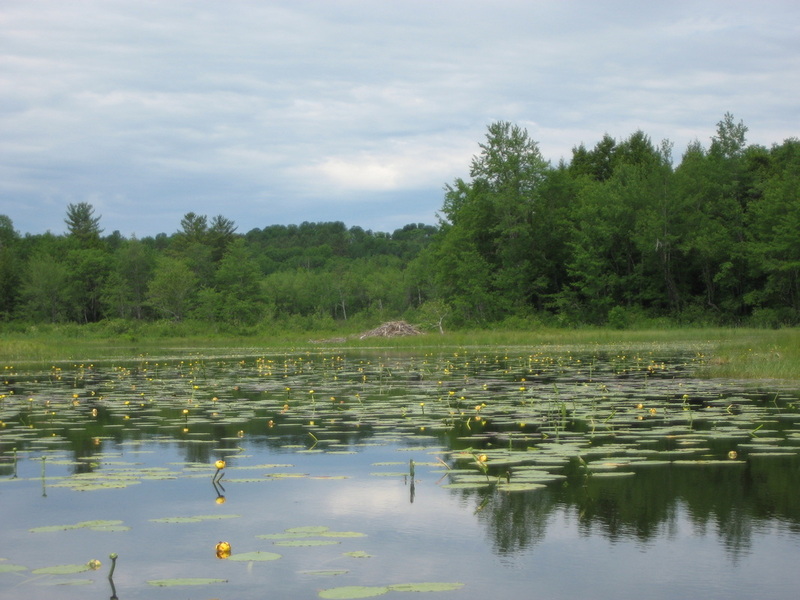 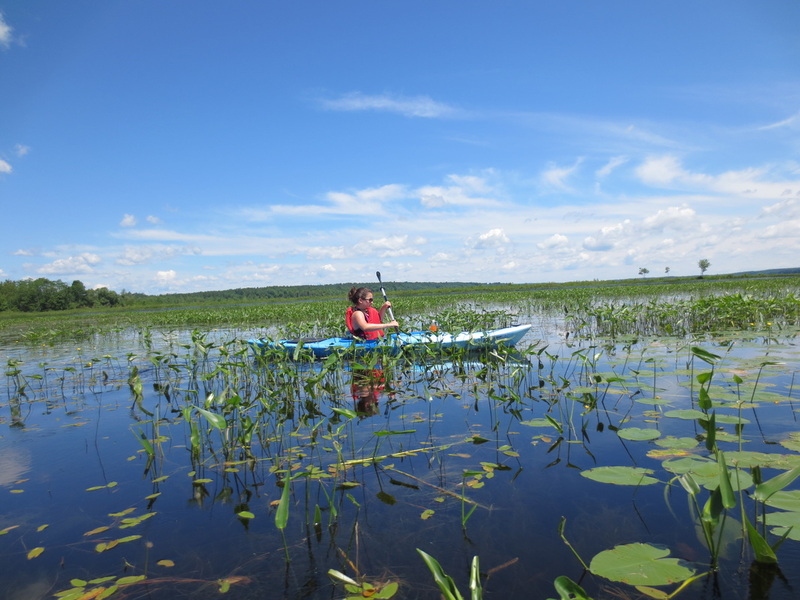 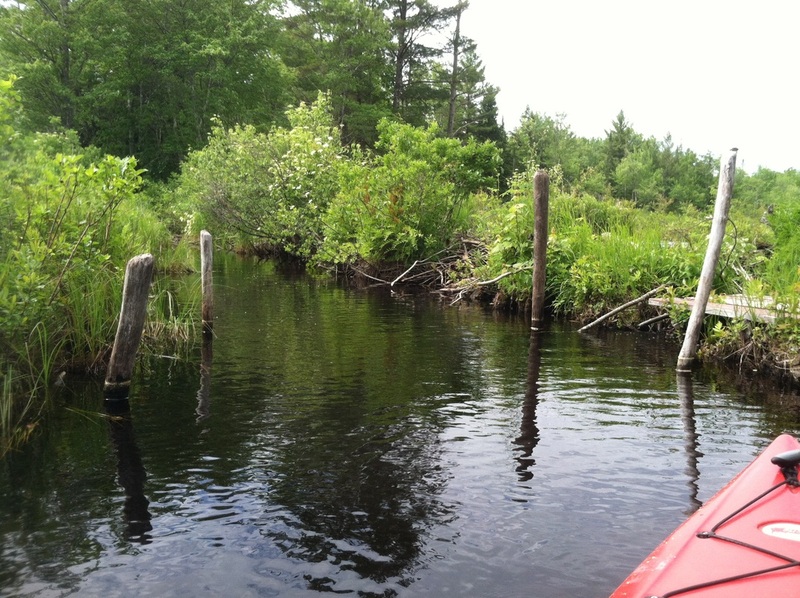 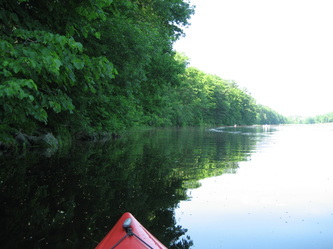 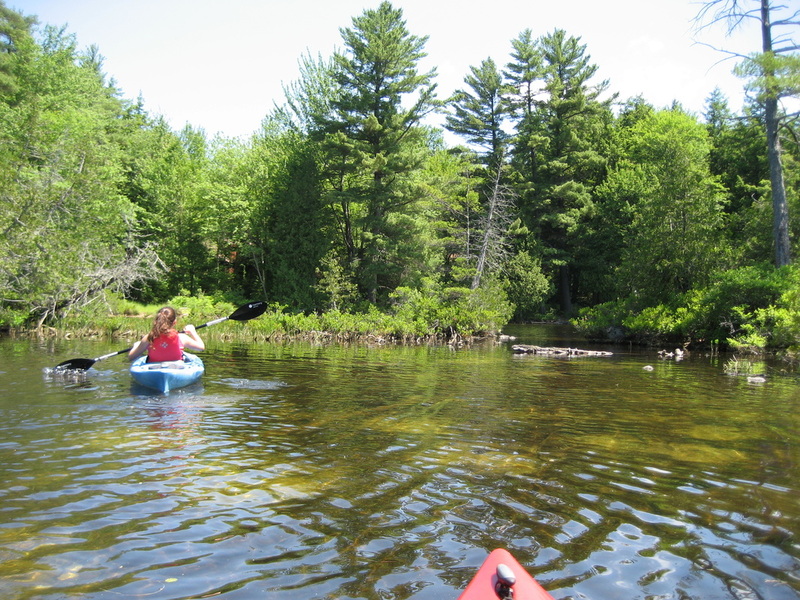 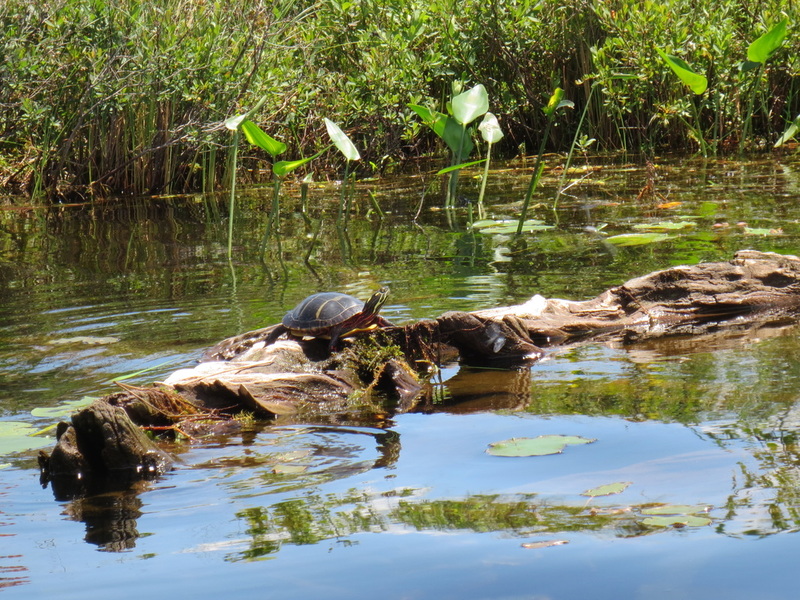 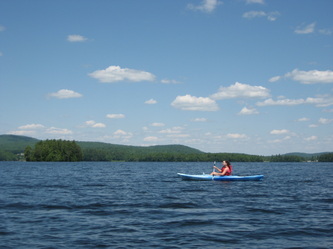 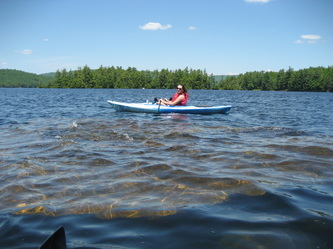 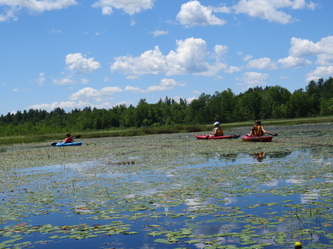 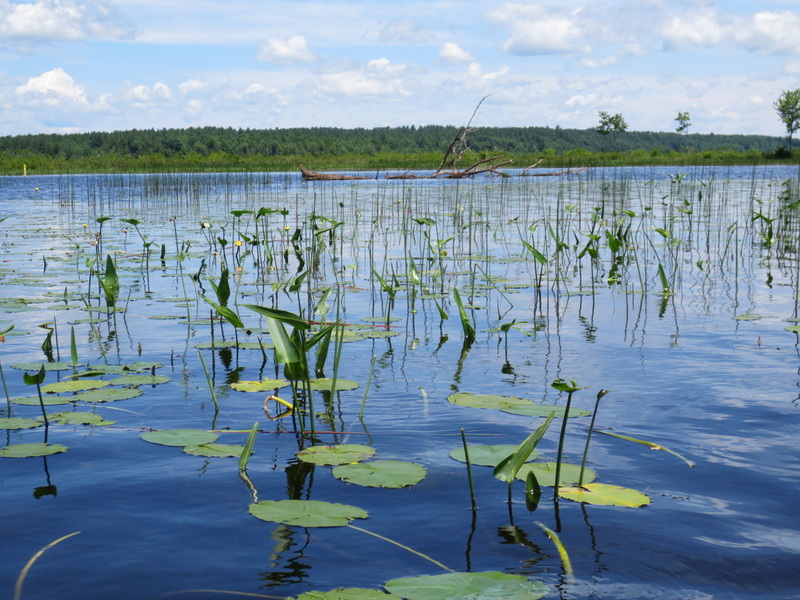 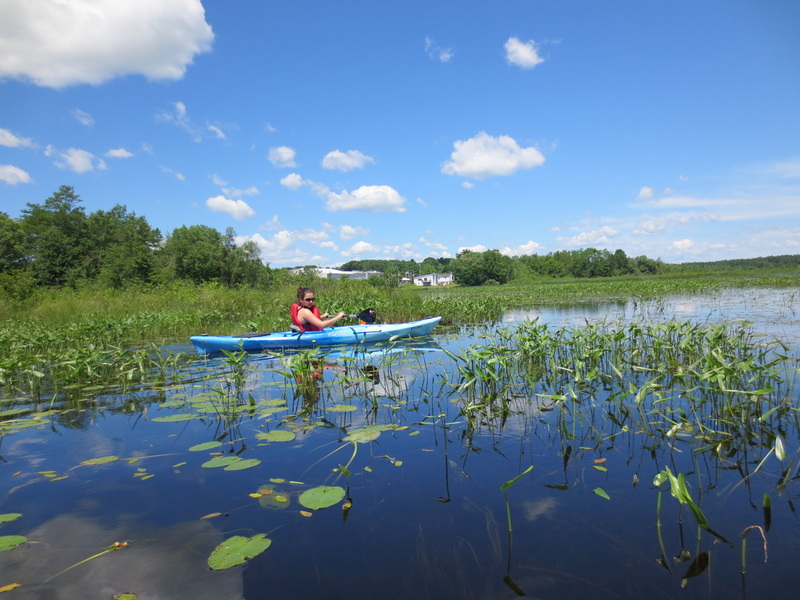 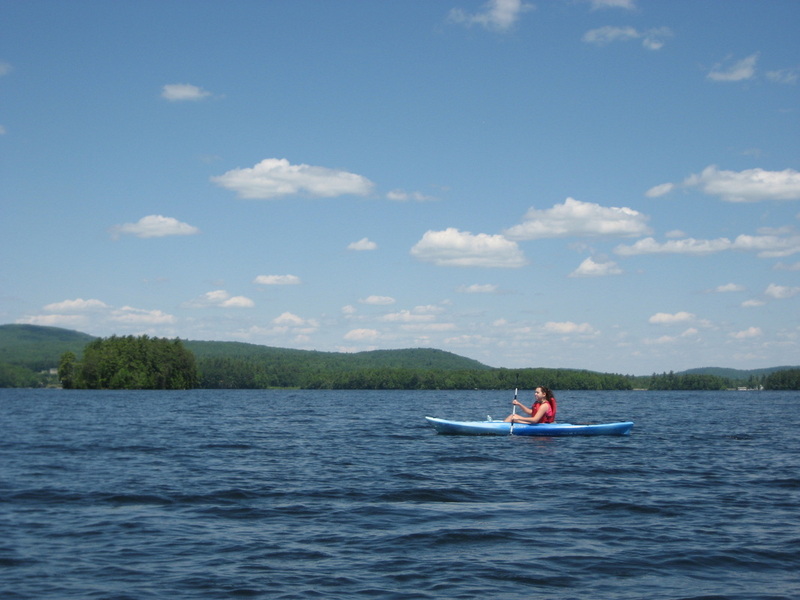 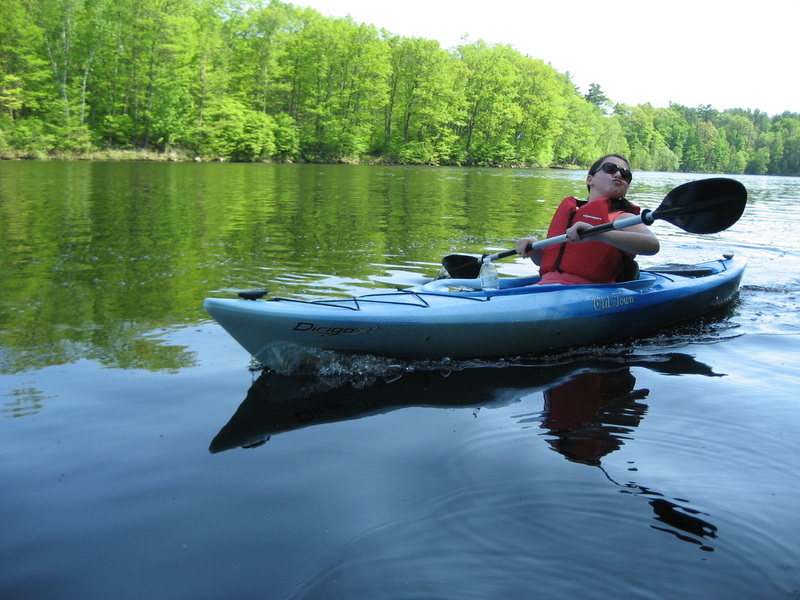 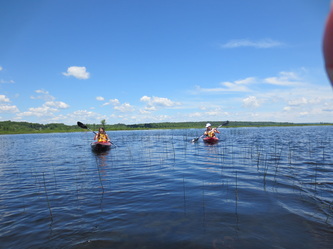 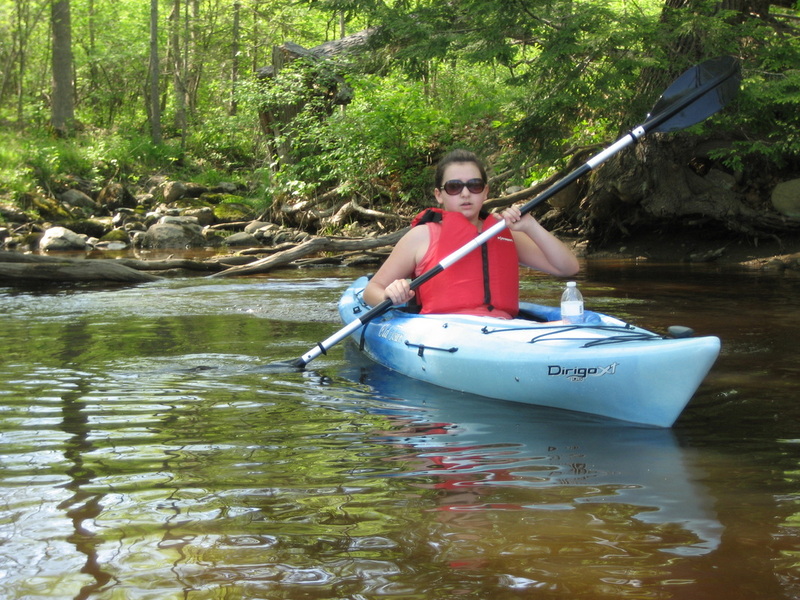 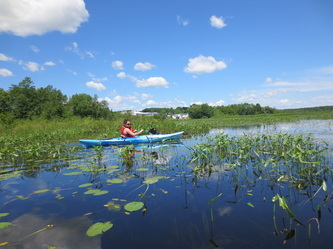 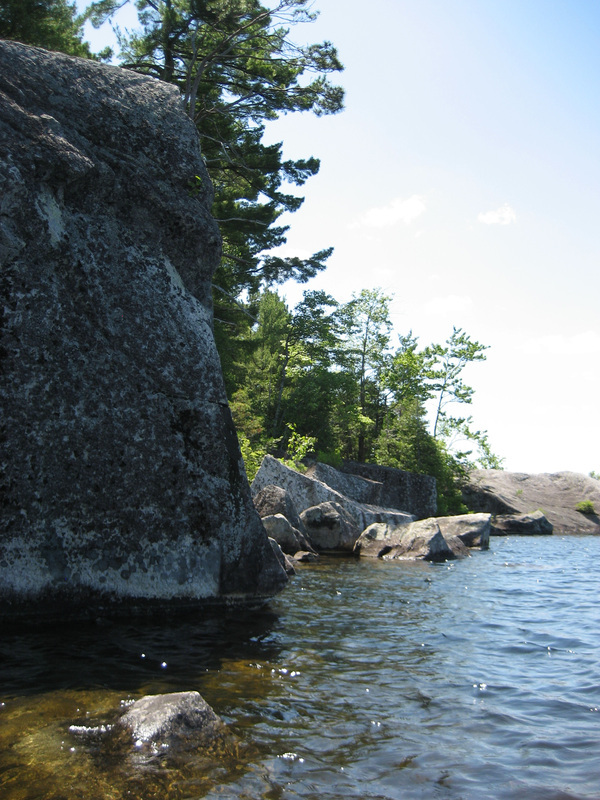 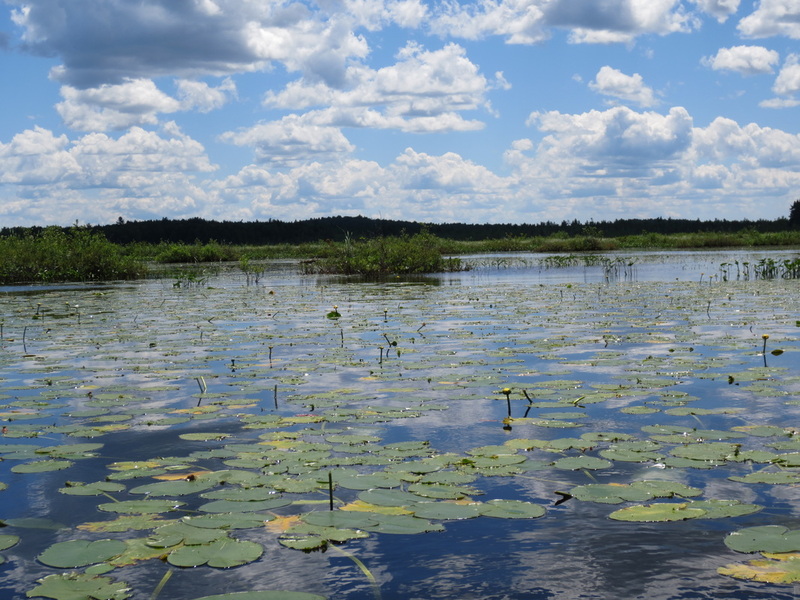 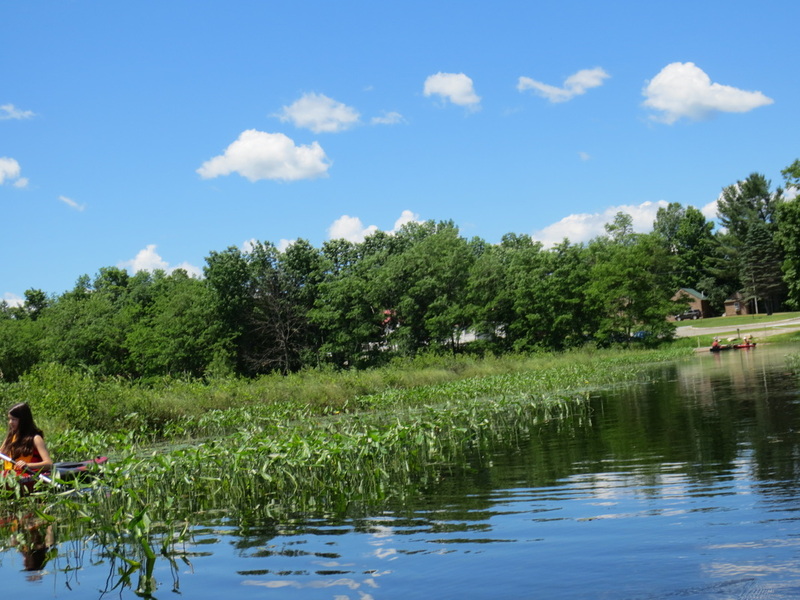 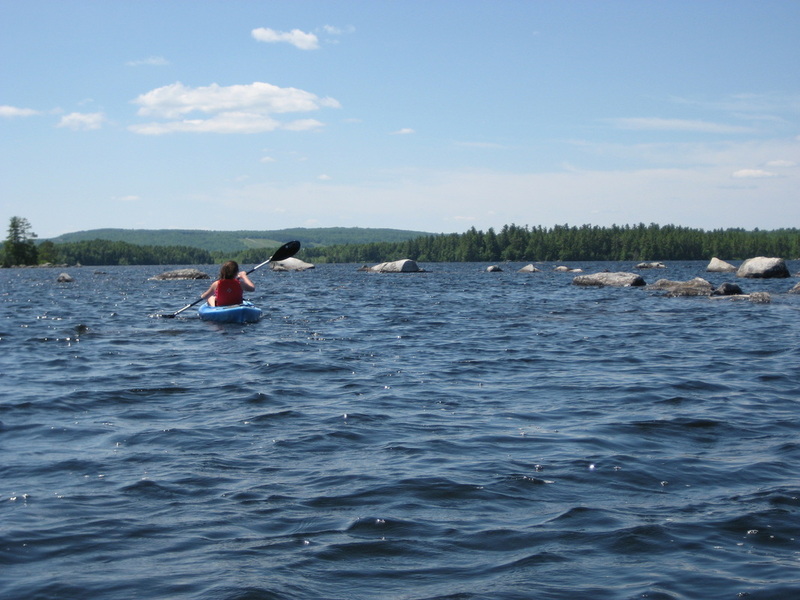 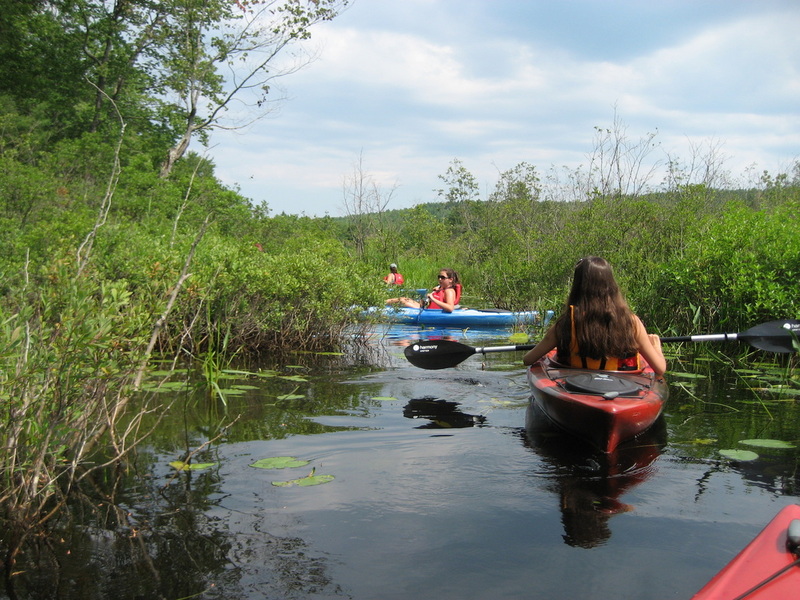 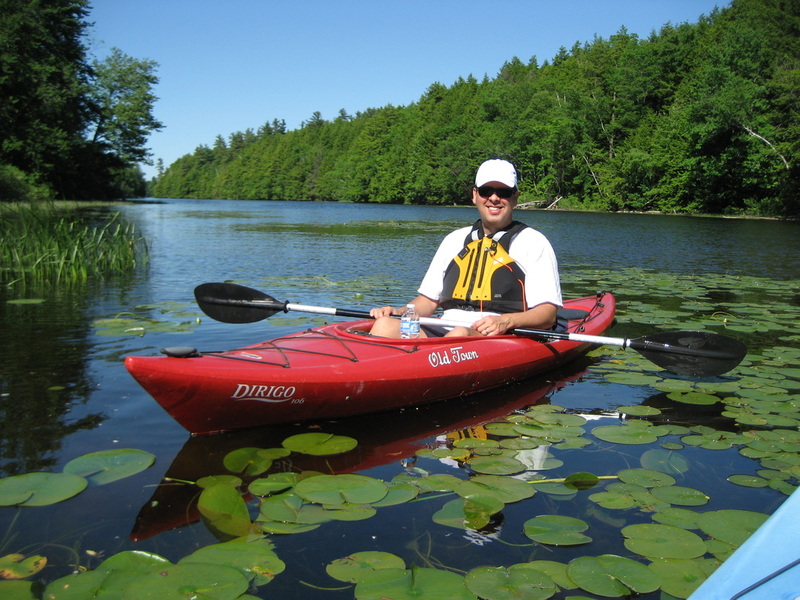 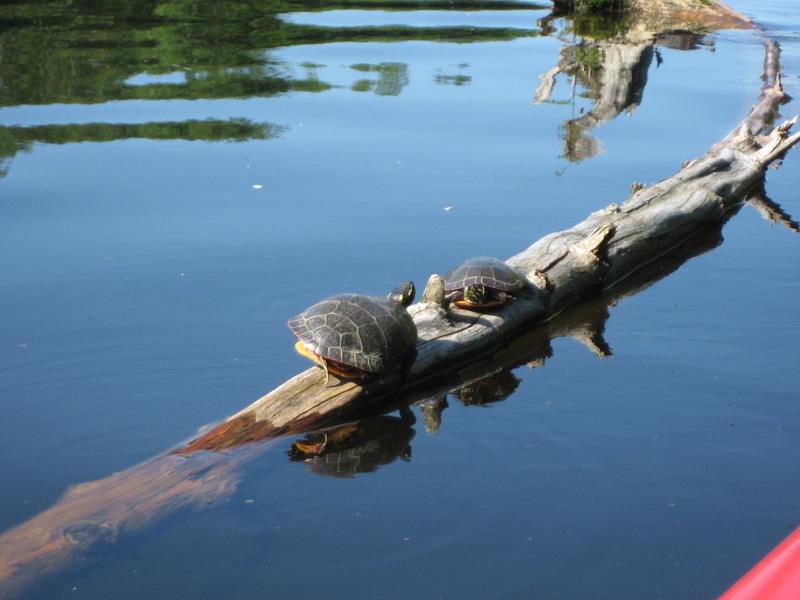 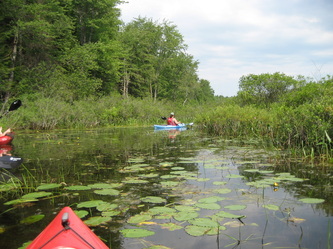 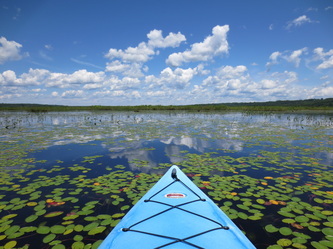 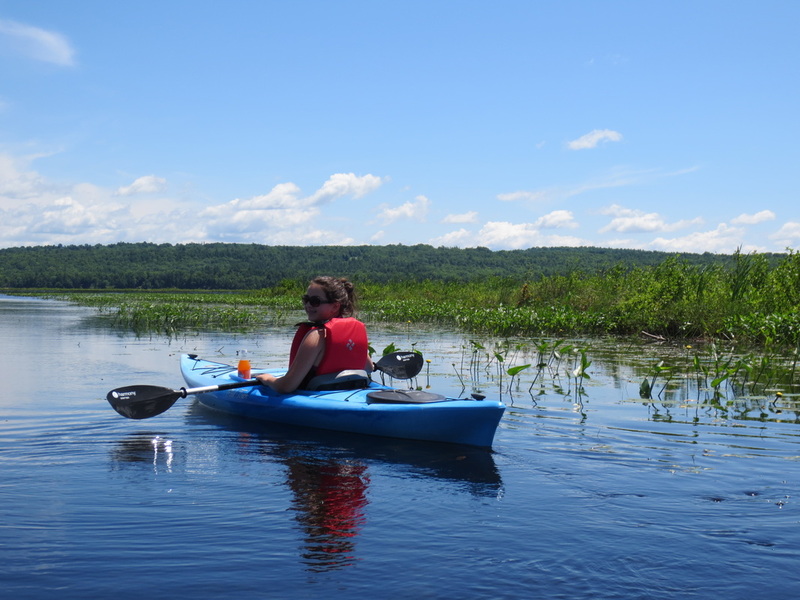 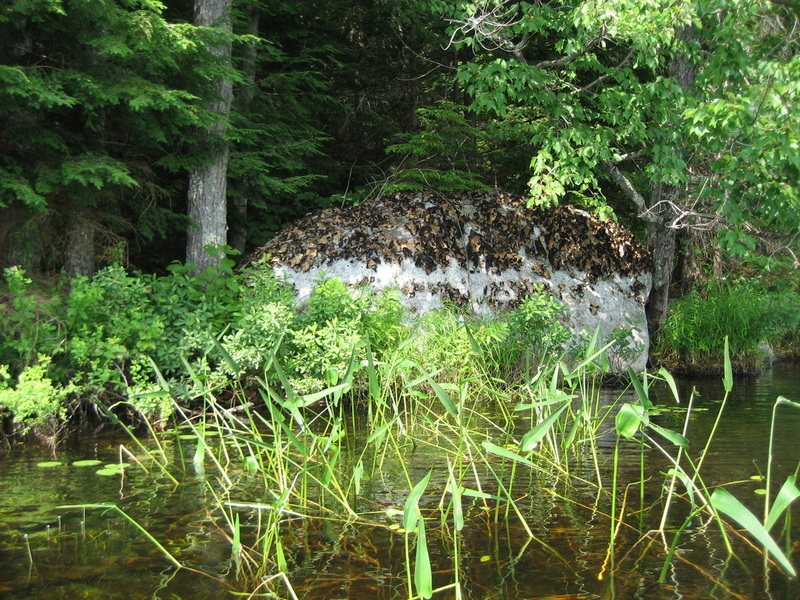 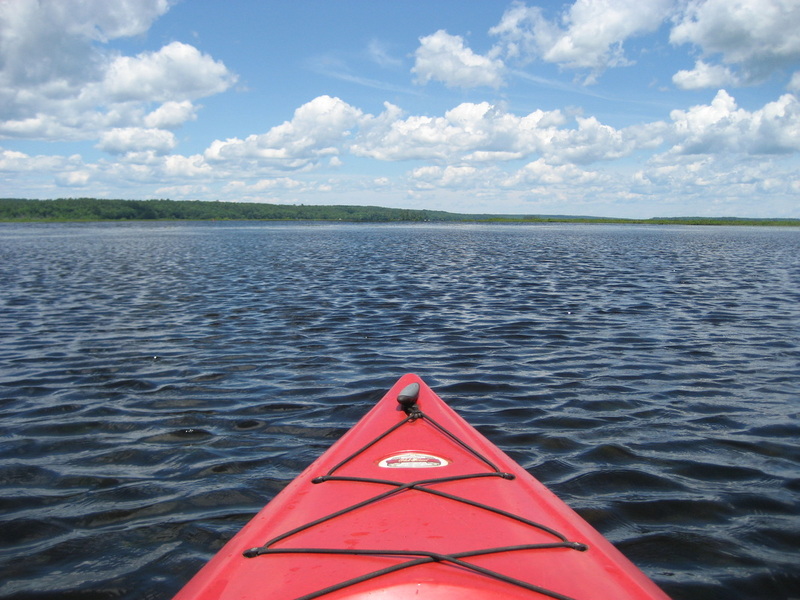 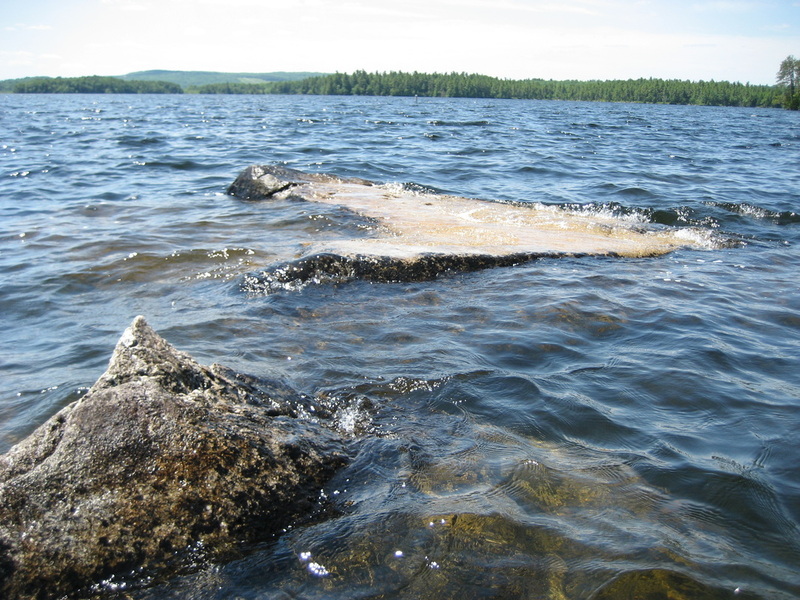 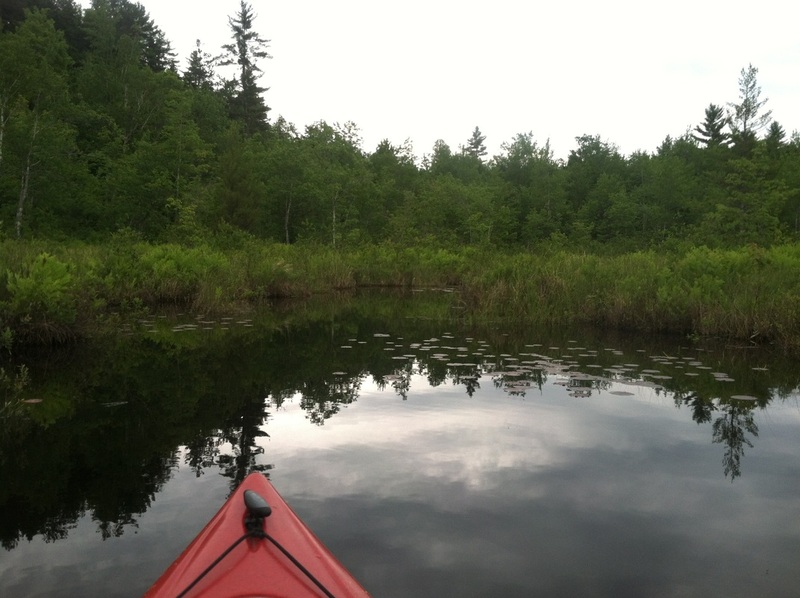 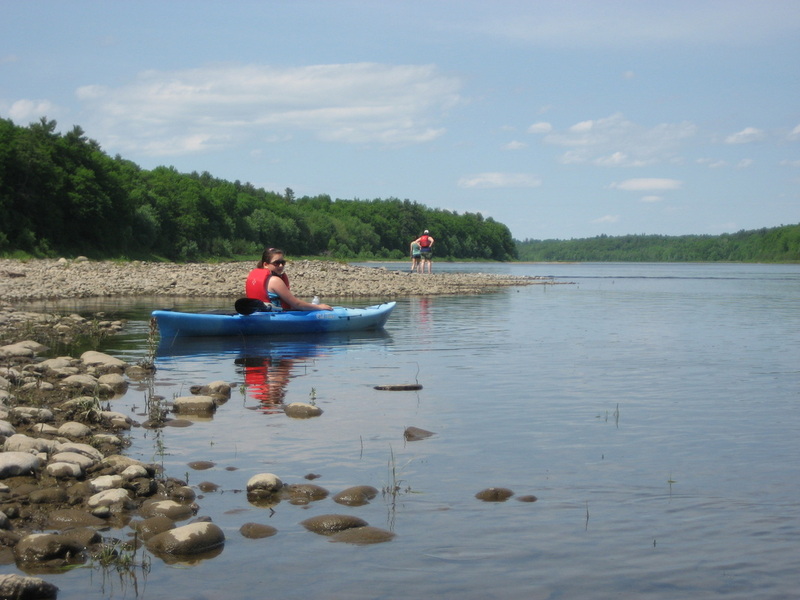 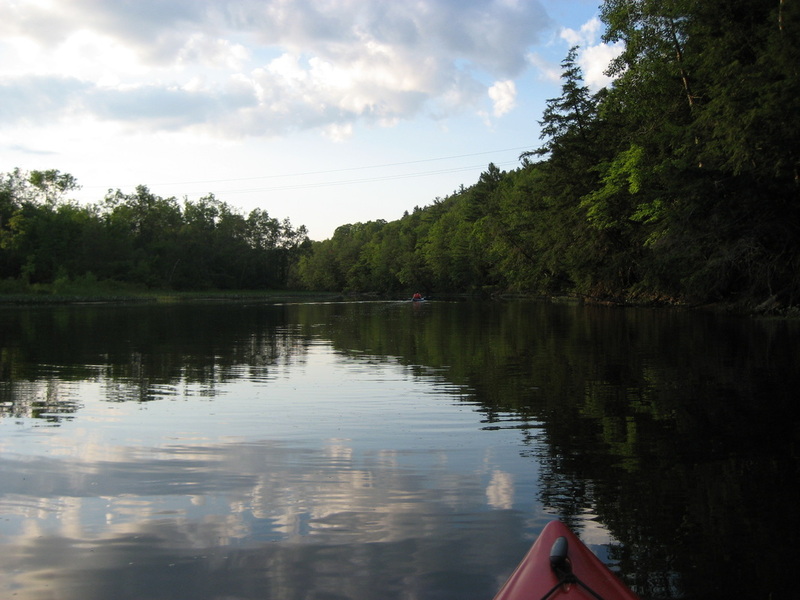 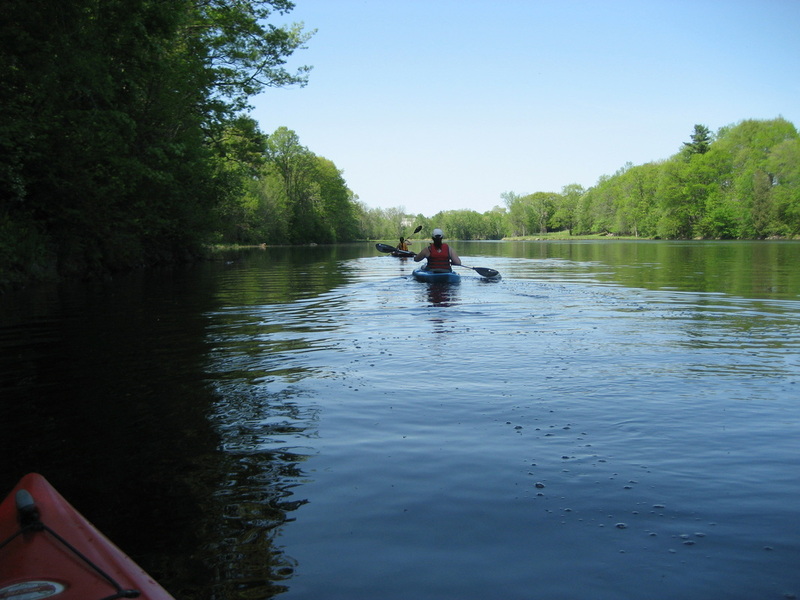 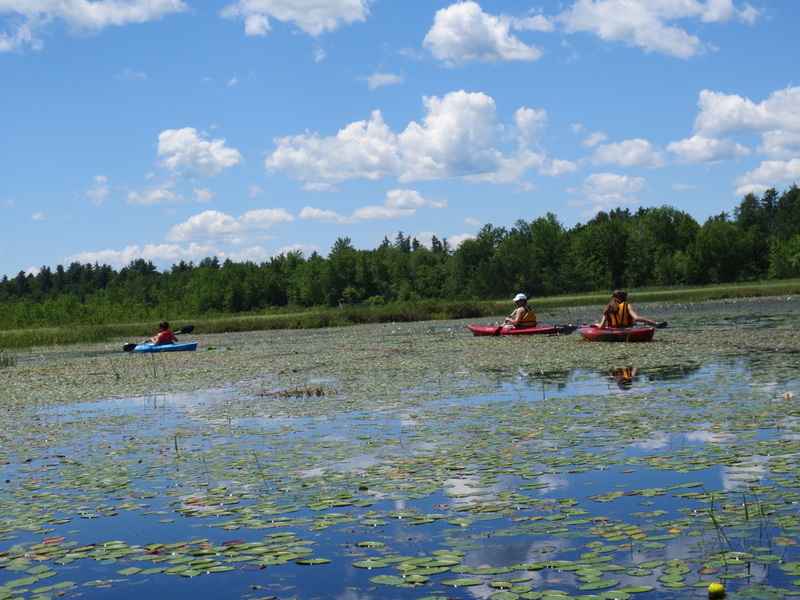 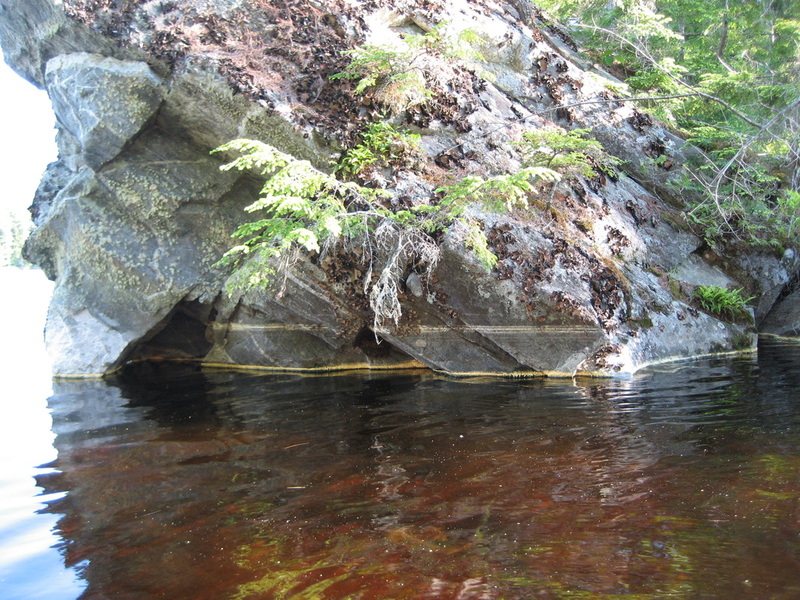 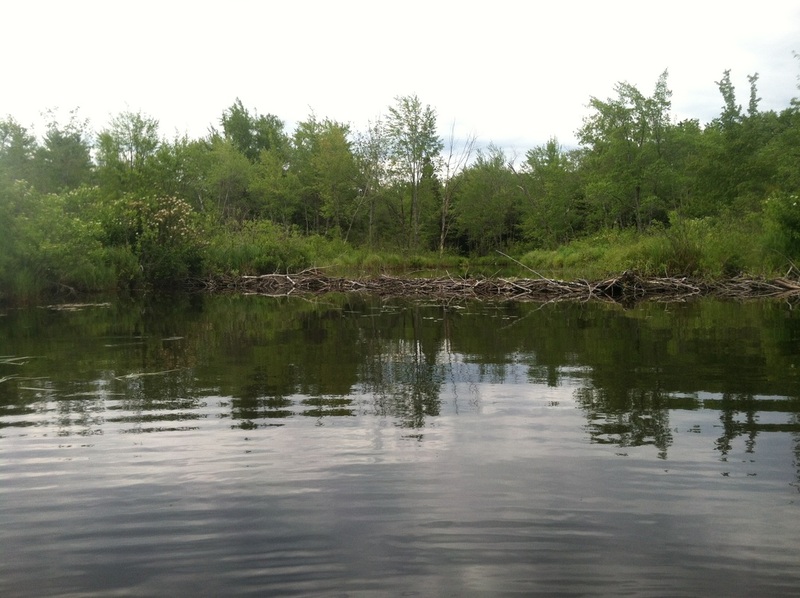 Long Pond offers a wide variety of open lake, bogs and marshes in numerous locations, islands, boulder strewn shallow areas, small shallow coves, interesting camps to look at and seemingly miles of wild shoreline. 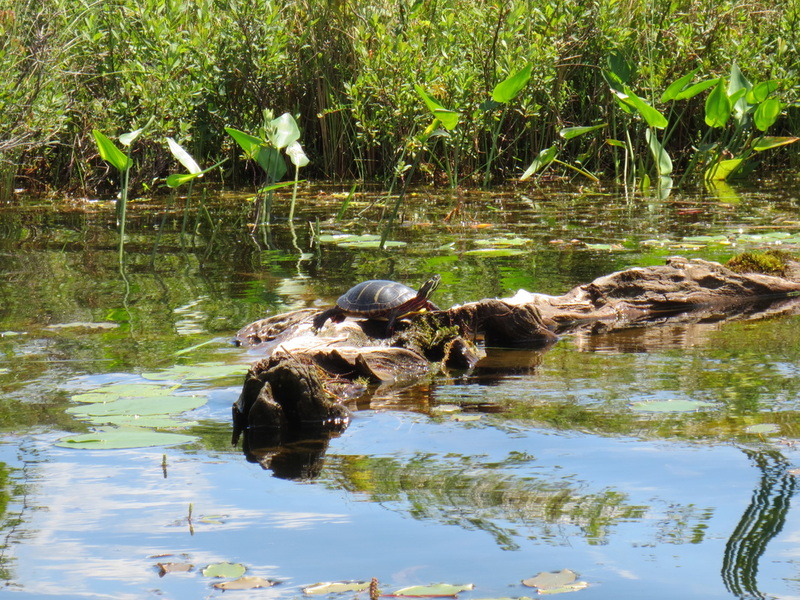 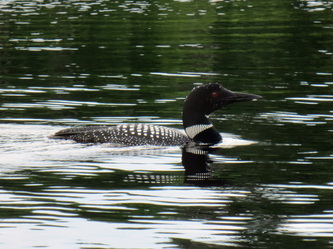 Animal sightings included plentiful loons, active bald eagles, some kind of vulture-like bird, a blue heron, turtles (including snapping), otters, and fish. 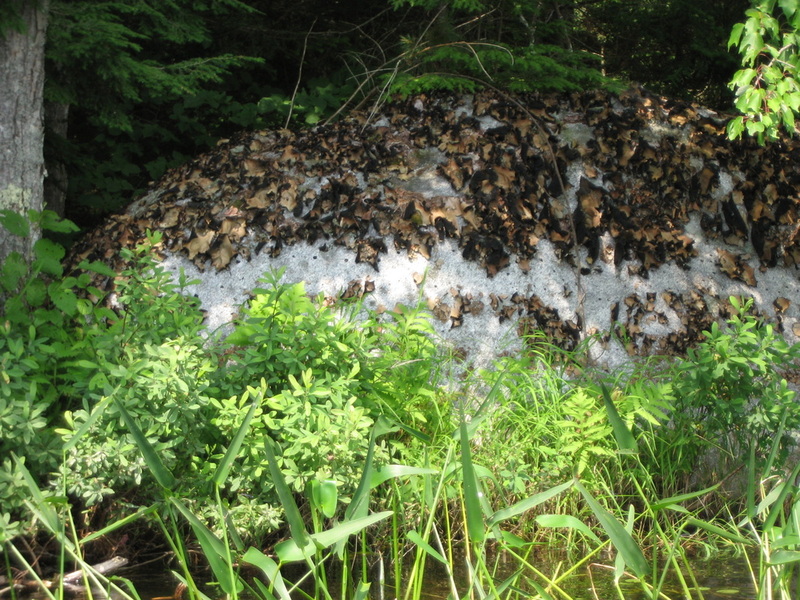 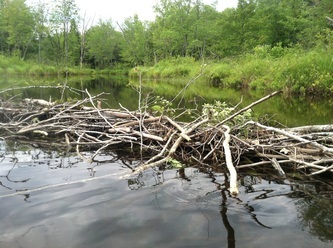 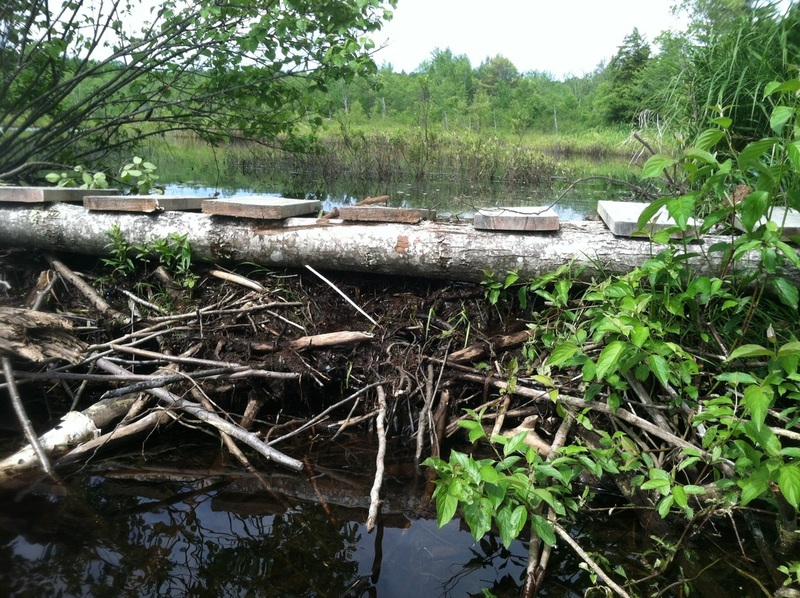 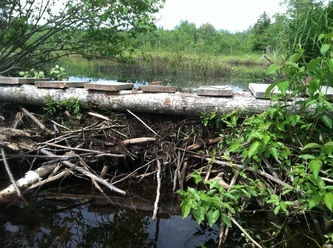 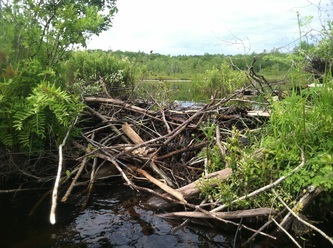 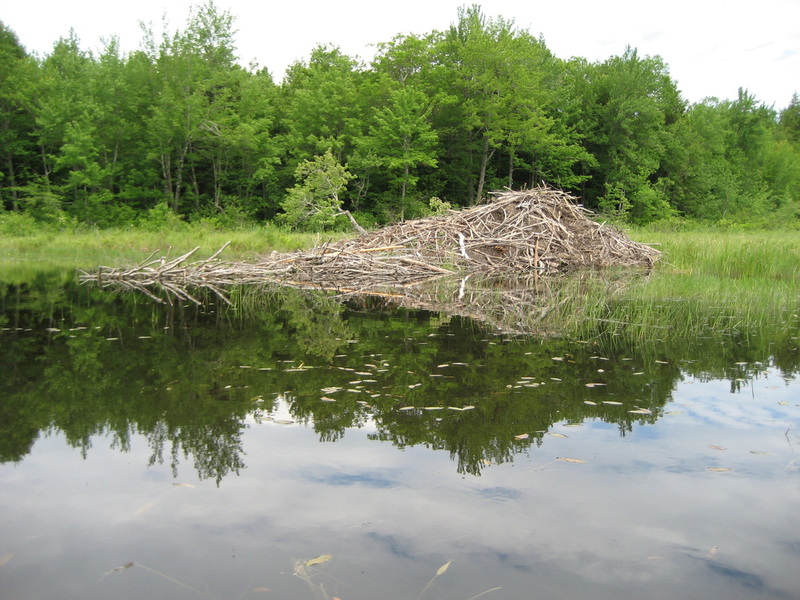 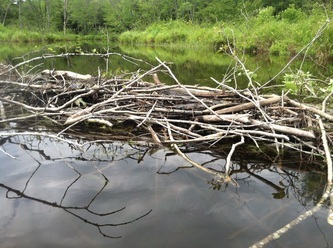 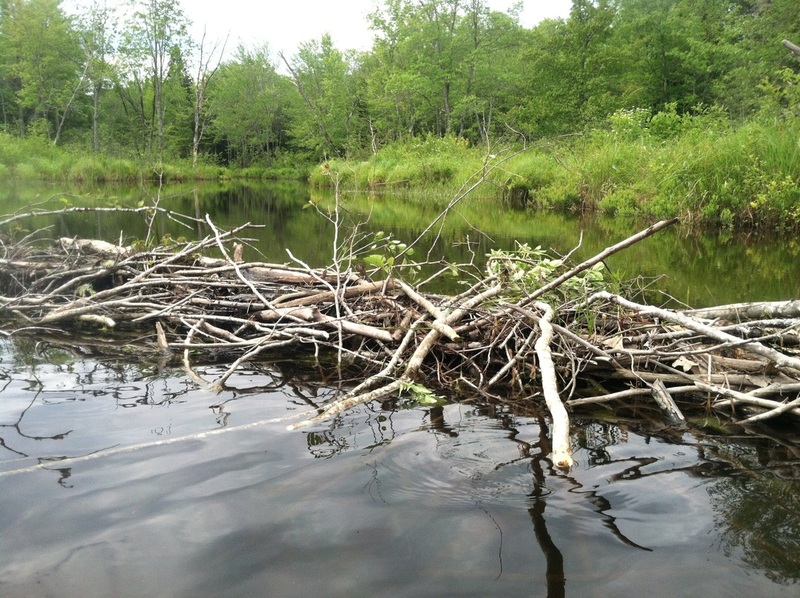 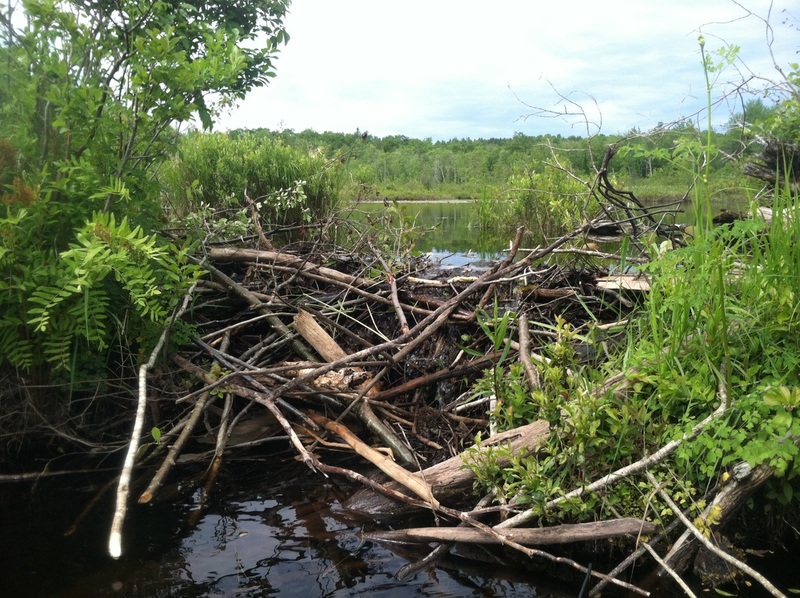 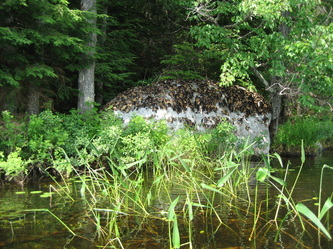 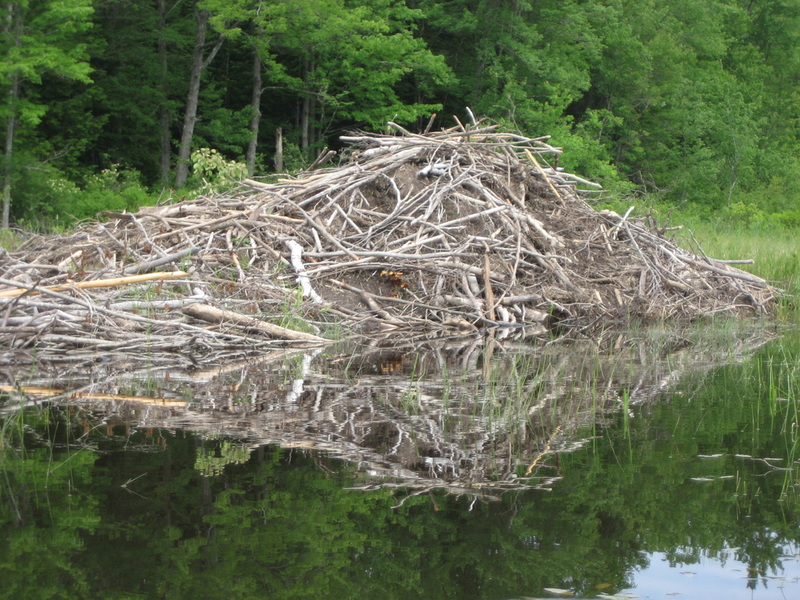 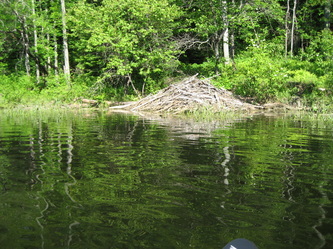 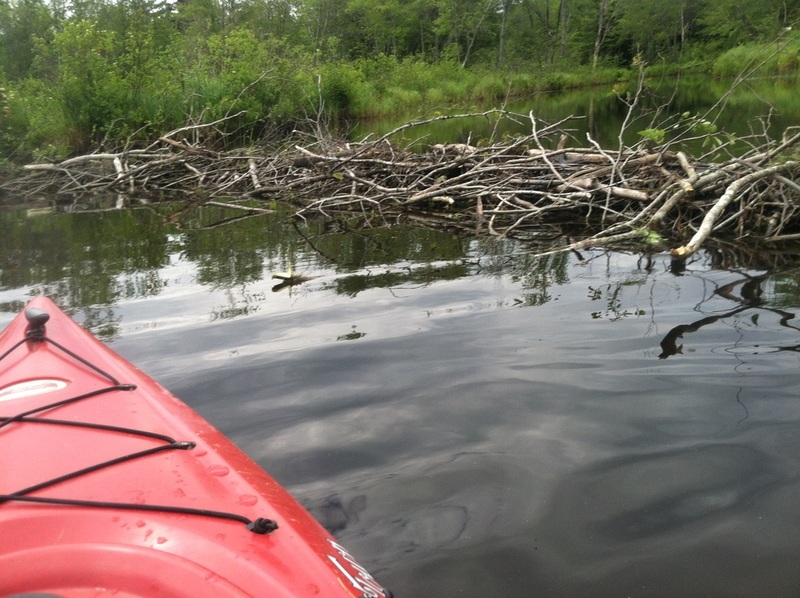 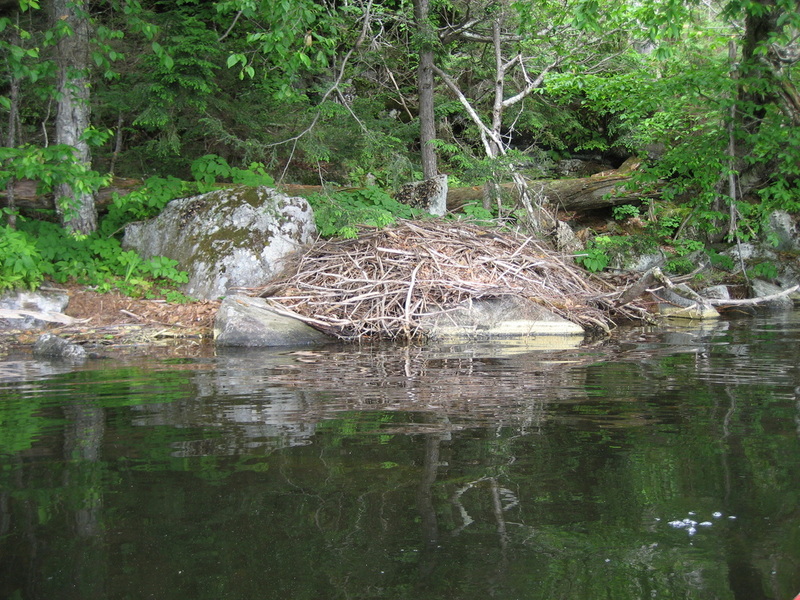 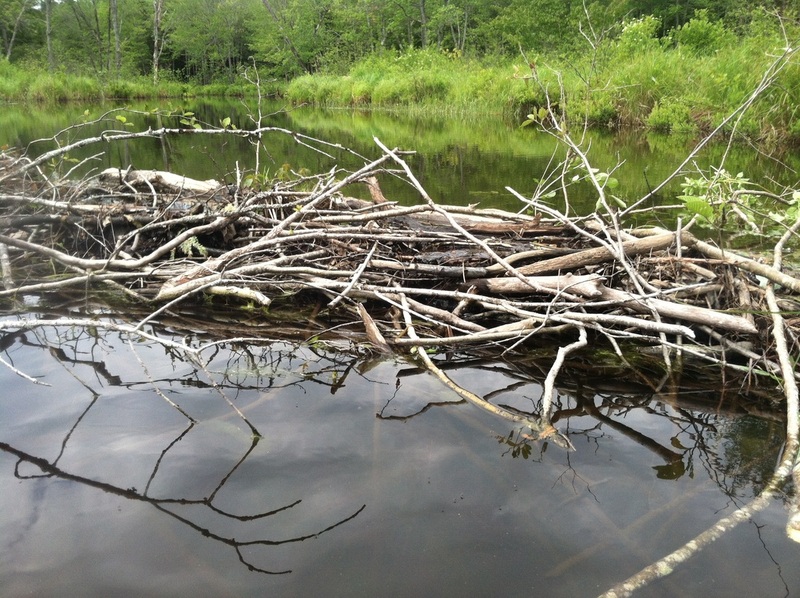 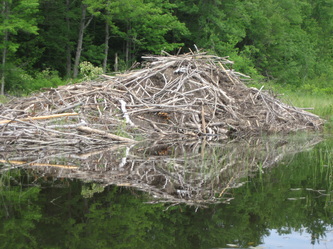 Though not directly seen, there is also a lot of beaver activity in certain areas. Around the camp, of course, we had the usual cast of chipmunks, squirrels, woodpeckers, and were warned of porcupine, though we did not see them ourselves. 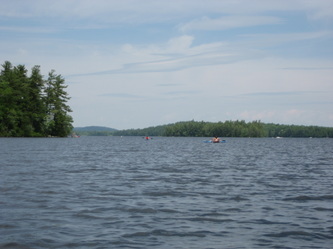 The surrounding hills and mountains make for an interesting backdrop to the water experience. 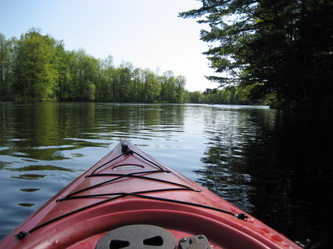 This was certainly one of the best lake kayaking experiences I've had. 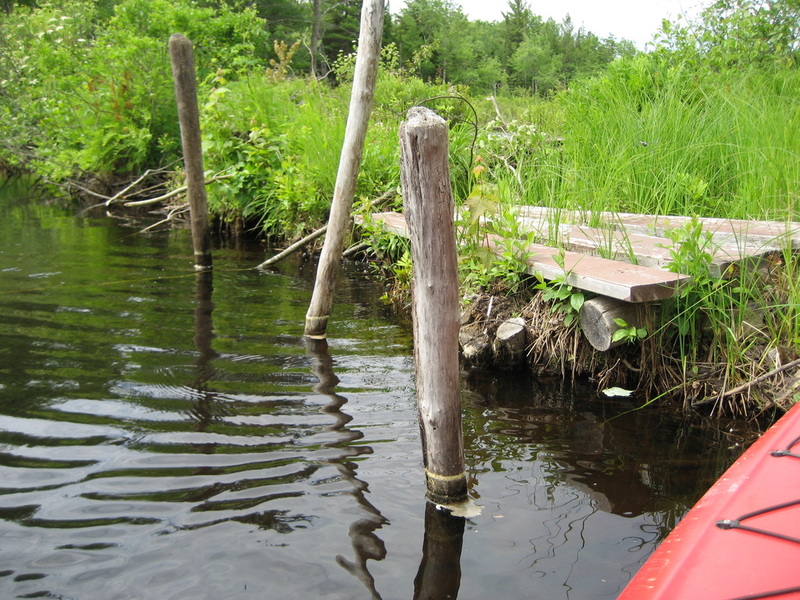 Originally, I thought I'd also have paddled under the bridge and explored the northern half of the pond, but I dare say exploring that would take another week. 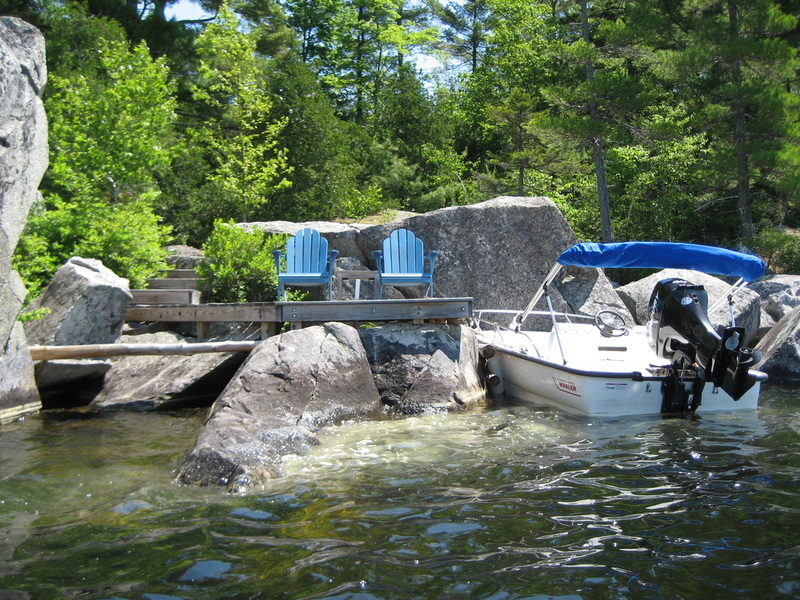 Access: We were launching from a camp we'd rented for a week, which was very convenient indeed. However, I did notice that there is a public, trailerable boat launch located at the isthmus/bridge between the north and south halves of the pond. 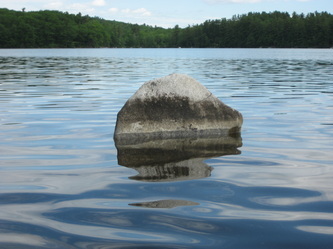 Likelihood of Returning: Medium High; beautiful lake with lots of interesting features, but a bit of a drive from home. 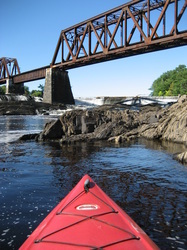 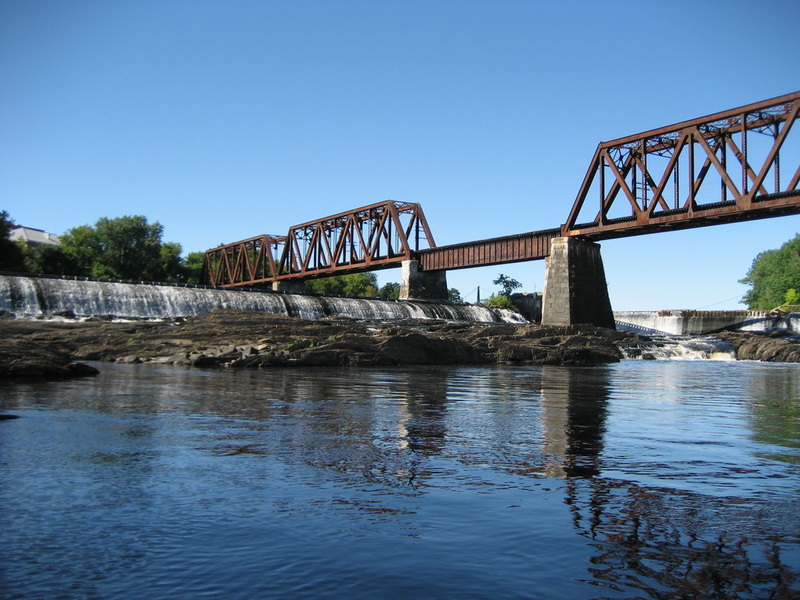 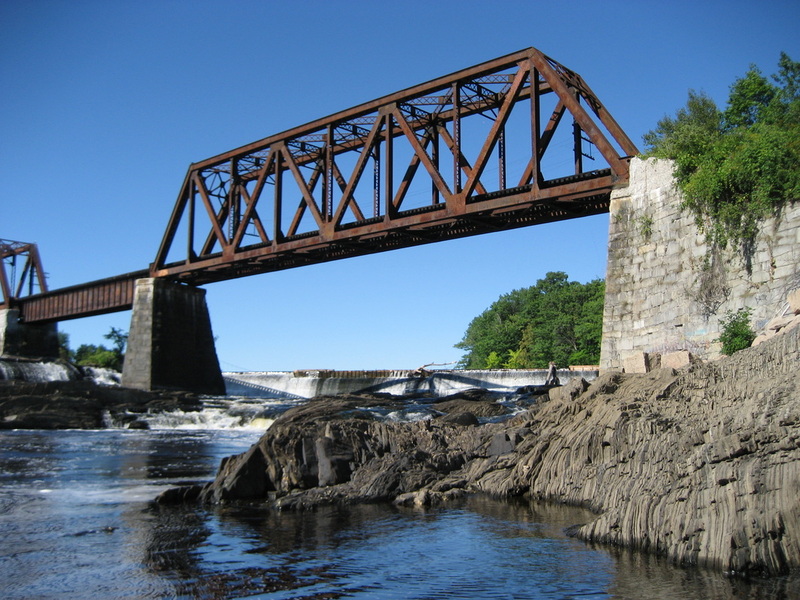 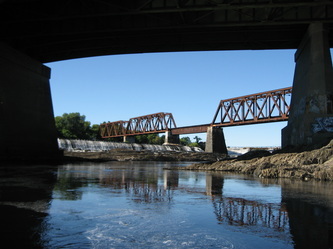 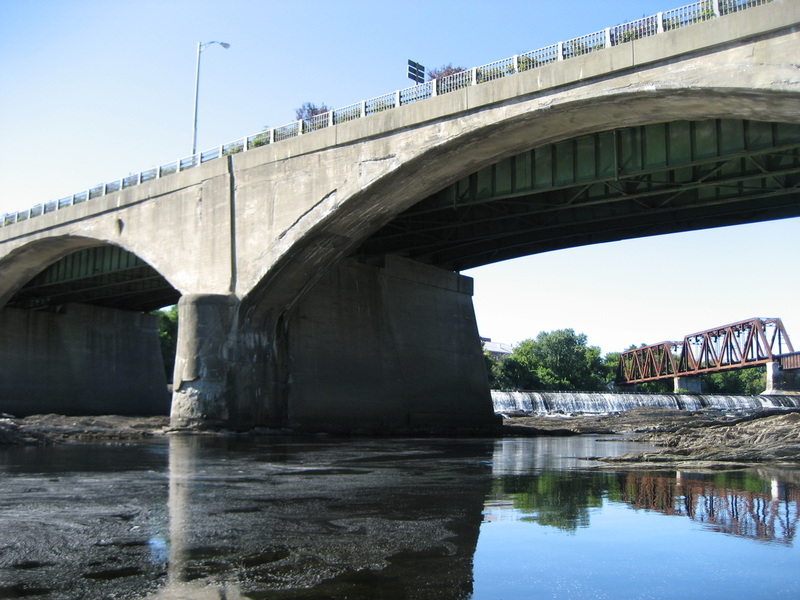 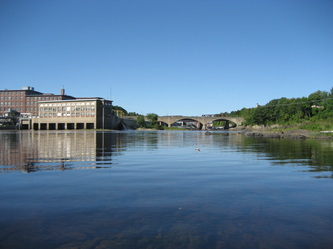 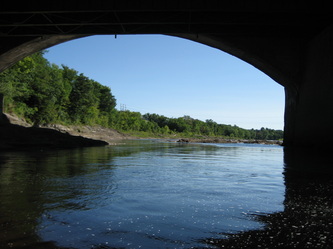 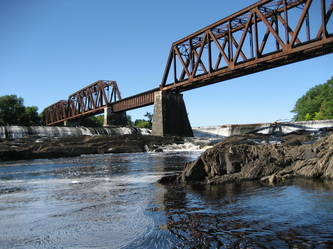 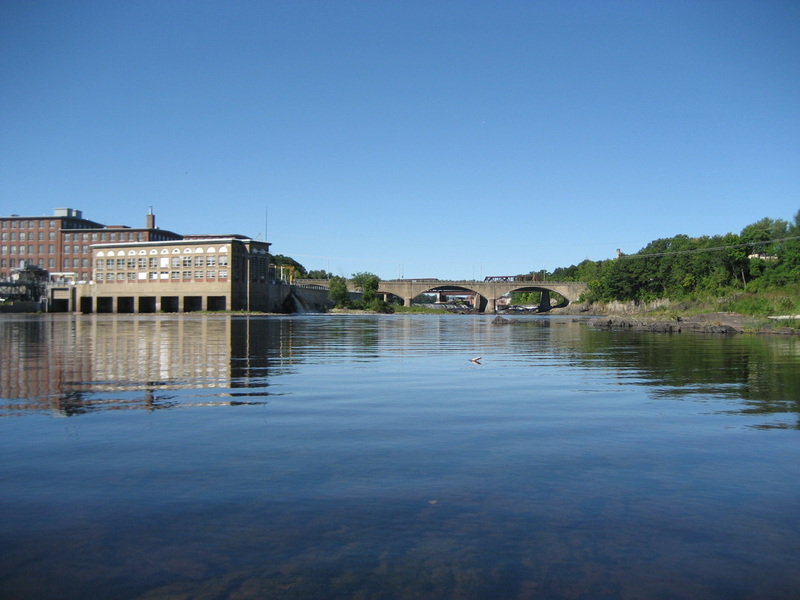 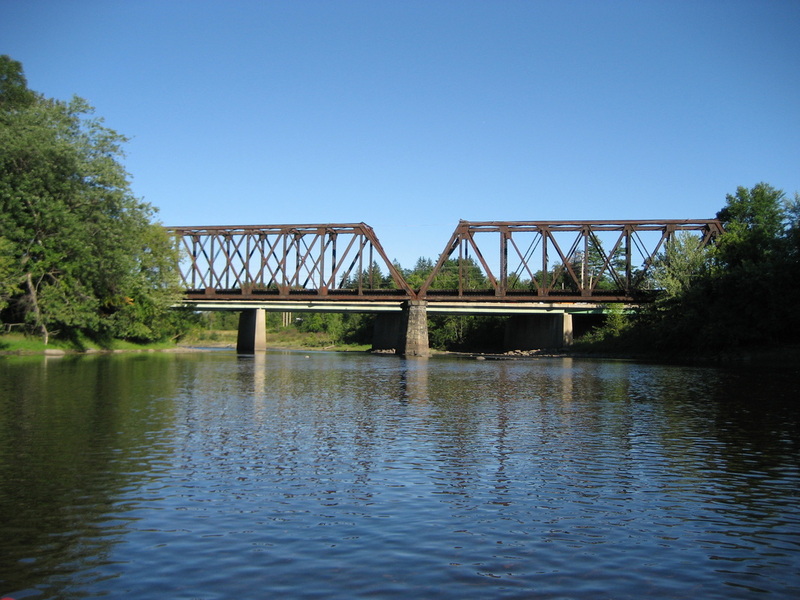 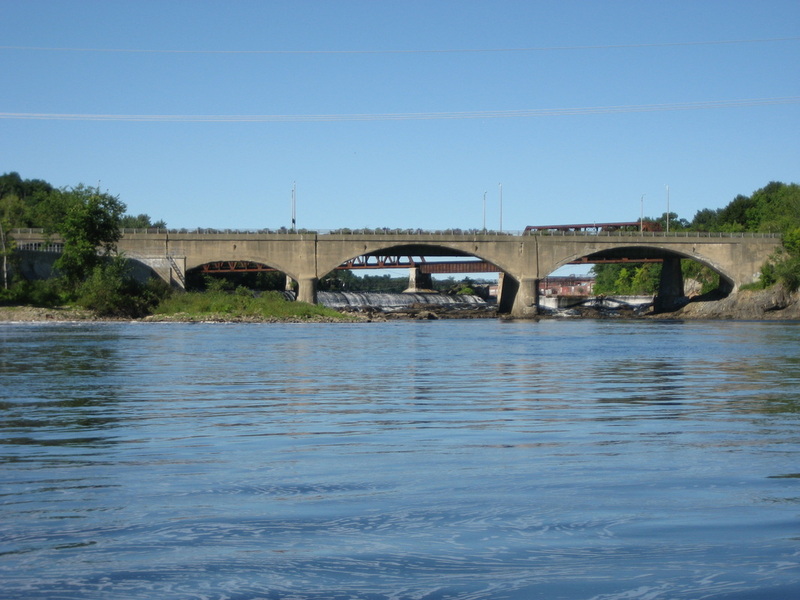 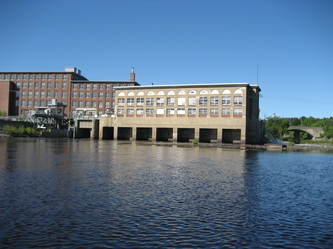 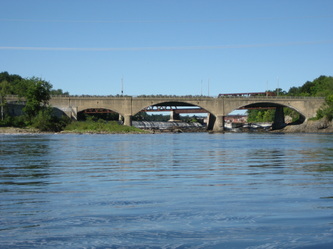 Description: I spent about two hours padding very casually and exploring the area between the Spring Street Bridge and the Carter Memorial Bridge on this stretch of the Kennebec, right downtown between Waterville and Winslow. 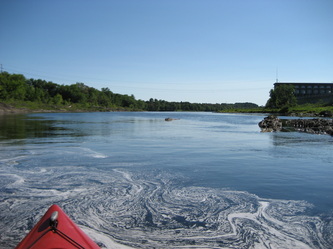 I was fascinating to see so many things from the river perspective that I have seen a thousand times from the road. It was a beautiful day, and rather surprising that the Park was completely devoid of people, and not a soul on the river but me. 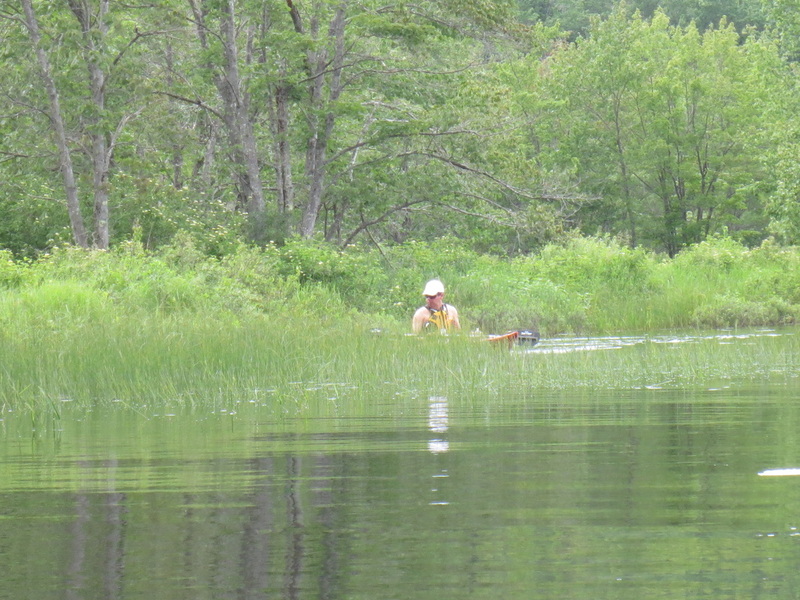 But I've always been surprised that I almost never see anyone on this stretch of the river. 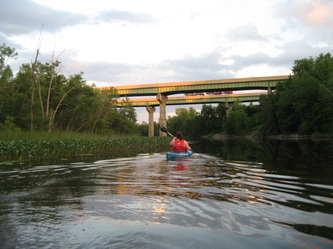 You'd think, due to its proximity to population, people would take more advantage of it. The day I kayaked it was a very low-water day, and most of my paddling was easier, even upstream. 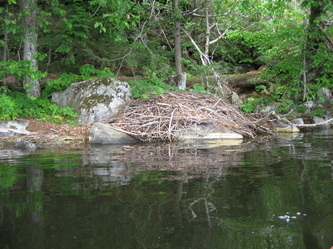 But I am positive that, depending on river flow, this can range from easy to even deadly. I would not think of it after rain days. 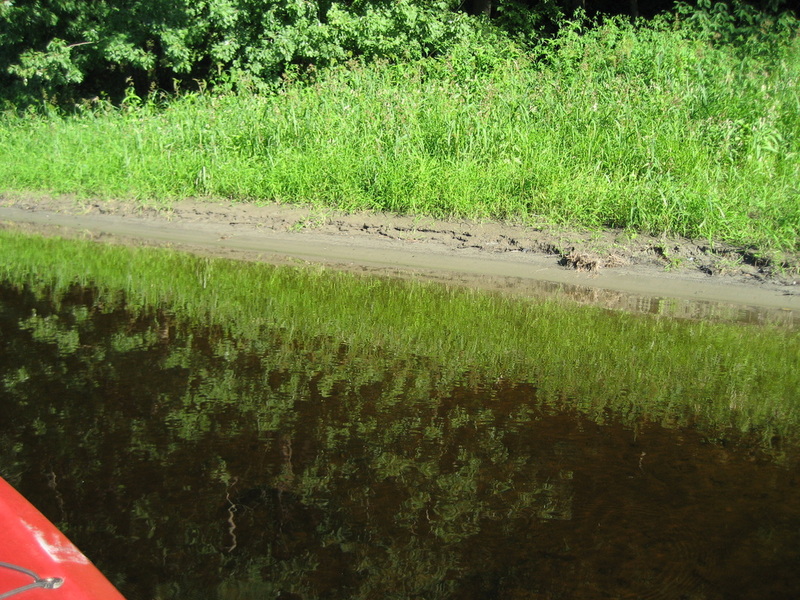 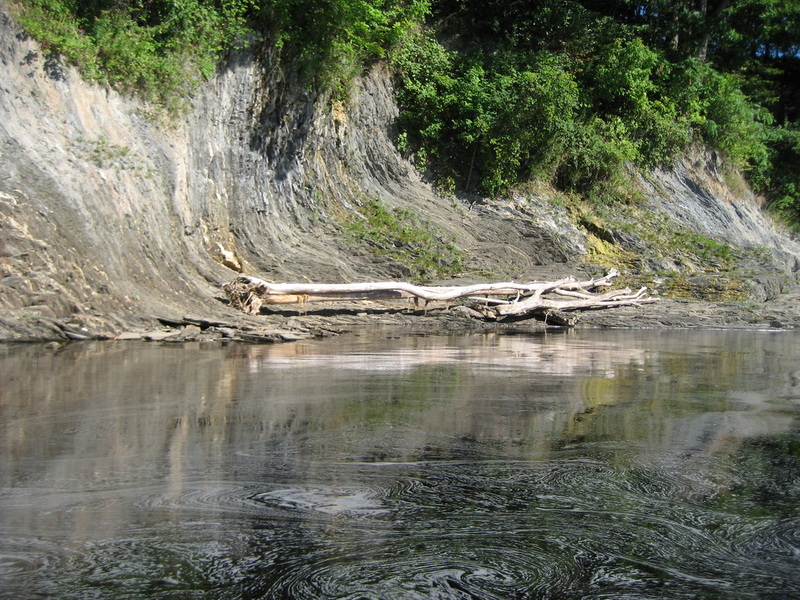 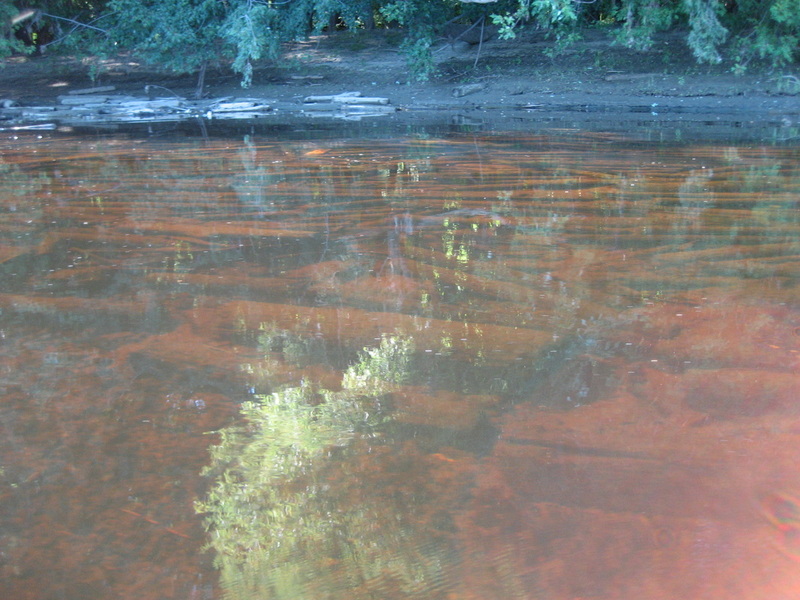 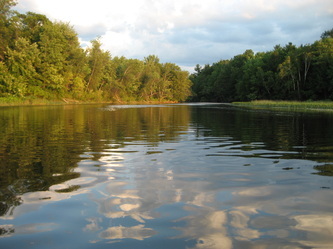 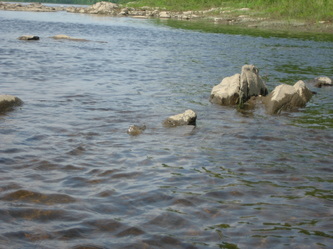 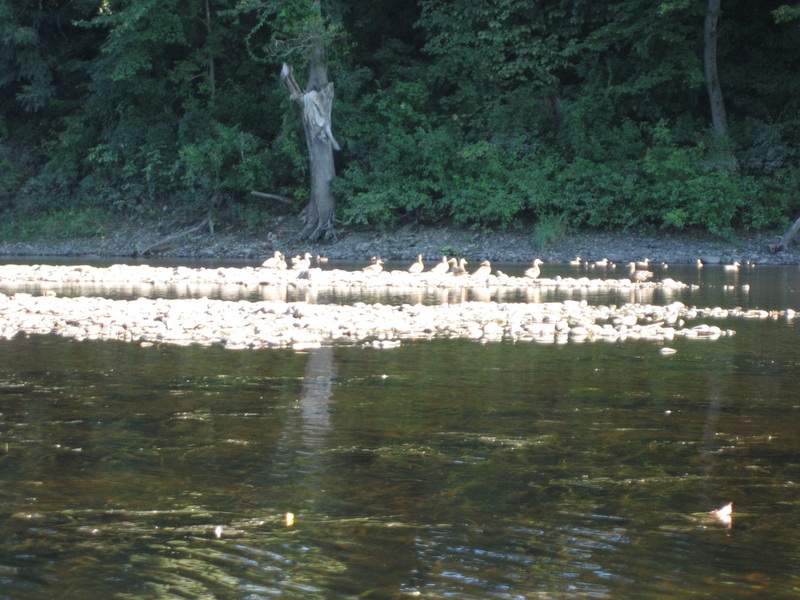 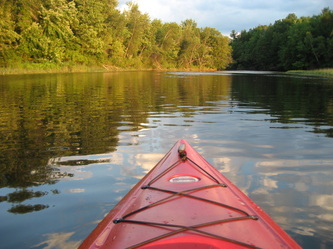 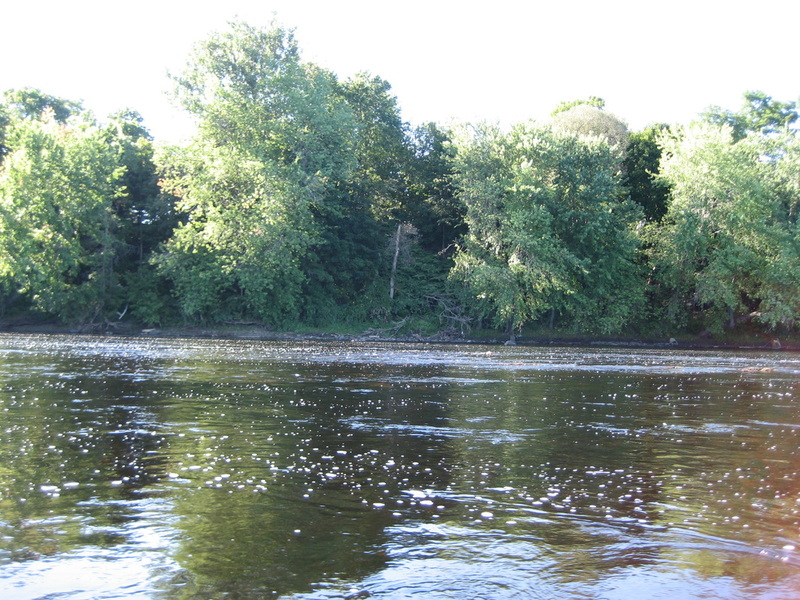 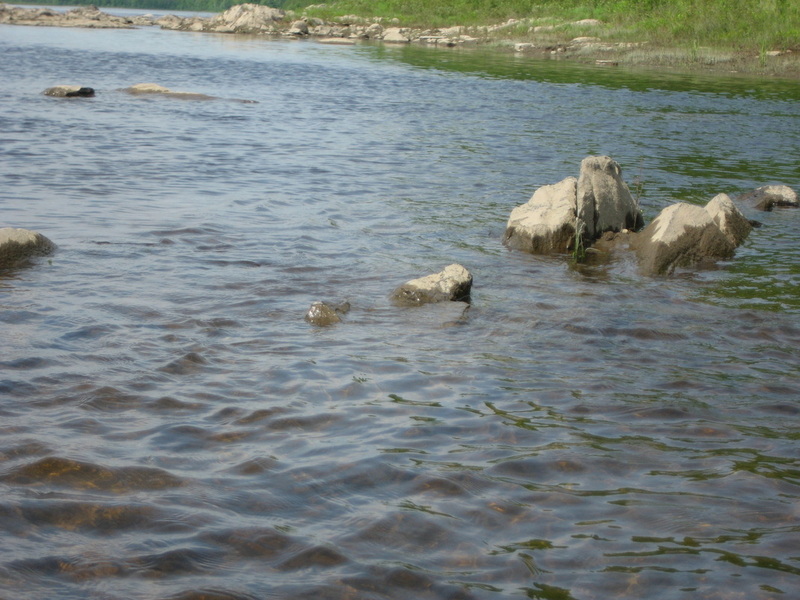 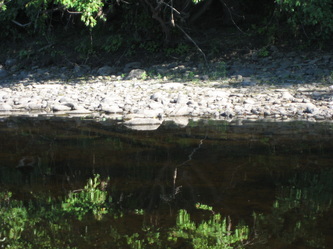 In most places the river is surprisingly shallow - 1-2 feet. 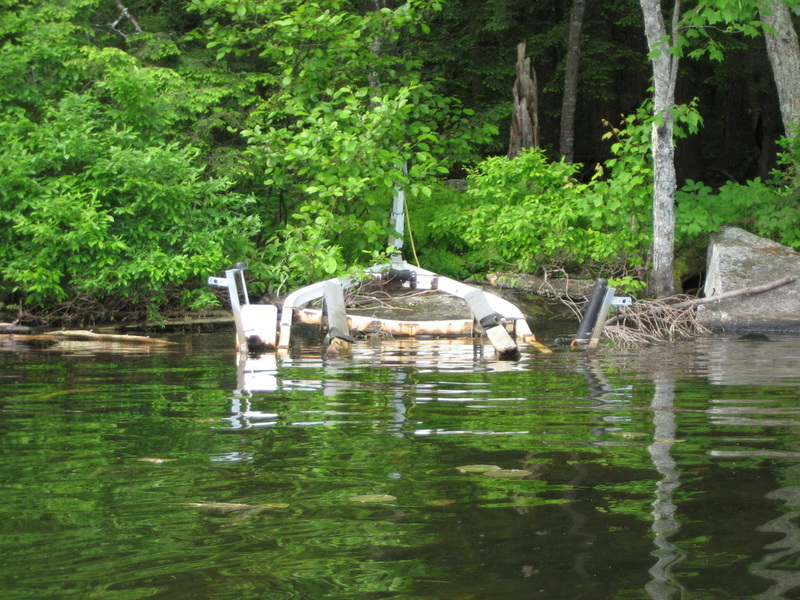 And a couple of times I even ran aground. 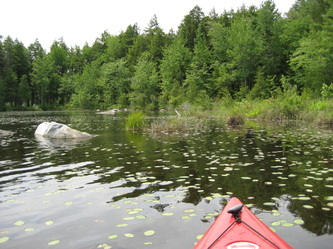 Coming back up the east shore from Carter Bridge was the hardest. 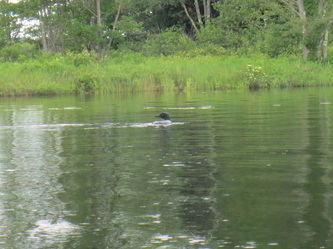 It was pretty challenging and headway was slow, being as I was in the combined current from the merger of the Sebasticook and Kennebec where they join at Halifax point. 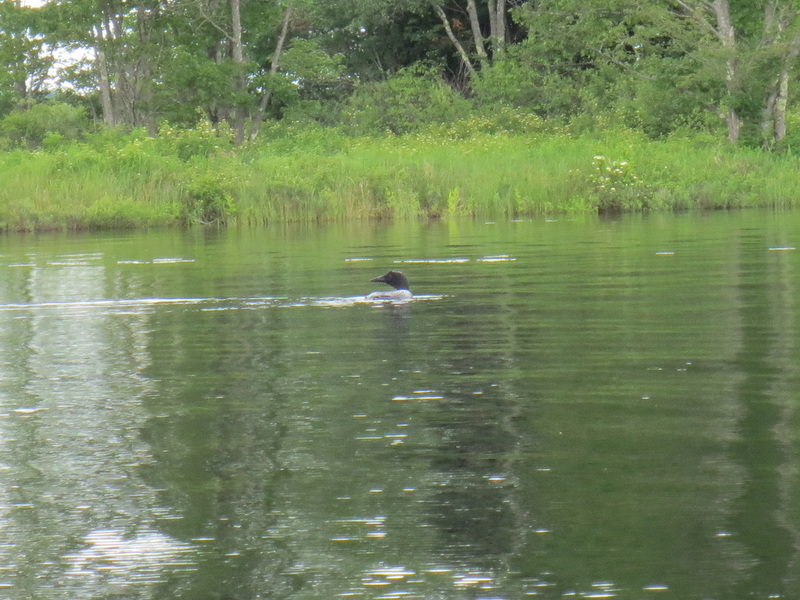 Wildlife sightings were minimal, but I did see the bald eagle briefly, osprey, and ducks. 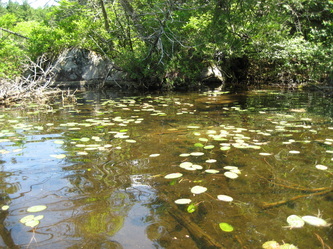 Some small fish, and freshwater mussels. No sitings of 6-foot leaping sturgeon, like tales I've heard. 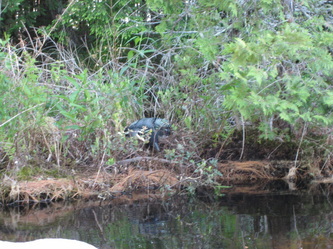 But I'm sure the time of year and time of day weren't ideal for wildlife. 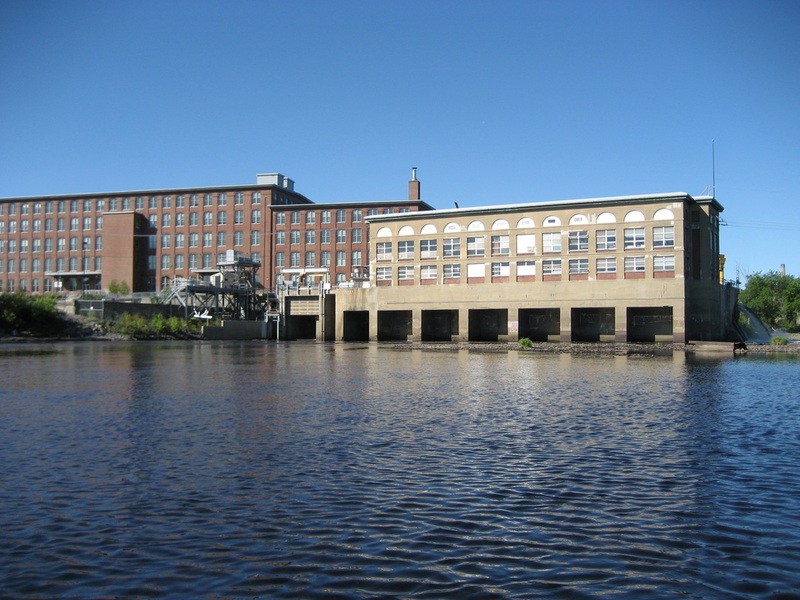 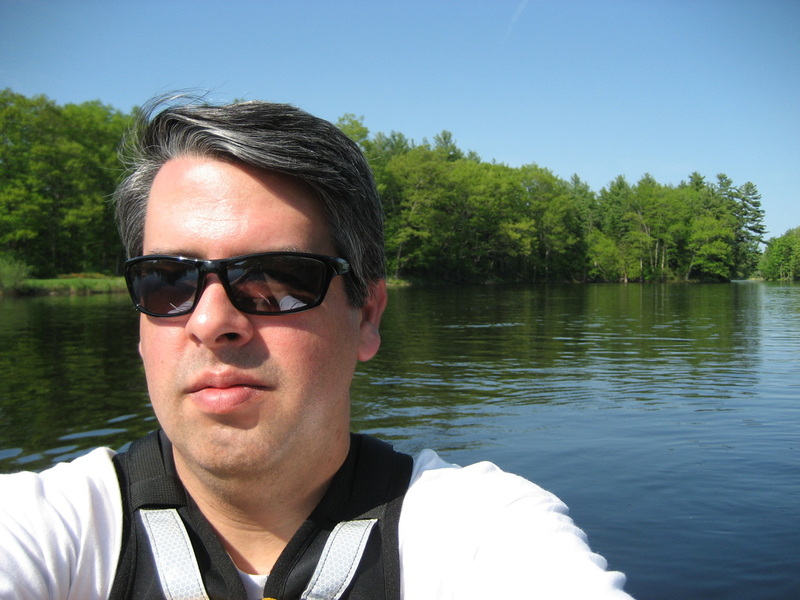 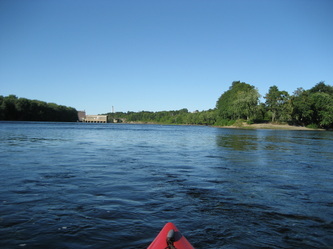 Despite the surrounding city, it's very quiet on the river, and this location really seems the fulfillment of my web-name, KennebecTom. Access: Via Fort Halifax Park. You park in the parking lot and have to carry in over the vast lawn of the park. 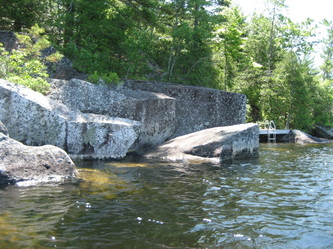 At several points along the shore there are medium-easy places to put in. 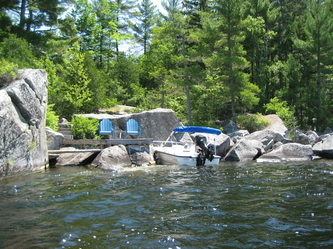 Likelihood of Returning: Very High, largely due to proximity to home. 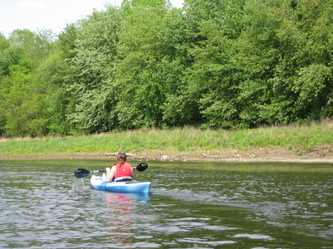 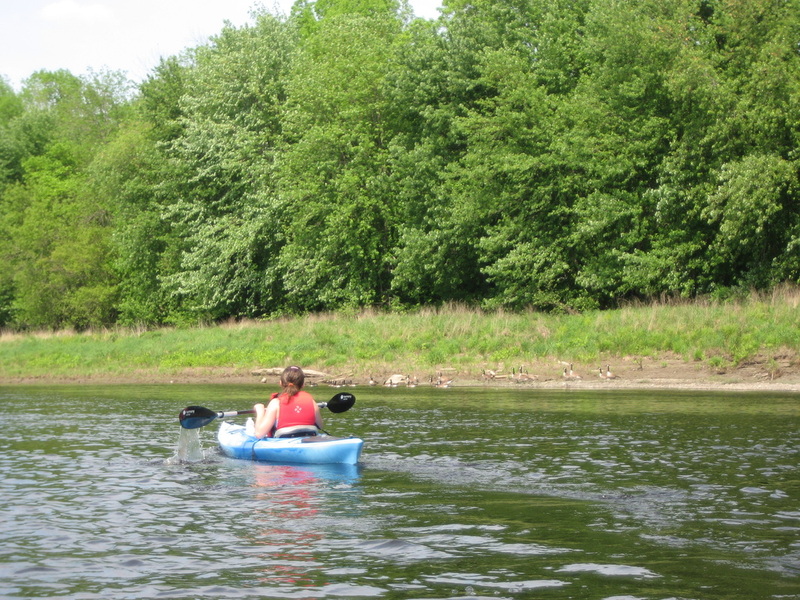 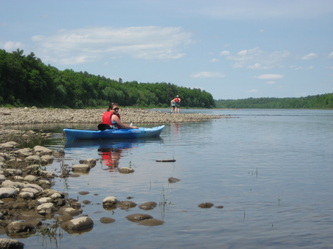 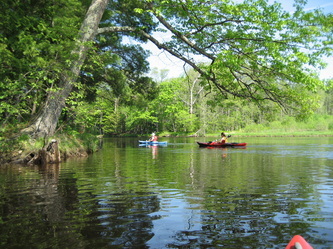 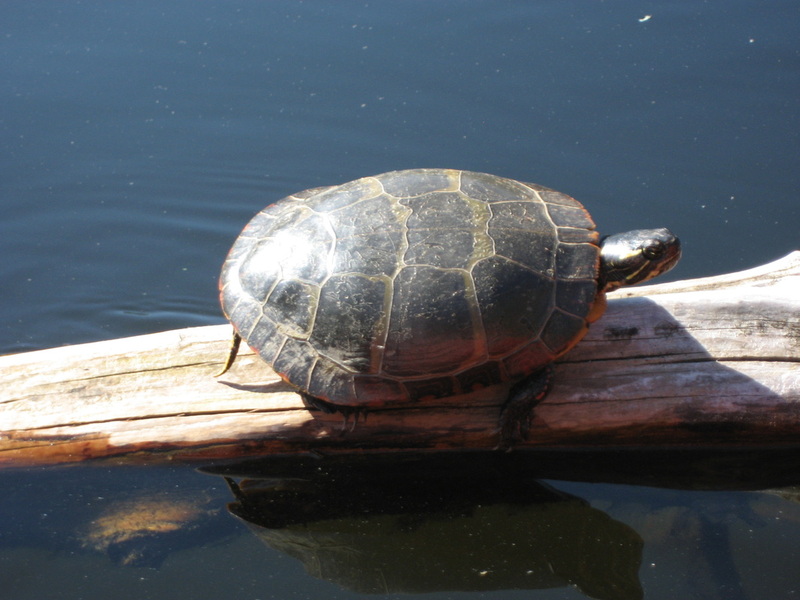 Description: A pleasant paddle on the impoundment behind the Benton Dam. This is one of my favorite spots. 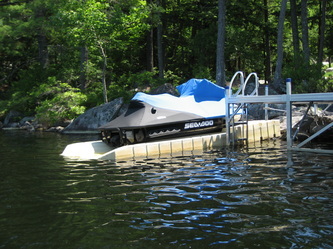 I've been on it 3 times in 2012. The current is nearly imperceptible, and we paddle upstream and return downstream. 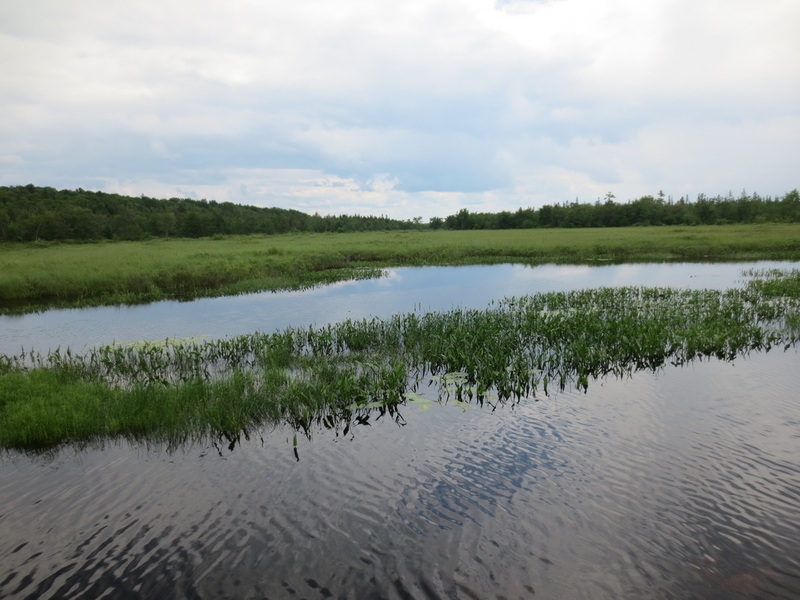 The shorelines are quite interesting, with some tended lawns, some farms, some woods, and some marshes. 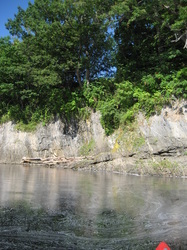 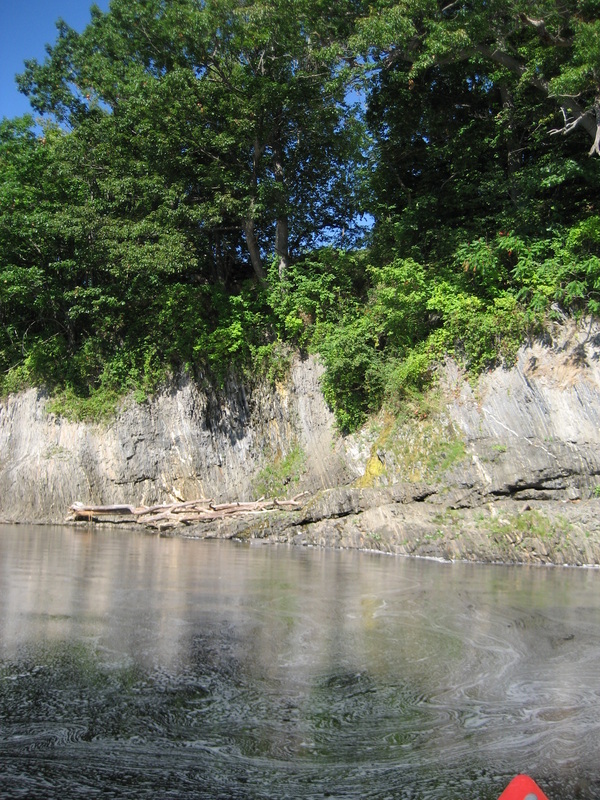 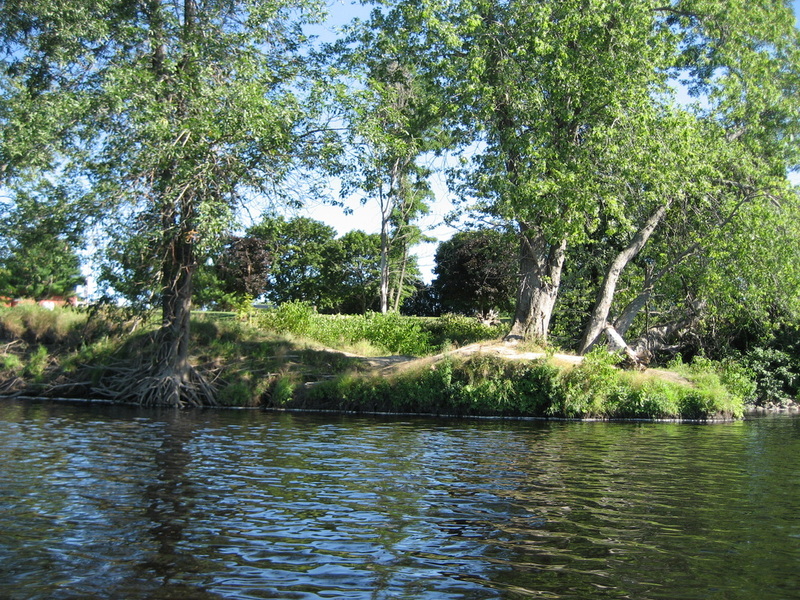 The banks feature varied topography, being sometimes very steep beside the river. We have seen some interesting wildlife, including osprey, an unconfirmed otter or muskrat sighting, a fox, and small fish. 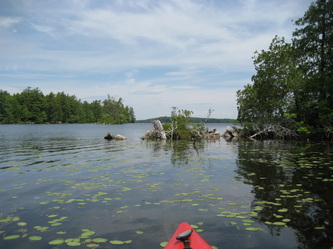 On my third trip up, I made it all the way to a point with a couple of small islands and heard the rush of running water ahead. I made it to the limit of the impoundment and to a section where the water ran free. 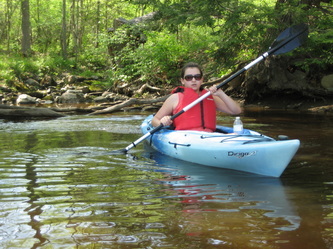 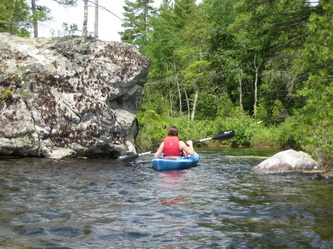 It was fun paddling upstream navigating shallows and weaving between rocks to see if I could make headway. 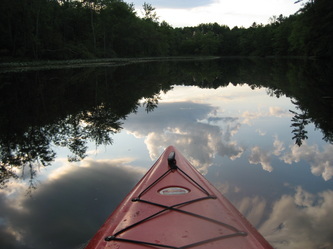 Ultimately, however, it was time to head home for dinner, and so I let the flow wash me back down to the still water to paddle back. Downsides are the traffic noise crossing under the bridge, and that you can still hear traffic, particularly the Harleys of summer on the highway running adjacent to the river, though high above, for the first half of the journey. 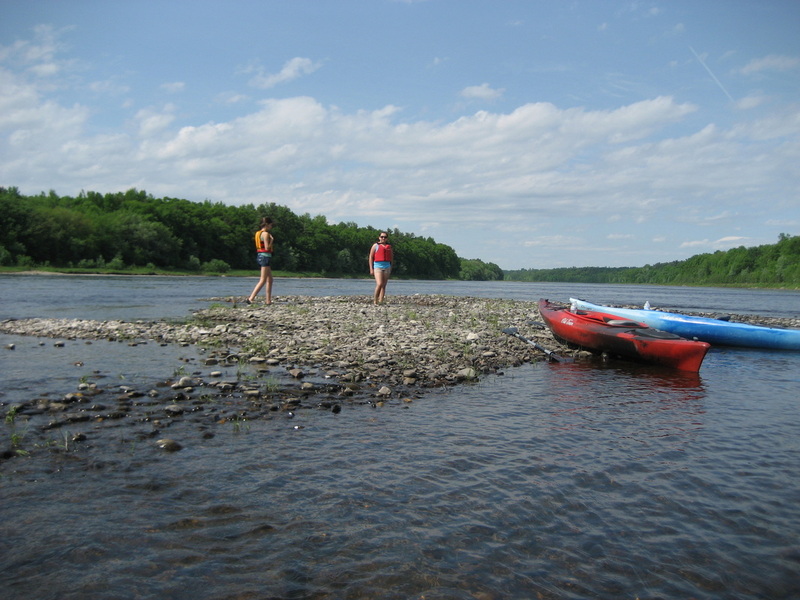 Access: The boat launch is on the east side of the river, just north of the dam, being dirt/packed gravel, and accommodates trailers. 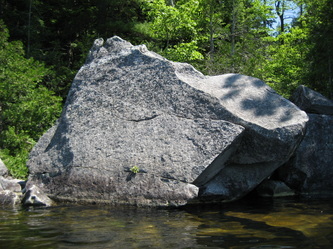 But it's nothing fancy. 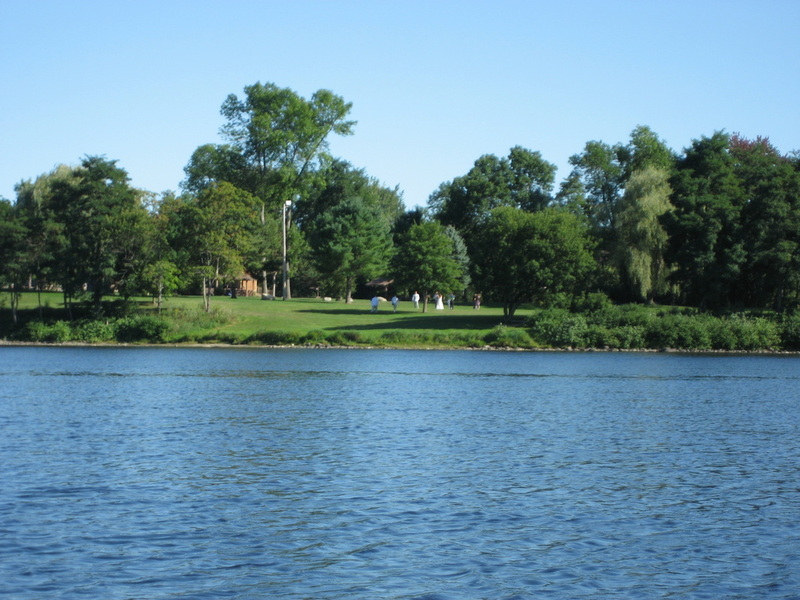 Tip: drive slowly past the residences approaching the boat launch and you will preserve good will for all. Likelihood of Returning: Very High. 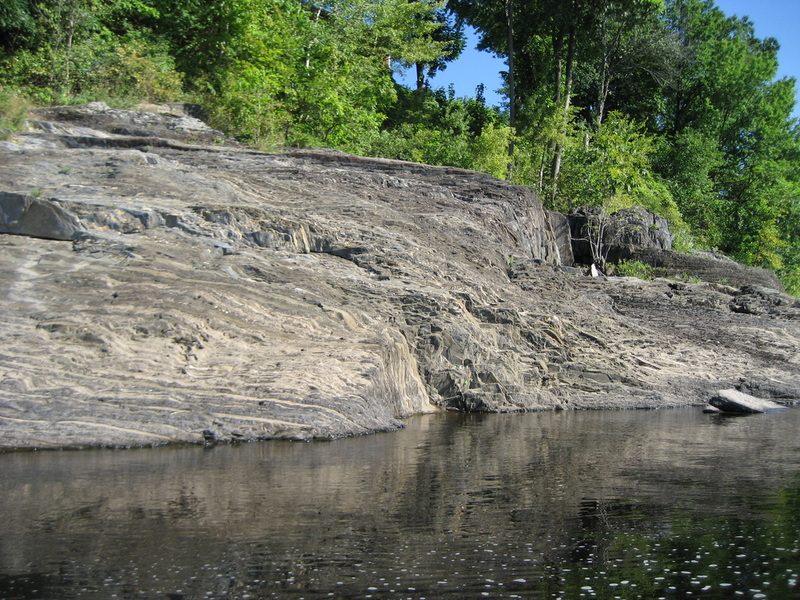 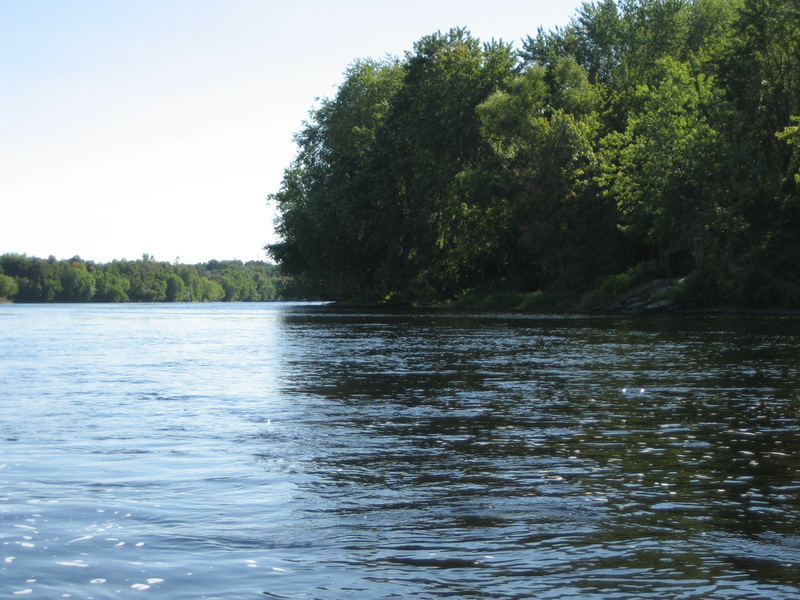 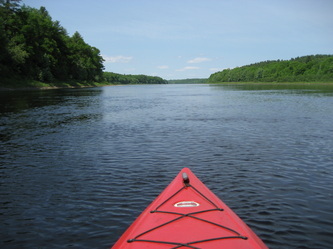 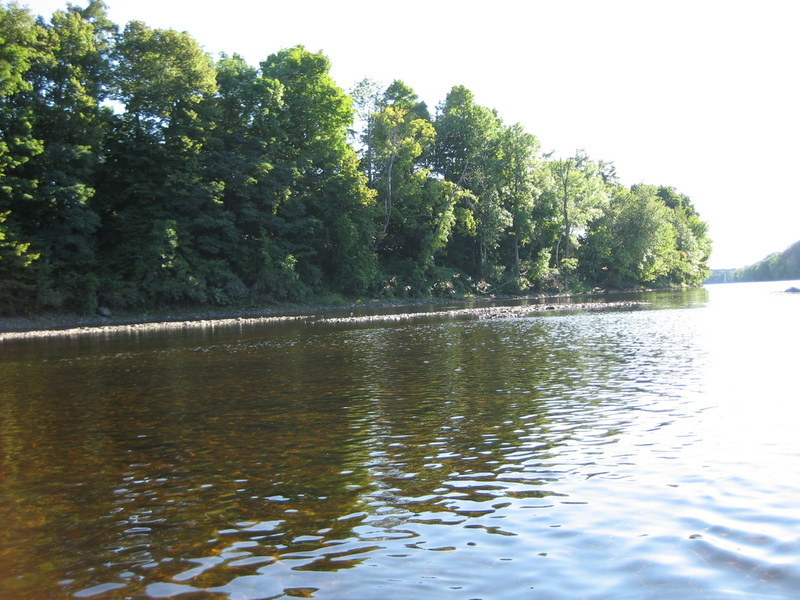 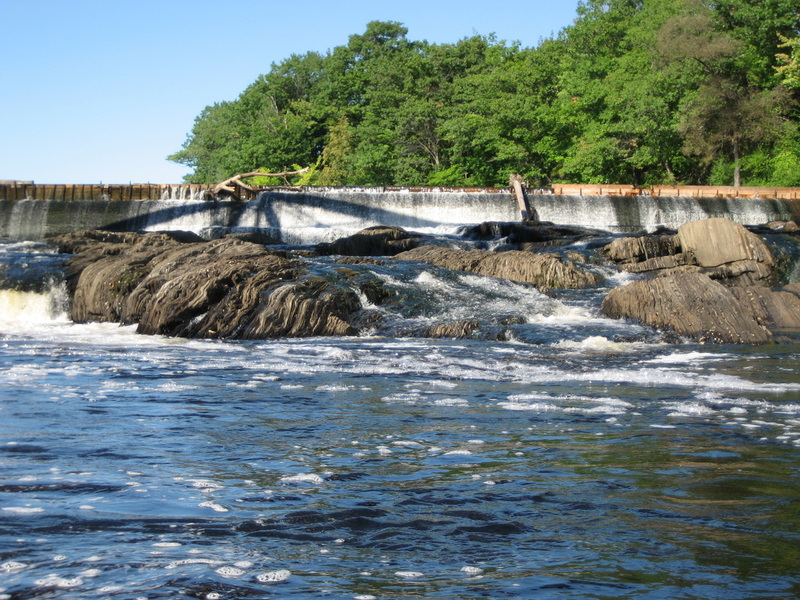 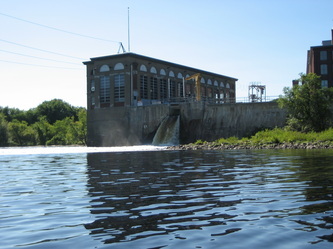 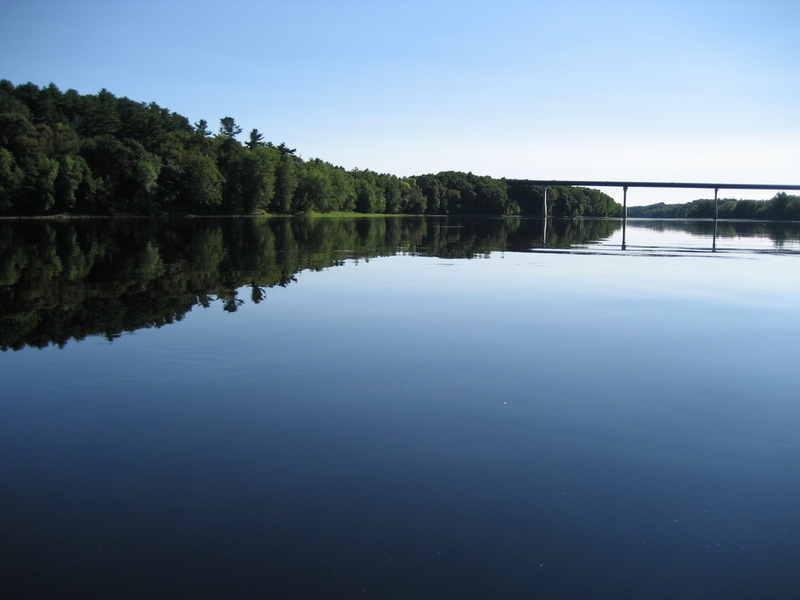 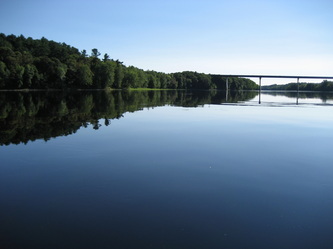 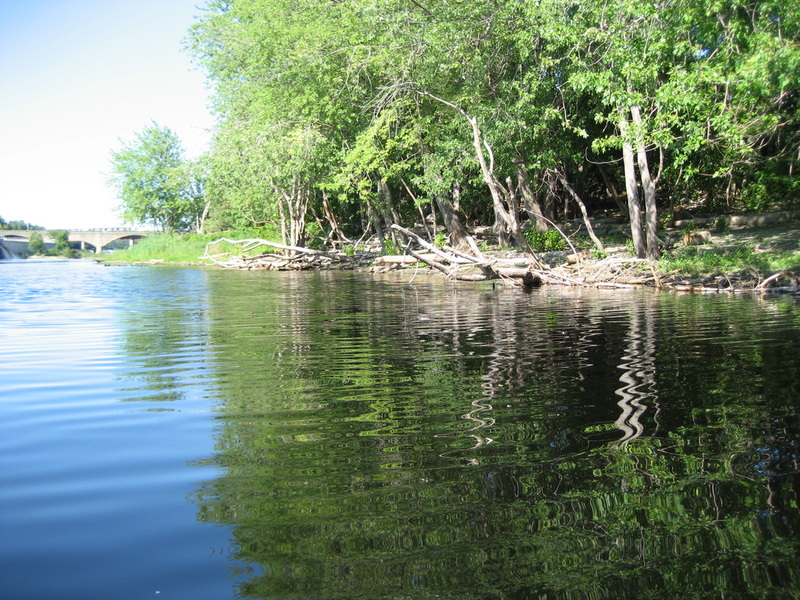 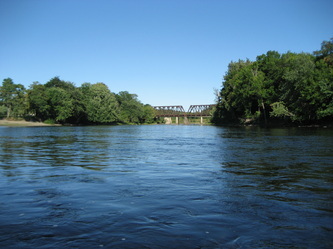 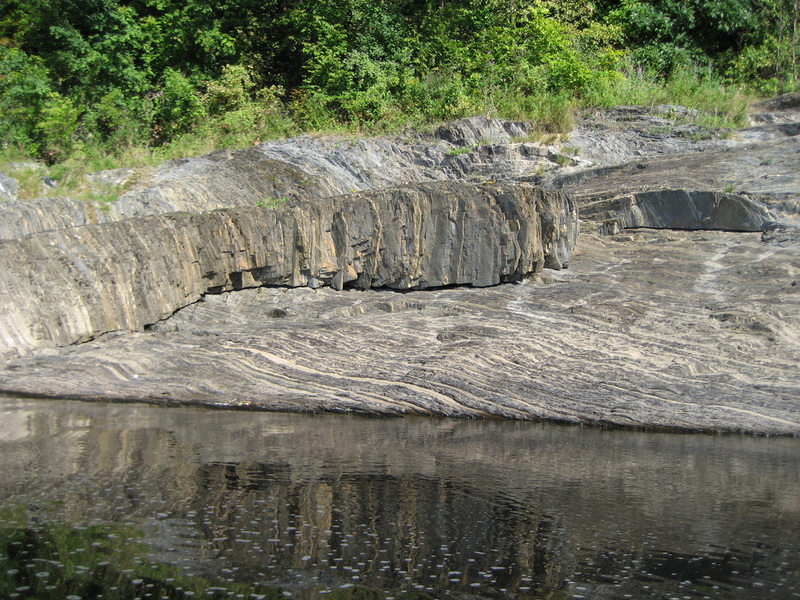 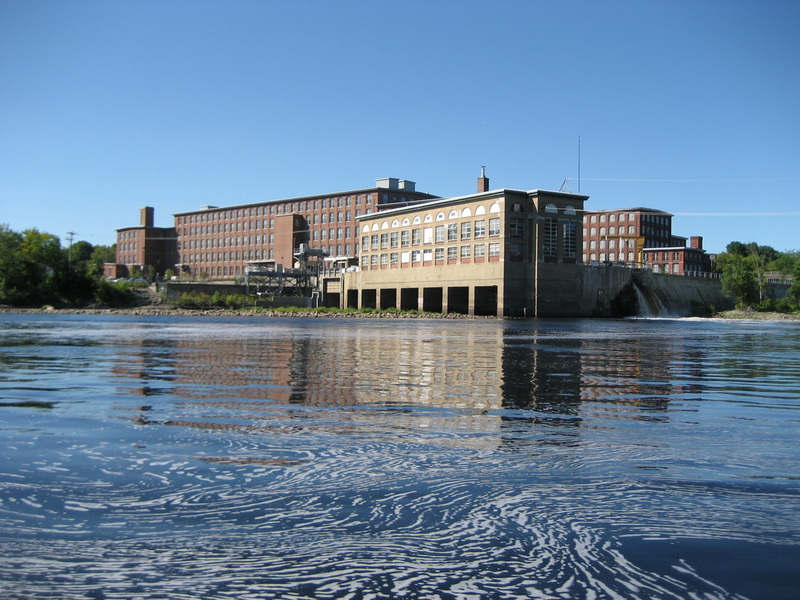 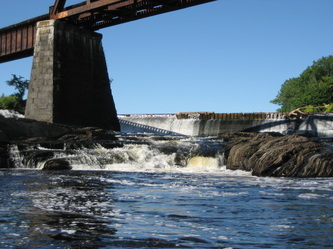 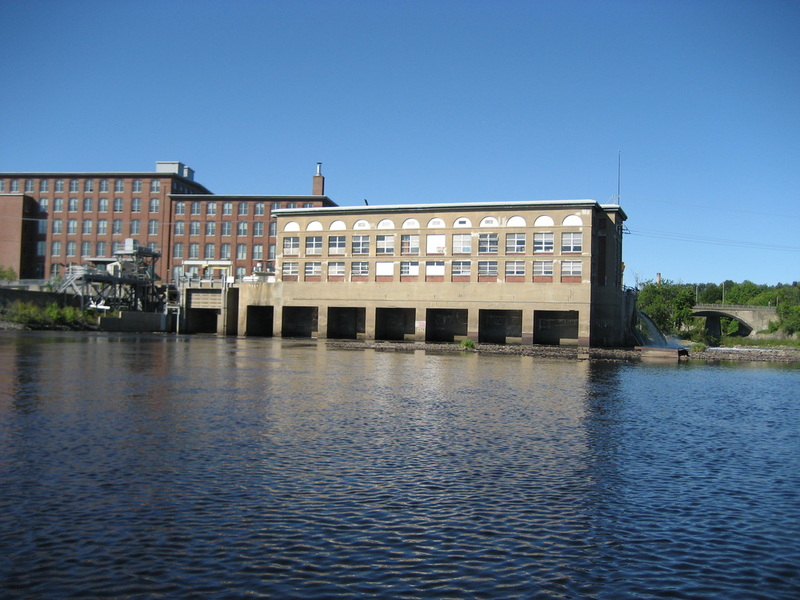 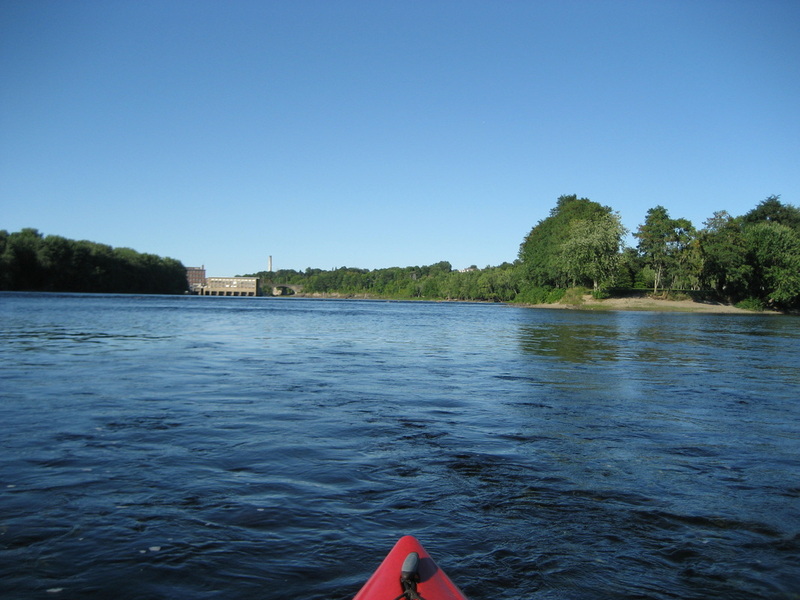 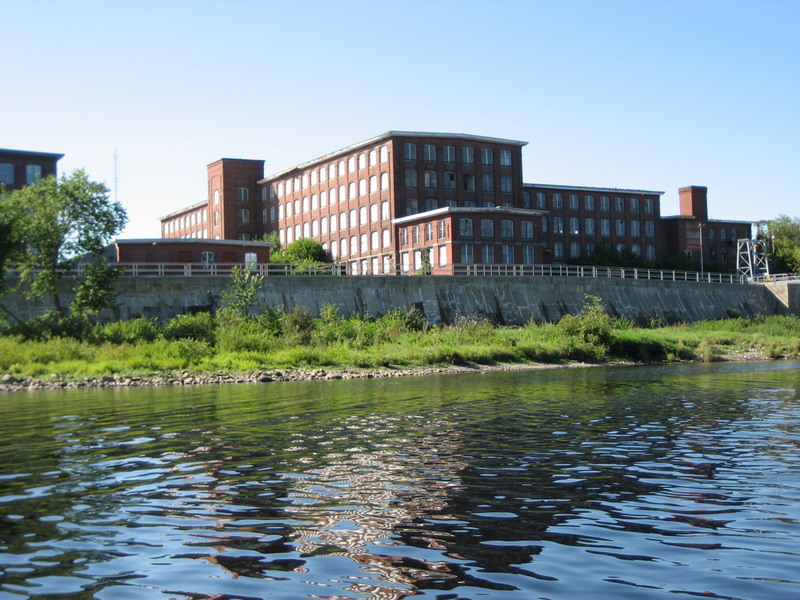 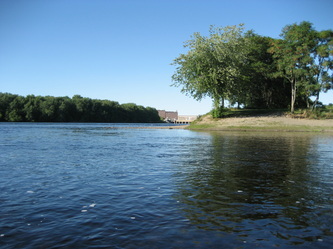 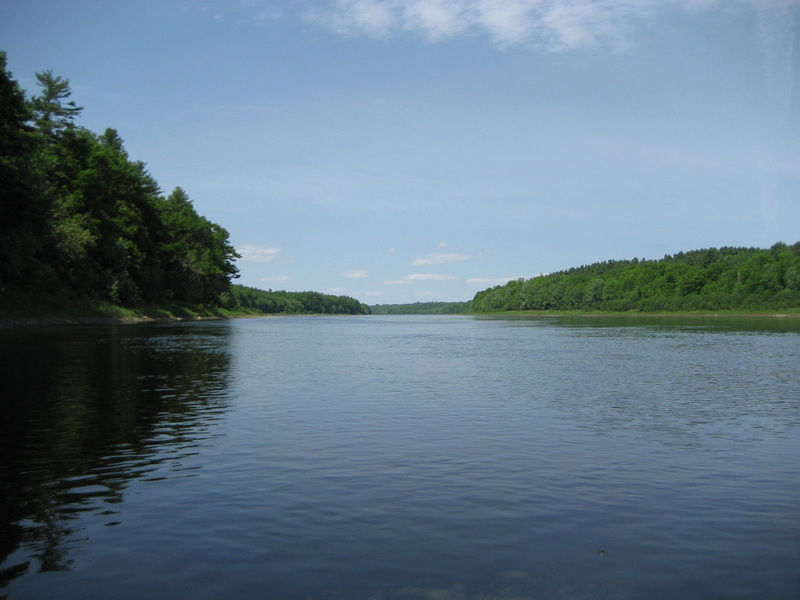 Description: This far down, the Kennebec is very broad, the current is slow, and the area is somewhat featureless. 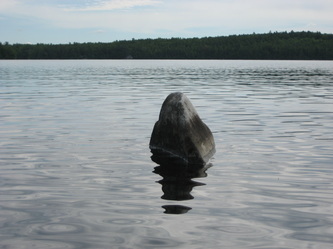 There is an occasional splash of a large fish heard, but nothing significant sighted. Less wildlife was apparent, but it was pretty warm and midday, which is not the best for animal sightings. I did not enjoy this location as much because I am very much about trees. Along this stretch of the river, the trees still sit far back from the water. 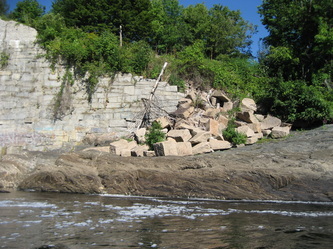 A legacy, I think, of the days before the removal of the Edwards Dam in Augusta. 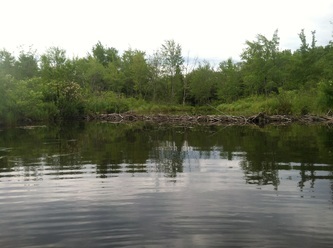 I believe all the land below the treeline was once submerged. It was somewhat cool for my daughters to be able to easily climb out on a sandbar and be standing in the middle of the wide river. 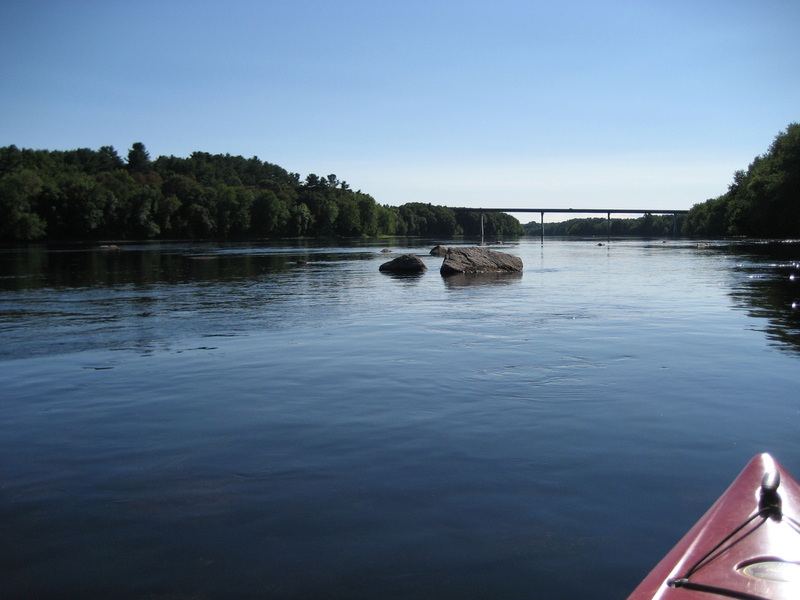 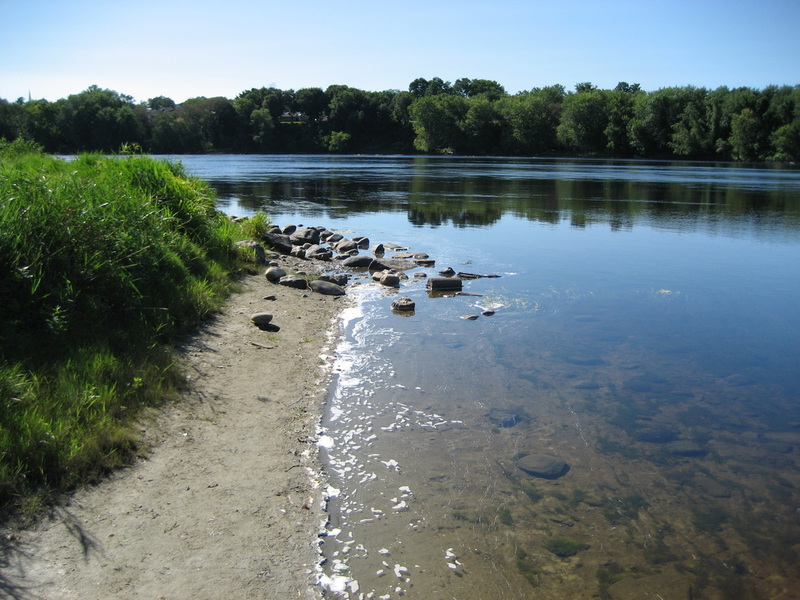 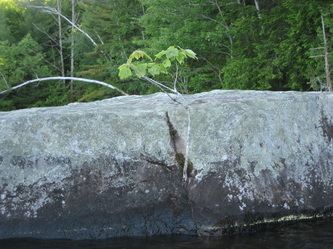 The Kennebec is surprisingly only inches deep in many areas. 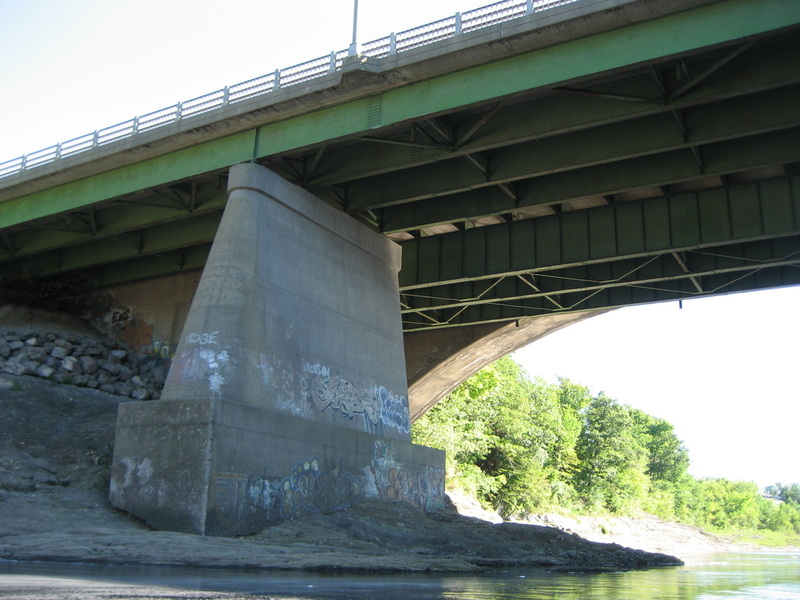 Access: The Sidney boat launch is a very nice, concrete ramp with turnaround spur located adjacent to the town's baseball field. 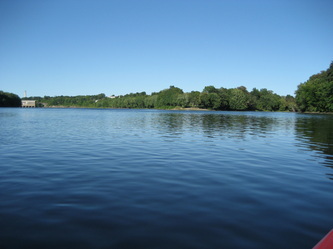 It also features an ample parking area for vehicles with trailers. 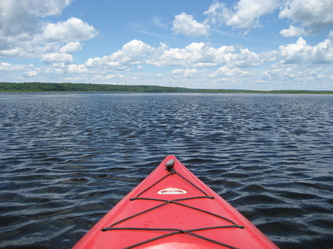 Description: This is a very pleasant and visually interesting little paddle. 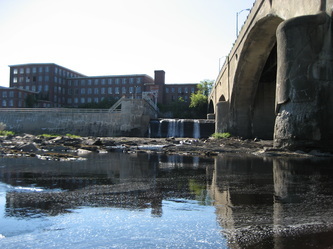 It's a relatively short stretch of Messalonskee Stream between the tumbling inflow just north of Kennedy Memorial Drive in Oakland and a dam. 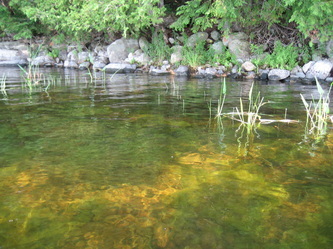 It it calm water with almost no current. 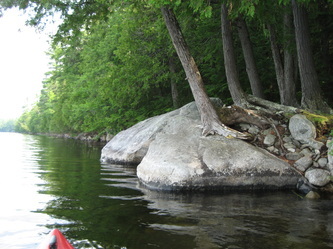 As you can see below, the trees get right up to the water. The paddle begins with a river feel and later expands into a small pond-like area. 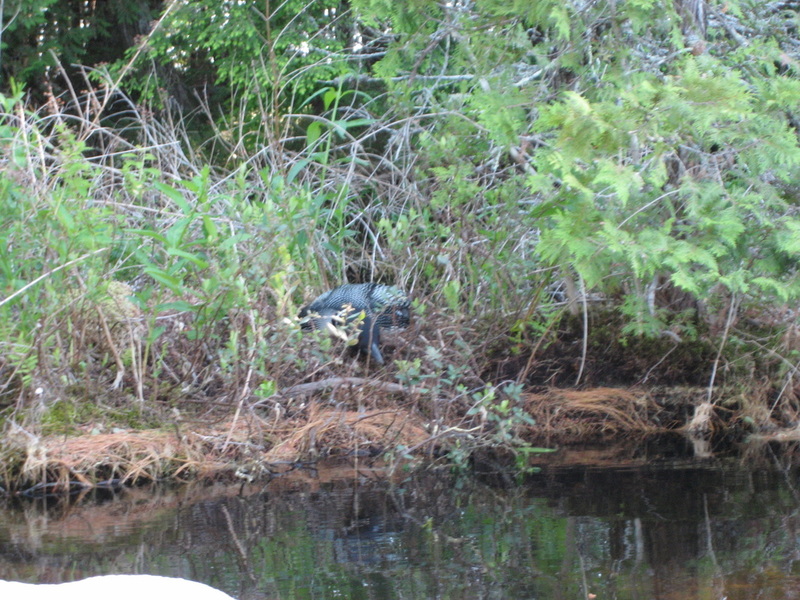 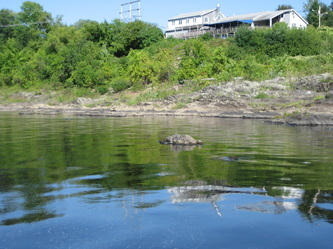 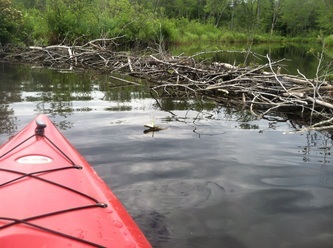 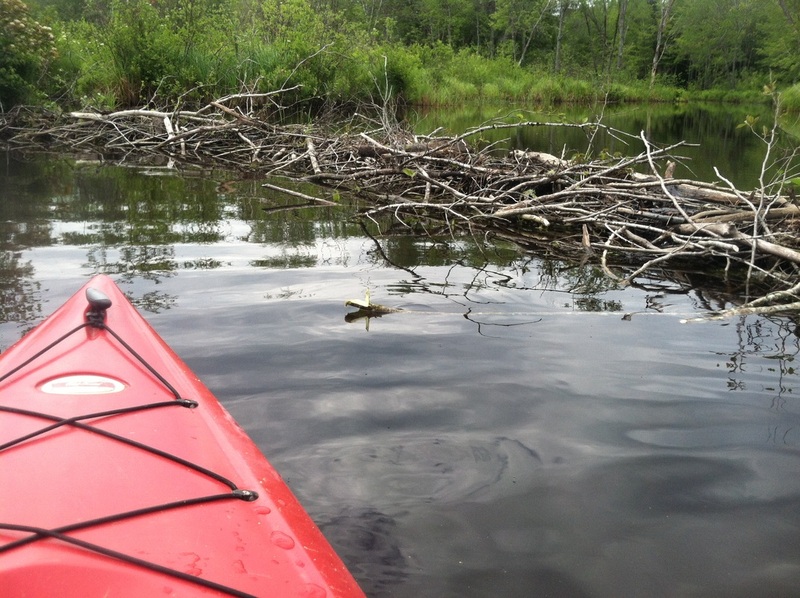 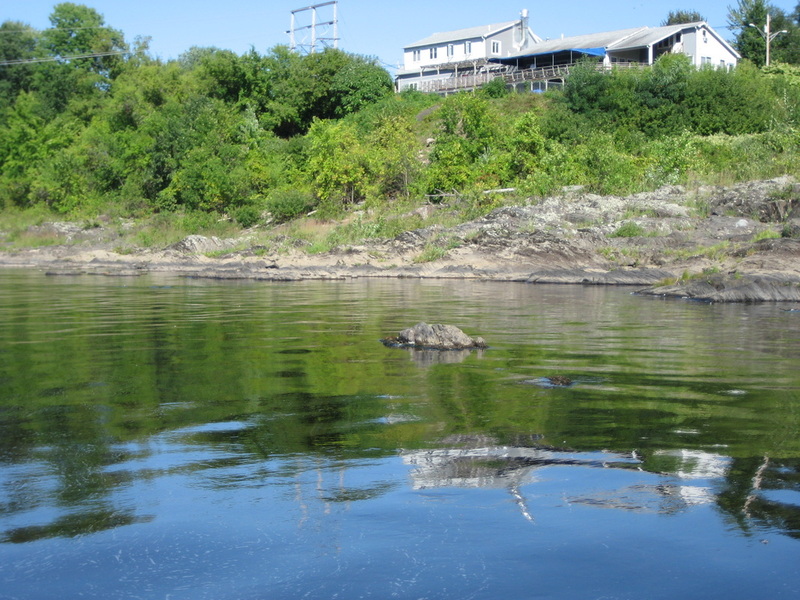 The shores remain interesting with some sign of beaver activity and turtles. 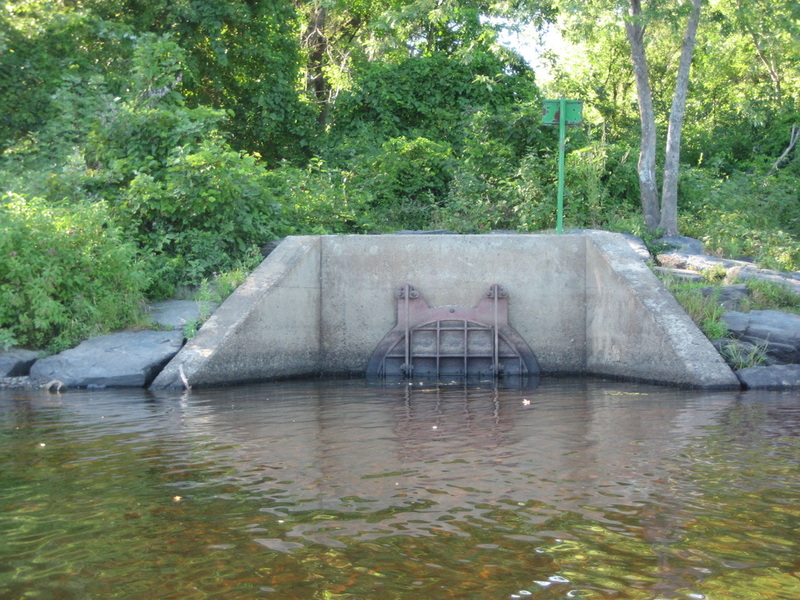 Turnaround point is the warning signs for the dam, cautioning not to approach too closely. This paddle is pretty conveniently right in town (Oakland), and is a quick option. 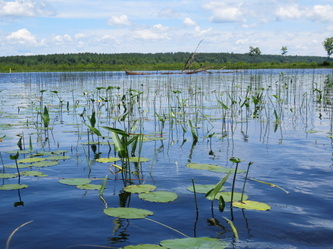 Description: The south end of Messalonskee Lake is a huge marshy area, with lots of grasses, water plants, small fish, and water-loving shrubs. 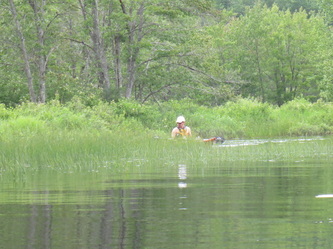 It's pretty interesting to explore for a good distance paddling north from the launch. 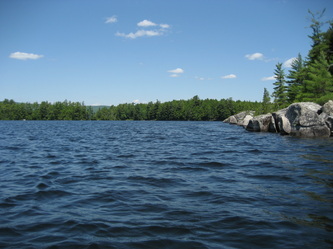 But eventually you come to the open water of the lake, and the waves increase. 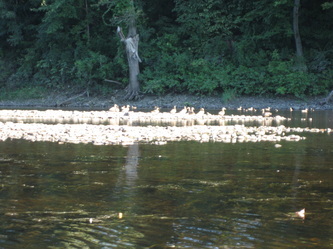 On a calm day, we found them pretty dramatic, and my girls preferred to head back. On a windy day, I'm quite sure I would not try it. 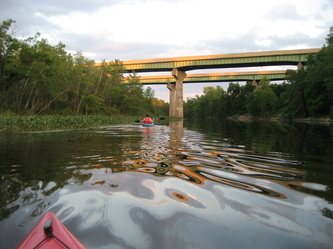 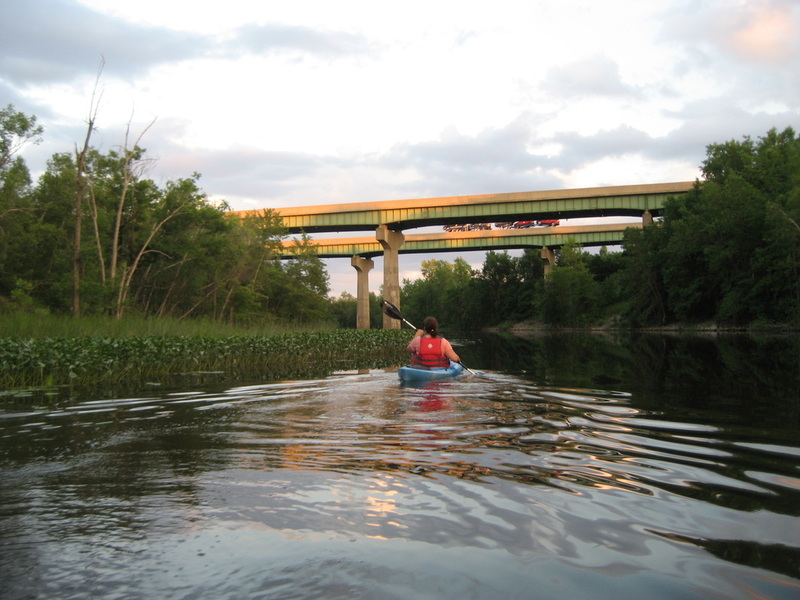 We ran out of energy just as we paddled back and were considering paddling the other direction, under Route 27. This leads into the meandering river that feeds the lake, and would probably be quite interesting. 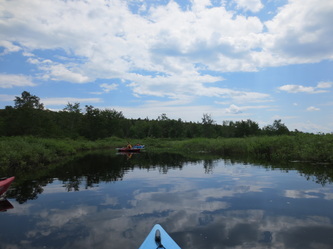 We were blessed with brilliant blue sky with Magritte-style picturesque clouds. Access: from boat launch with ample parking and easy turnaround driveway. This was once a boat ramp (the concrete ramp is still there) but is now closed to motorboats due to milfoil infestation. 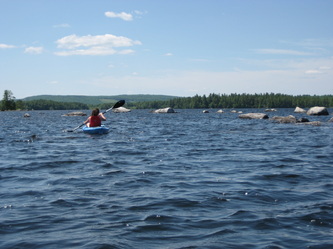 Description: This is one of my families favorite places to kayak. 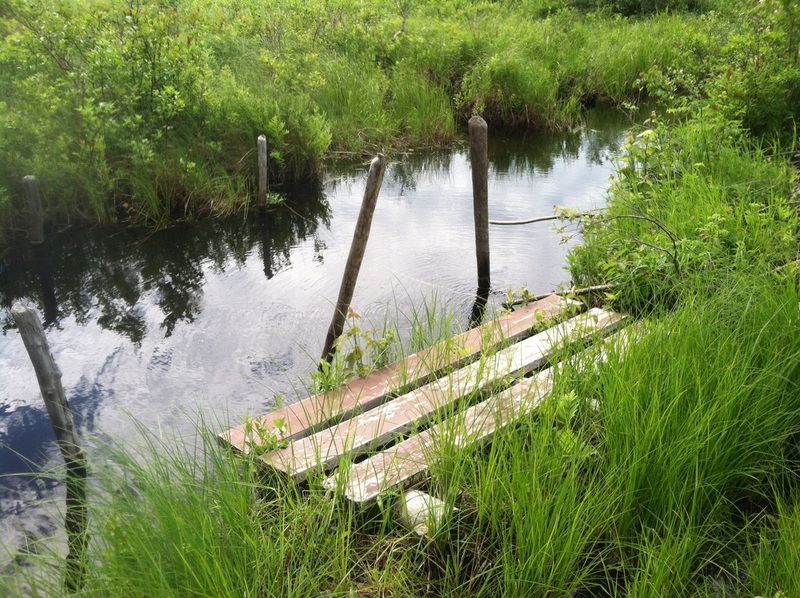 Another in-town option, it is easily accessible right off of North Street in Waterville. 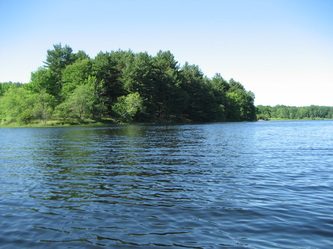 It is next to the North Street Recreation Area, the Alfond Youth Center, and for an after-kayak treat, there is the delicious North Street Dairy Cone ice cream stand. 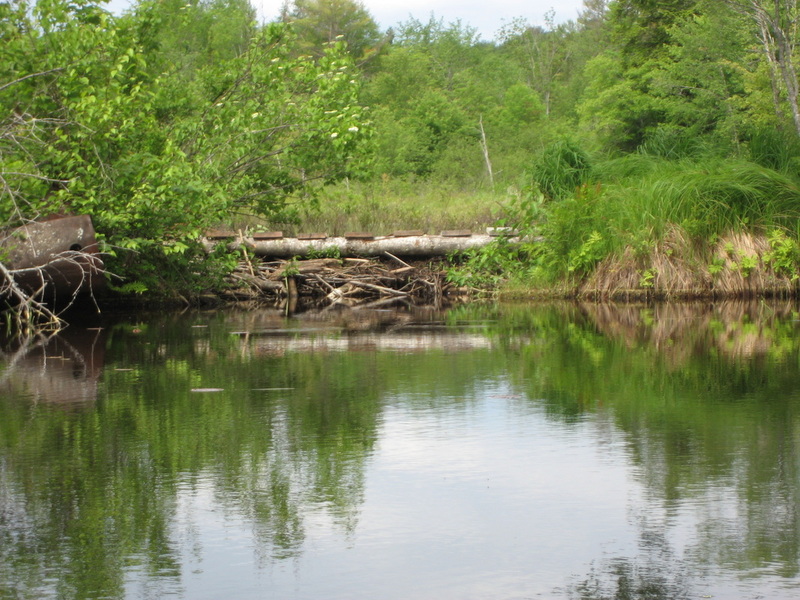 This segment of stream is a dam impoundment, and therefore perfectly calm and without discernible current. 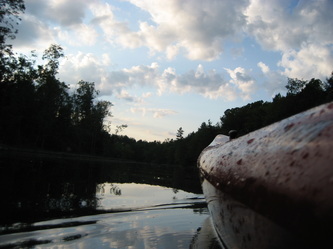 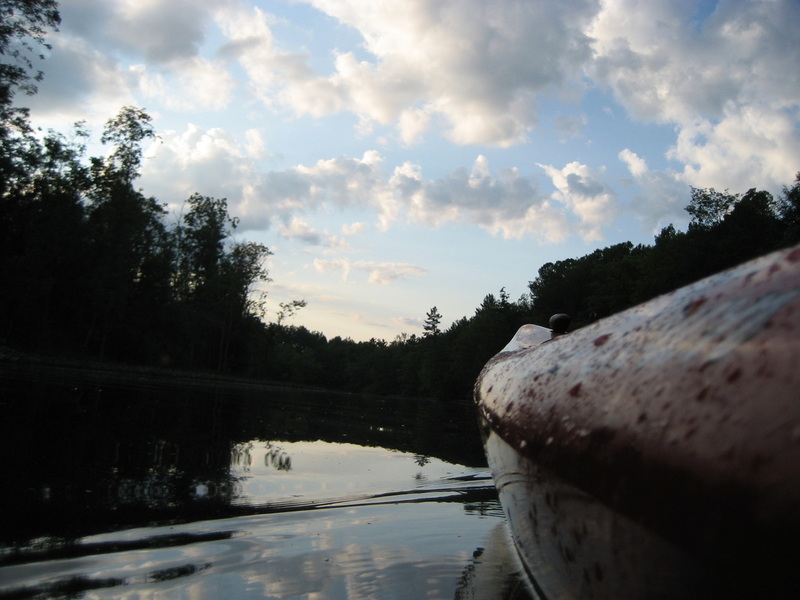 The pictures above were taken during a late evening paddle, and that is the most beautiful time. 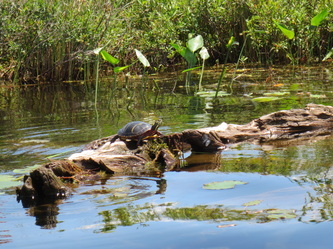 The colors are rich, and lots of wildlife emerges once the sun's intensity is waning. 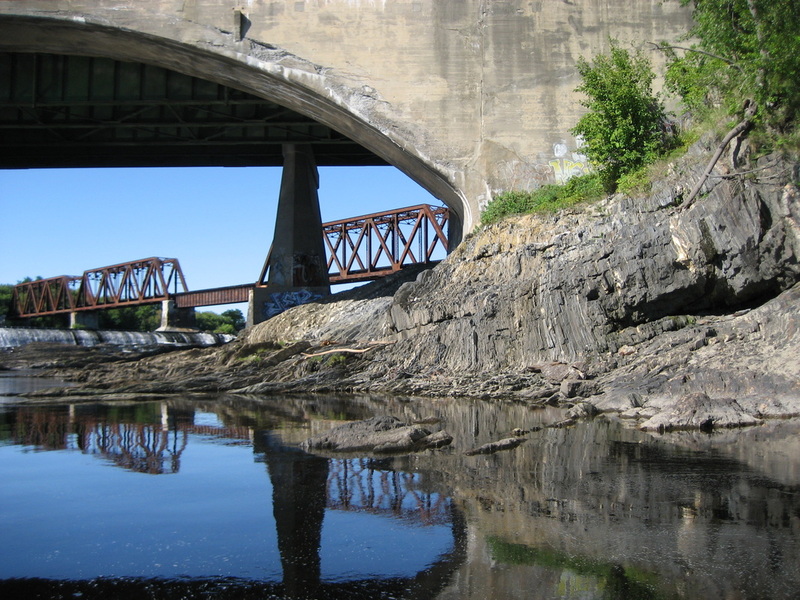 The route passes under the low North Street bridge and then under the high Interstate 95 overpasses on their soaring concrete piers. 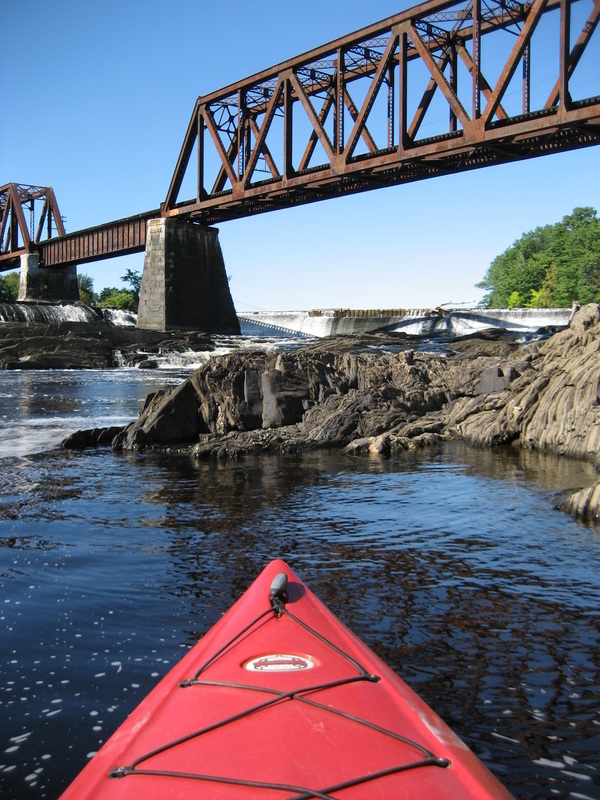 This is another example of how, in Maine, you can jump on the water in the middle of town, and with a few paddle strokes, you're immediately embraced by wild nature. From there the stream skirts the edge of land owned by Colby College and the Quarry Road Recreation Area. The banks are lined by woods, and streamside marshes, with lots of variety. 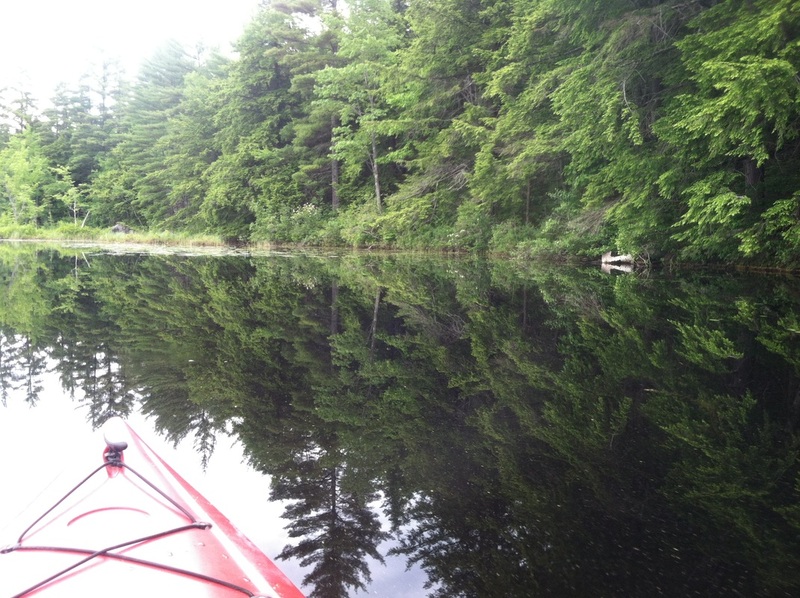 There are enough turns to stay interesting. 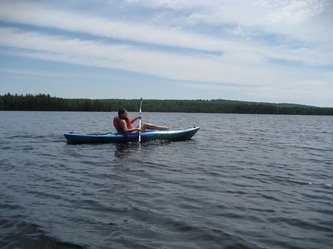 It's an ample length for at least a 1 to 1.5 hour casual paddle. We have yet to make it all the way up to the limit at the next dam. 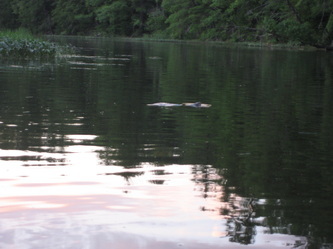 Below is some video of snapping turtles tussling in the stream in the evening. 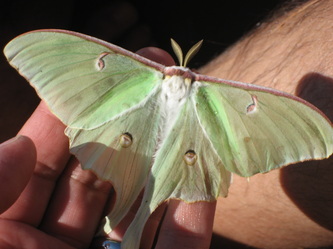 They are huge, ugly, and hiss like dragons. 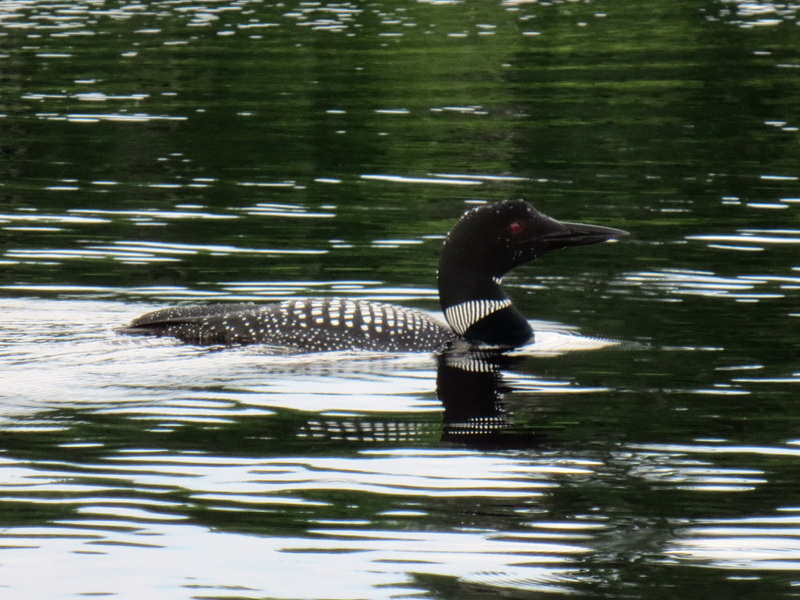 Fascinating to watch. 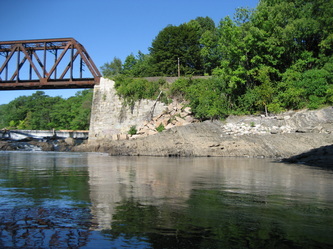 Access: From North Street boat launch. 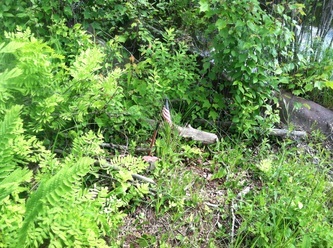 Off-street paved parking lot surrounded by mowed grass. Carry boats across paved walking trail down fairly steep dirt embankment to water's edge. 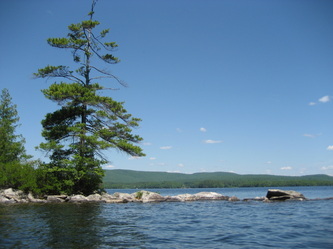 Description: We have always loved Lake George. 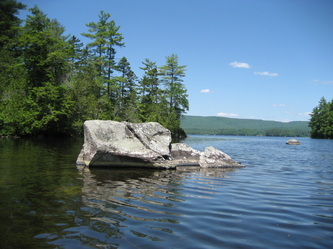 When the girls were little, it was the ideal place to take them due to the warm, clear water; perfect, gradual sand beach; and clean facilities of Lake George Regional Park. 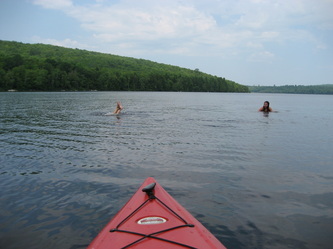 But on this trip, we casually kayaked around the entire lake. 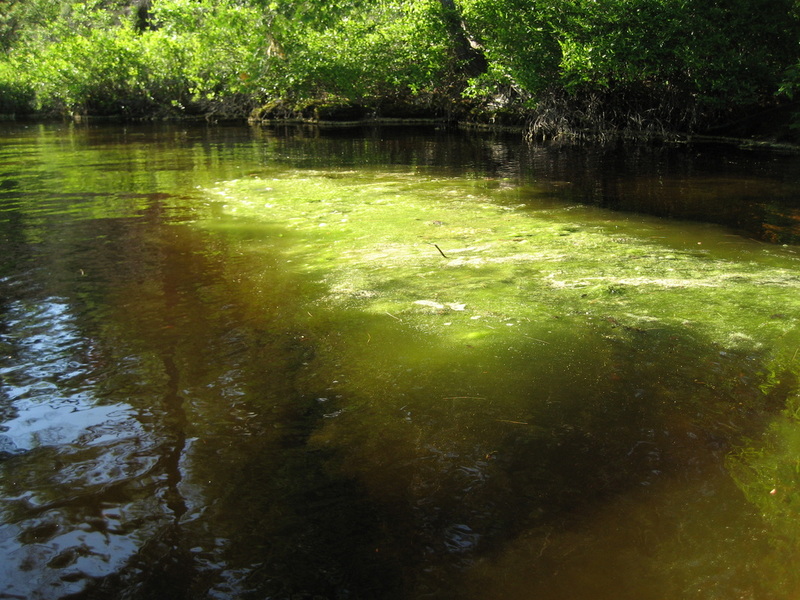 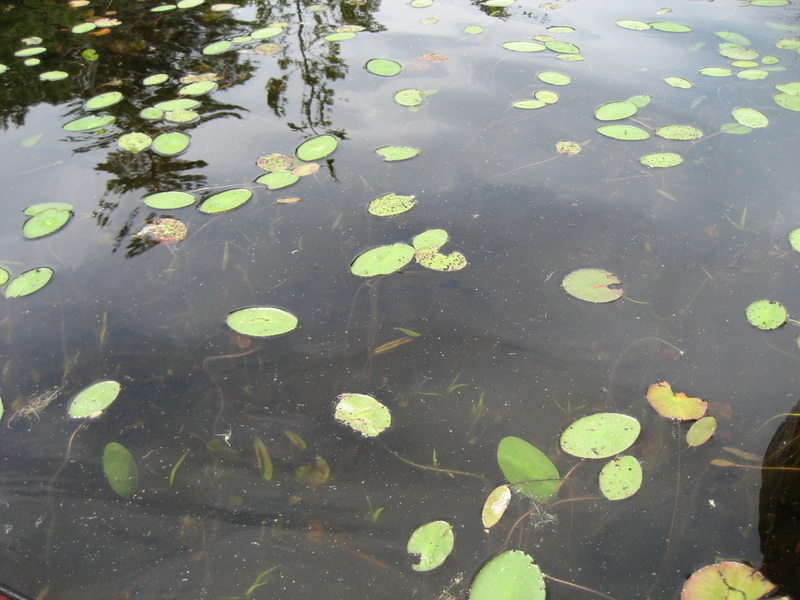 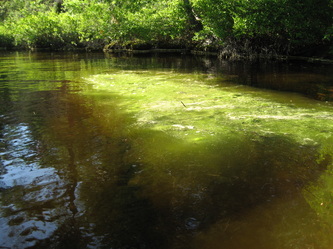 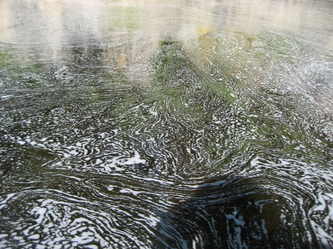 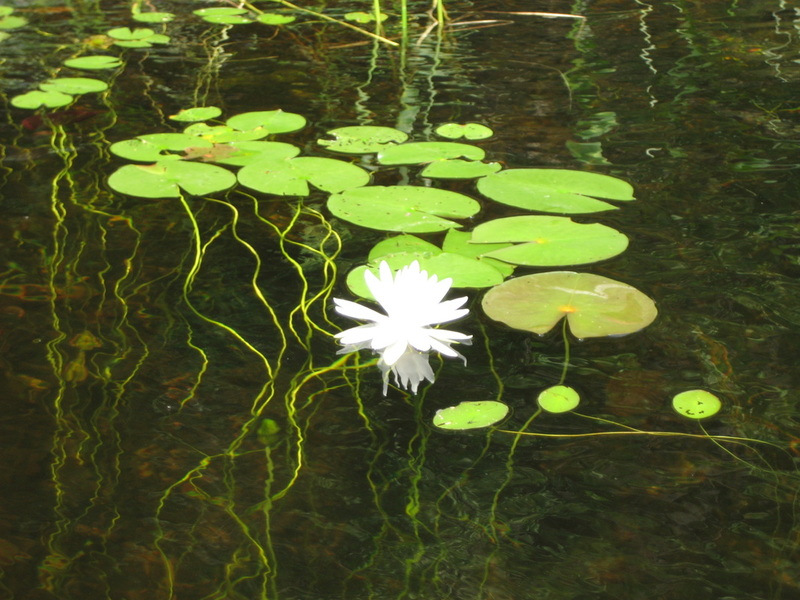 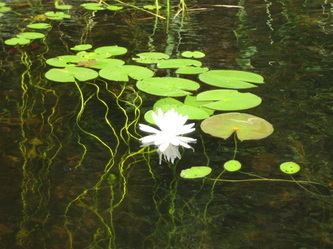 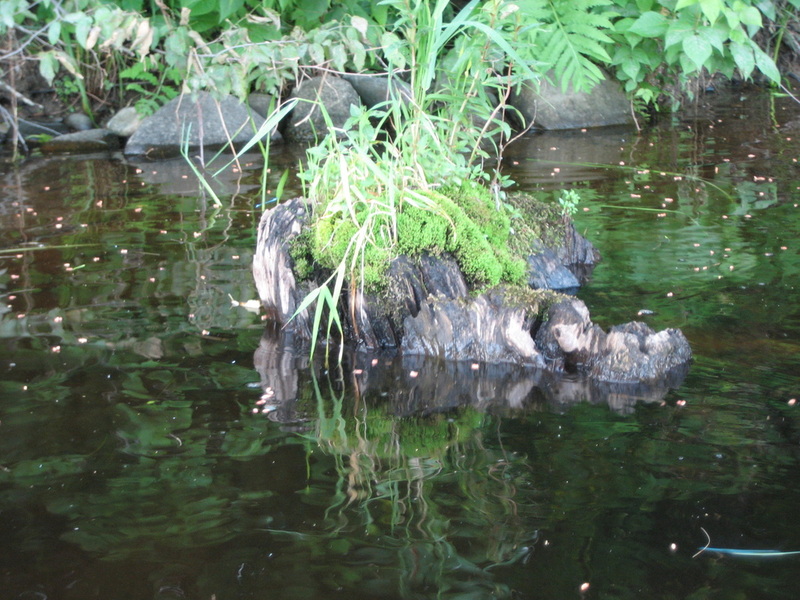 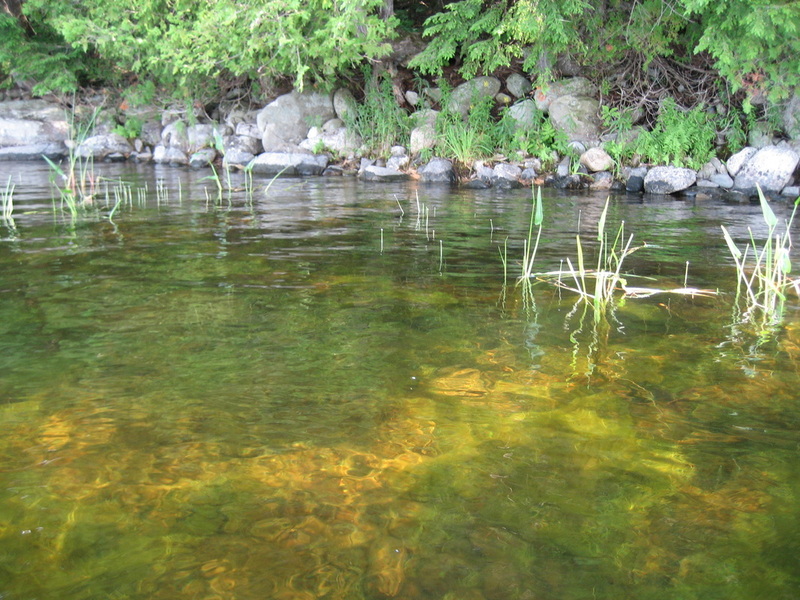 We started at the shallow end, with beautiful water plants and small fish visible below us in the clear water. 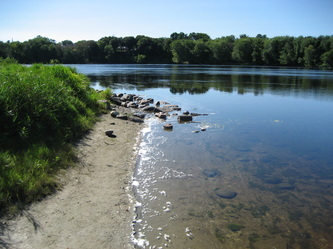 We proceeded up the west shore a short distance, checking out the west side beach that we've never visited. 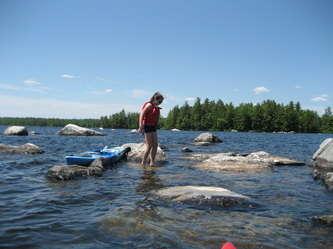 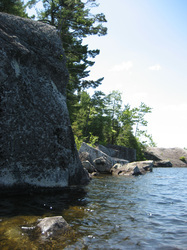 Then we paddled across the open water of the lake, past the east side beach that we've frequented, and proceeded up the boulder-lined east shore. 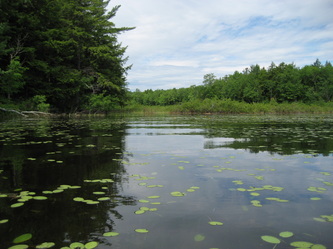 At the north end of the lake are two inlets (or maybe one is an outlet) with bog characteristics. 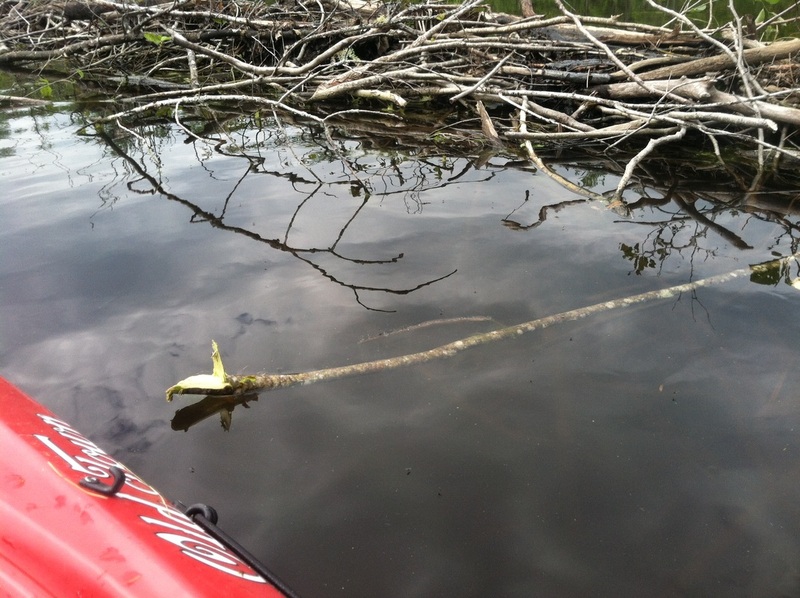 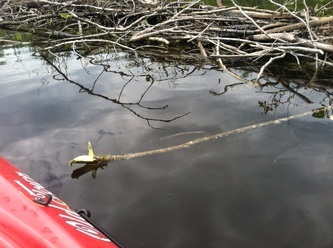 The eastern one, at least, has a navigable channel that we paddled up for a few twists and turns before coming to a fallen tree blockade, where we turned around and returned to the lake. We saw a man with facemask and snorkel exploring the area. 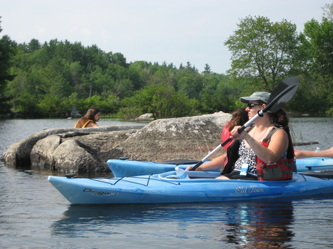 We paddled back south to the boat launch area, where we staked out a claim near some shoreline boulders in shallow water. 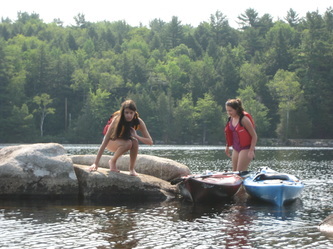 My daughters wanted to do some swimming. 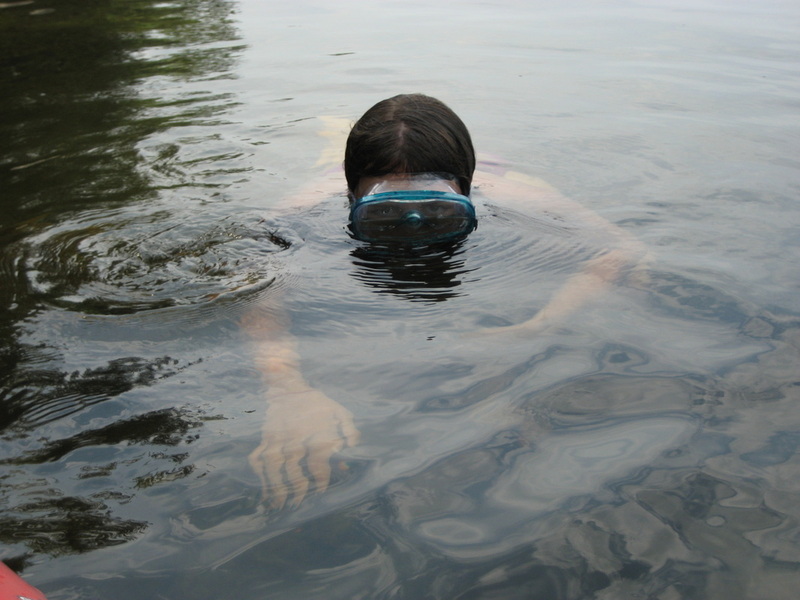 I paddled down and got their facemasks to facilitate underwater exploration. 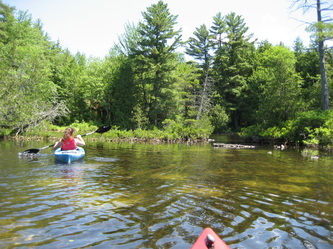 They swam and had close encounters with small friendly fish, while Jenn and I just floated in our boats and snacked. 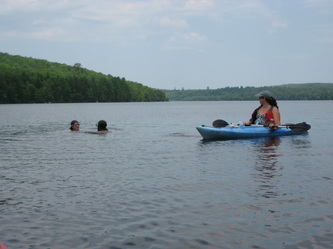 The girls enjoyed swimming under me. 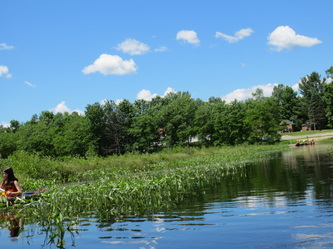 This is a thoroughly enjoyable location, and remarkably interesting for a lake, which can be less than dynamic, as we experienced on the China Lake trip described elsewhere. 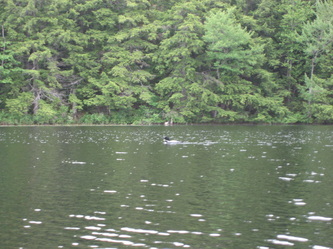 Loons can be seen here. 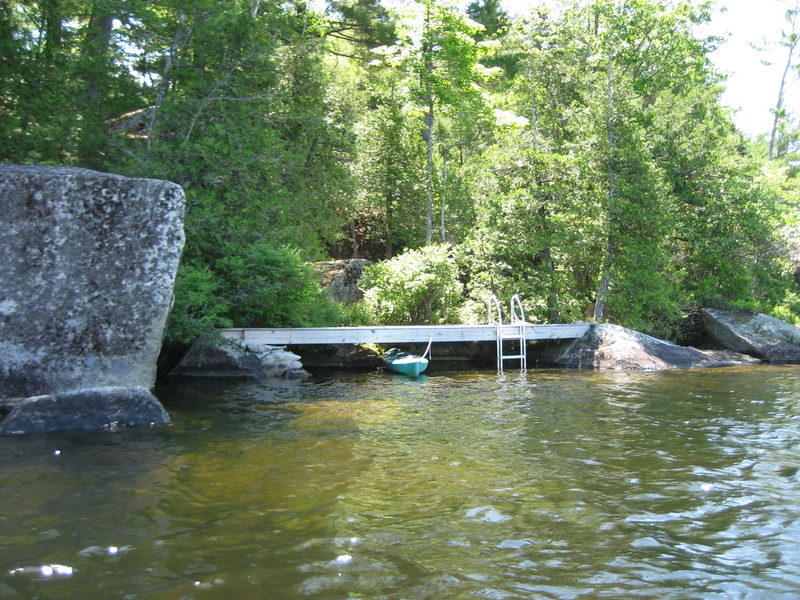 Access: nice concrete boat launch with adjacent dock, handles boat trailers, power boats, and paddle boats with easy and convenience. 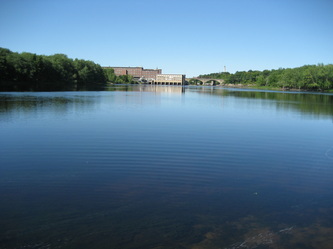 Plenty of turnaround area and parking. 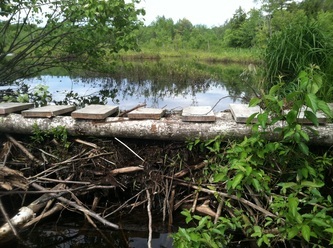 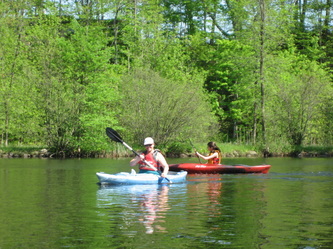 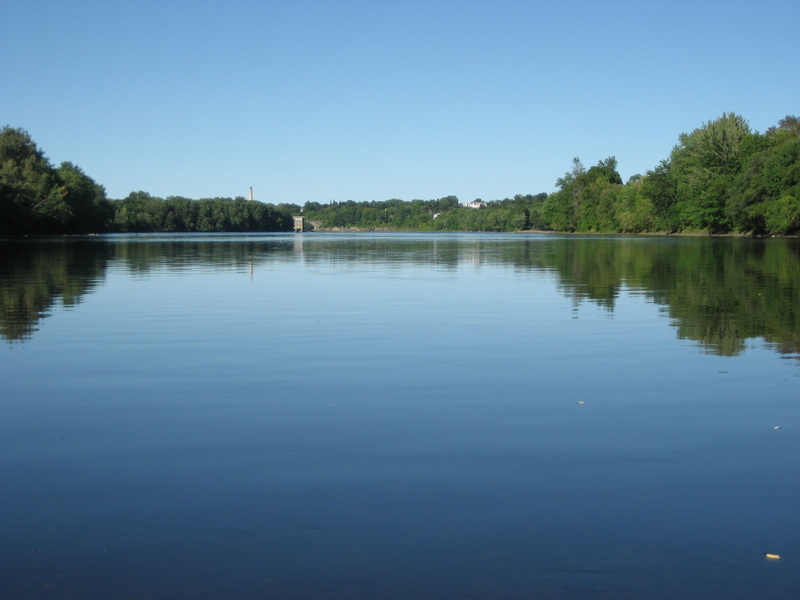 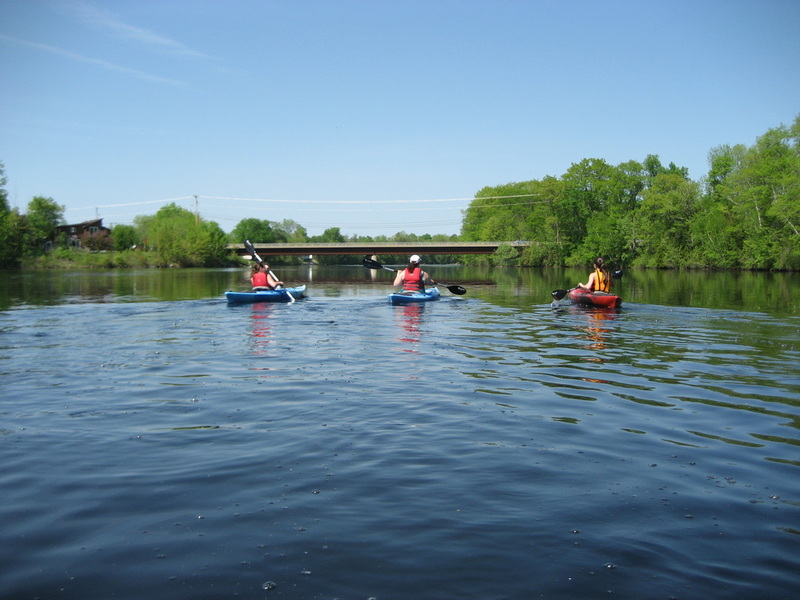 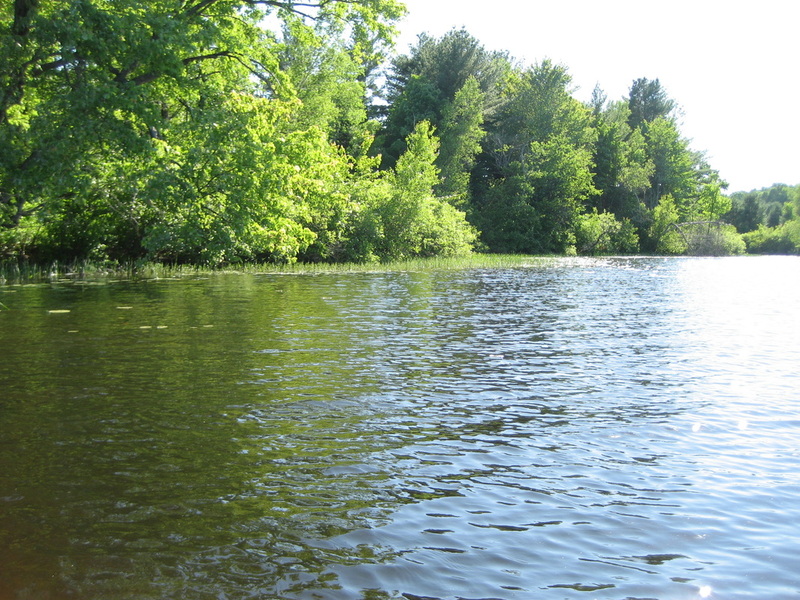 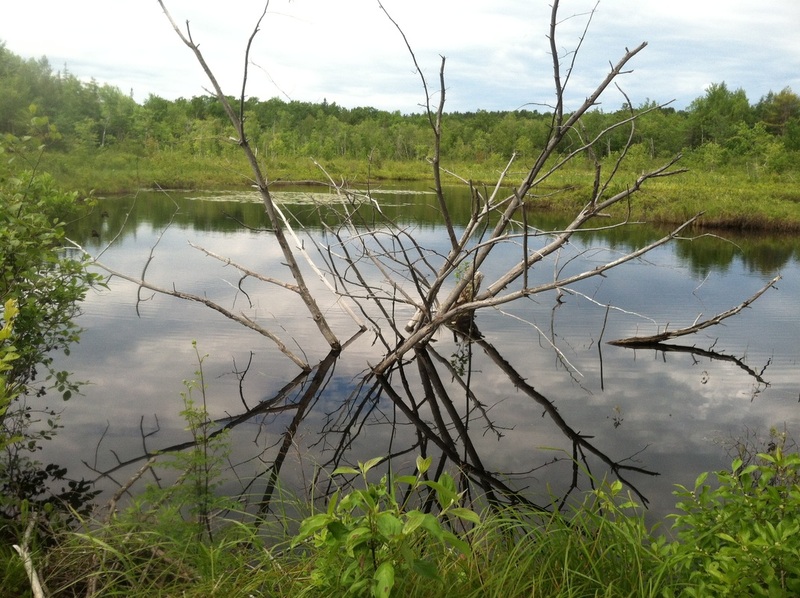 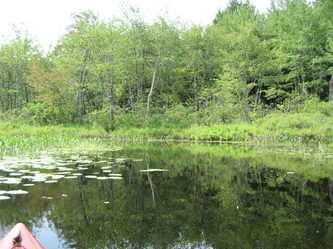 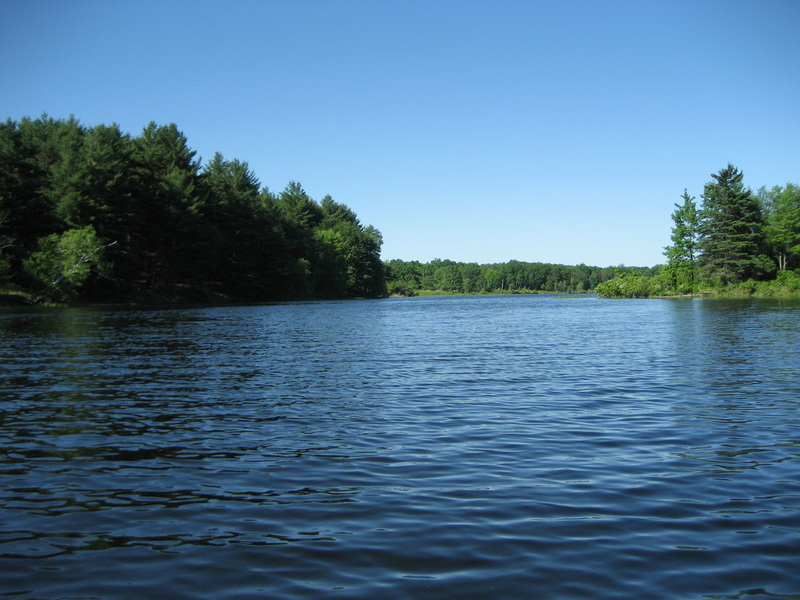 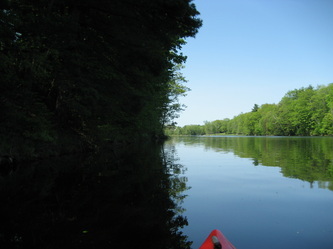 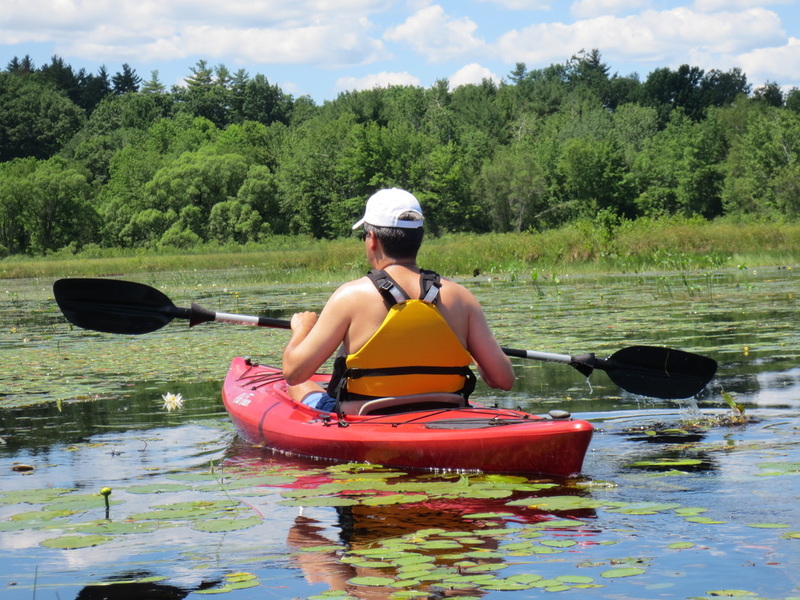 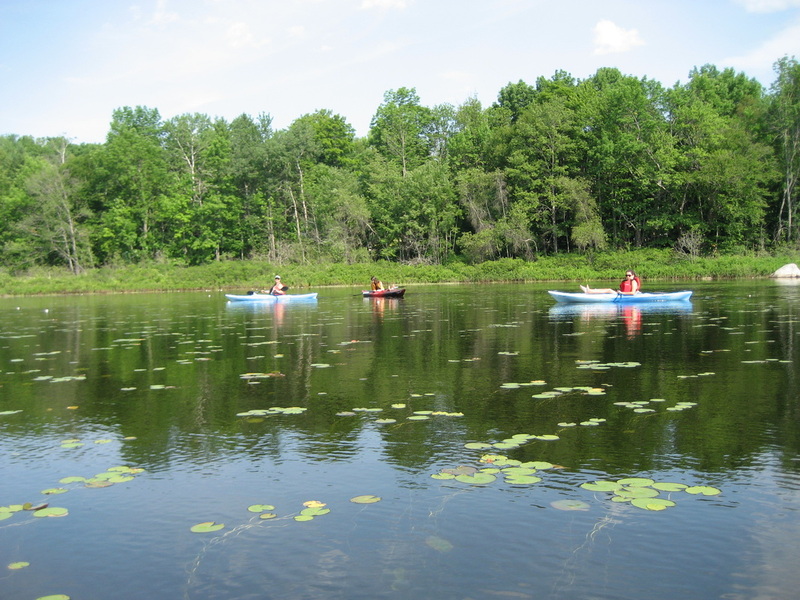 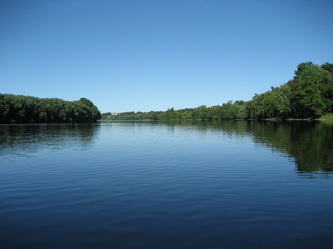 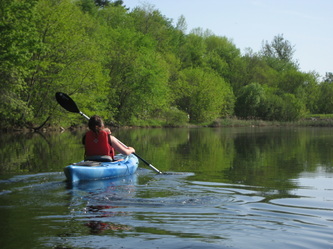 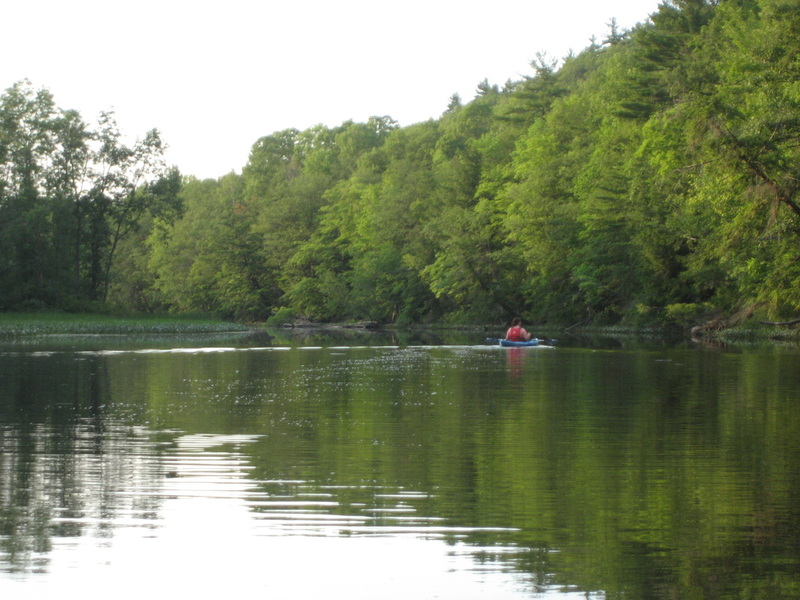 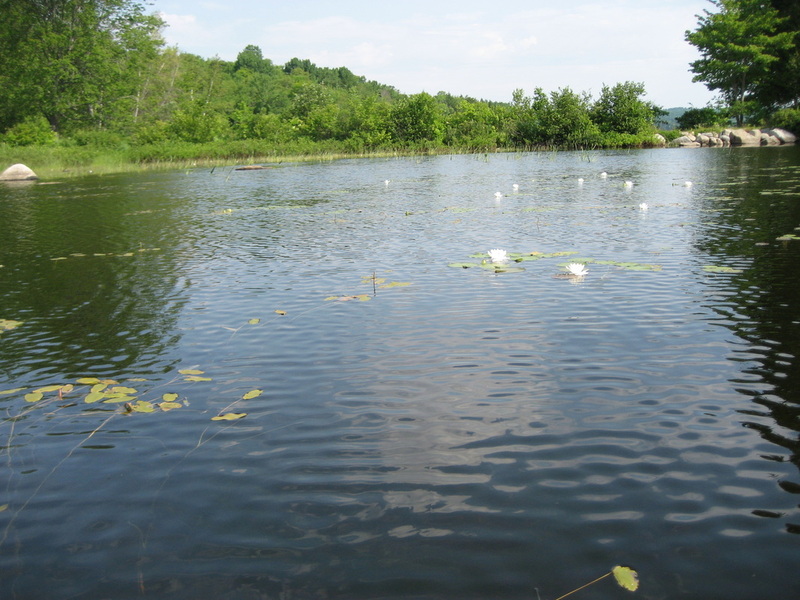 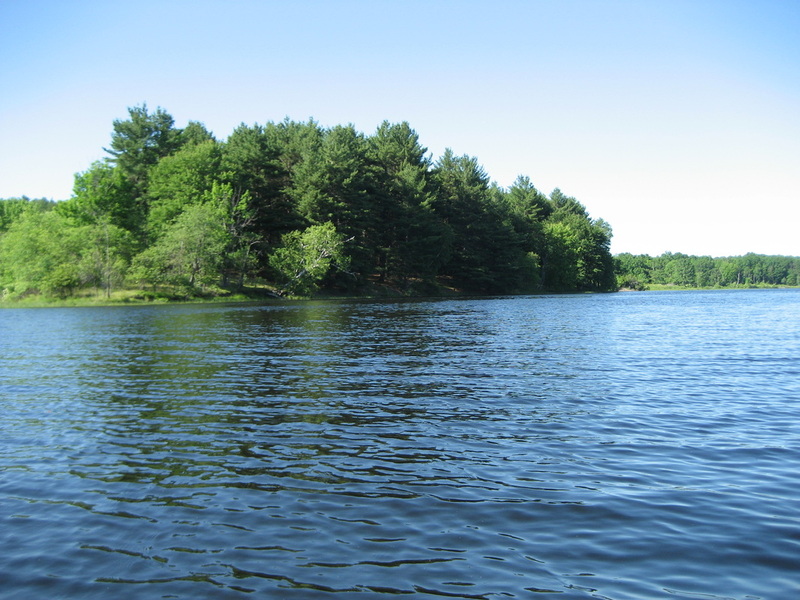 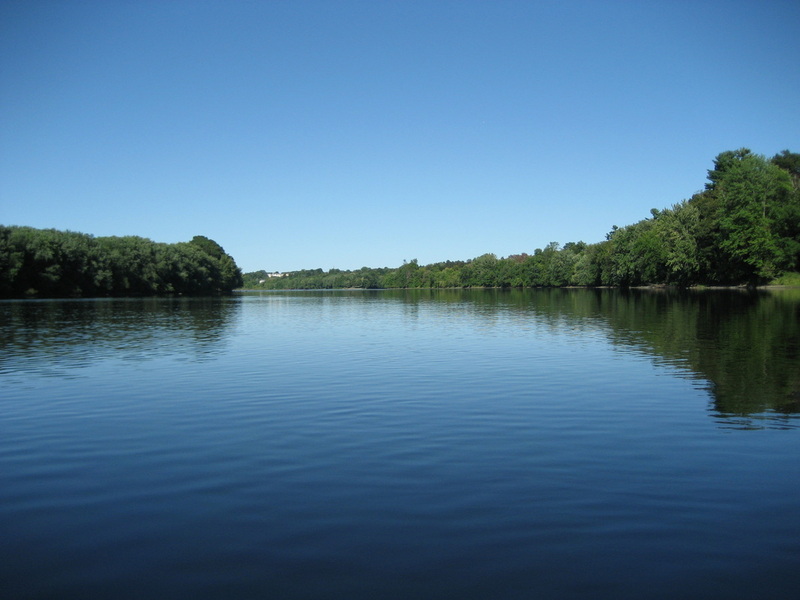 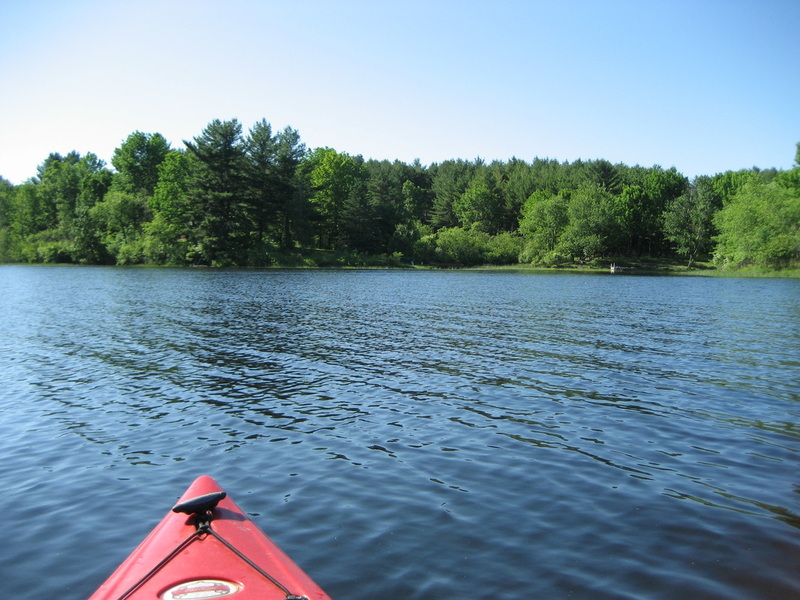 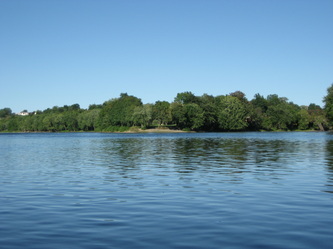 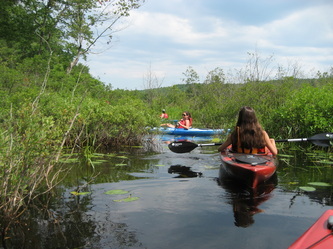 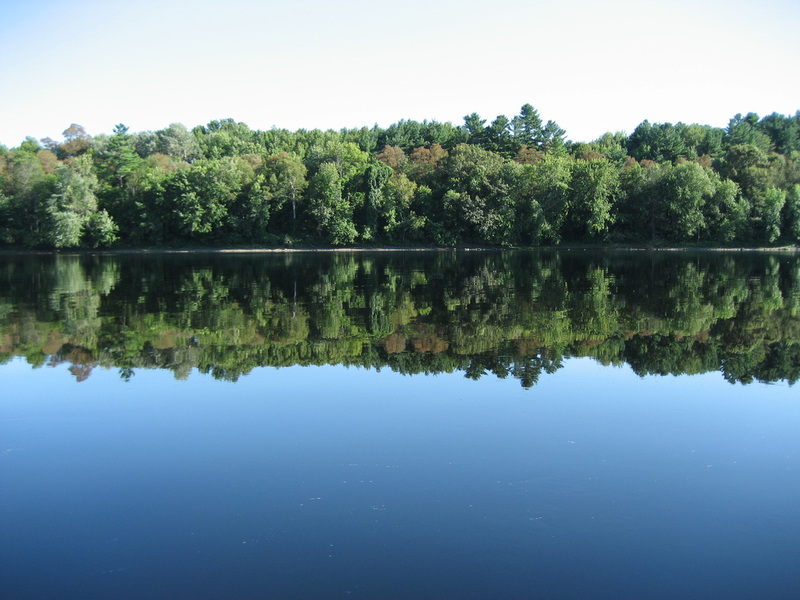 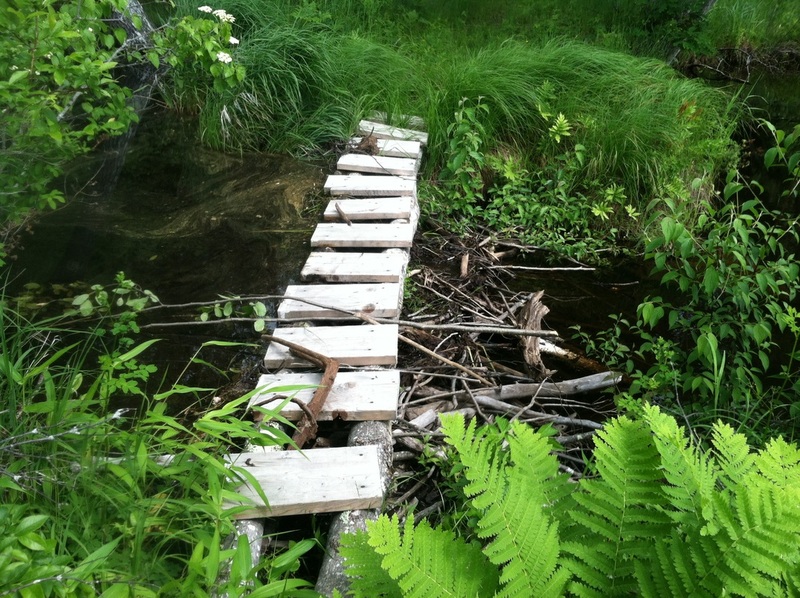 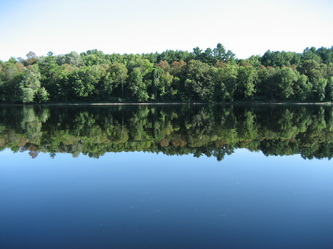 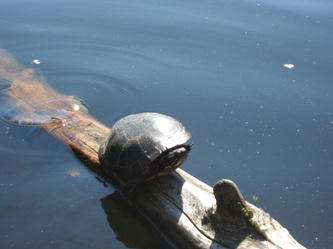 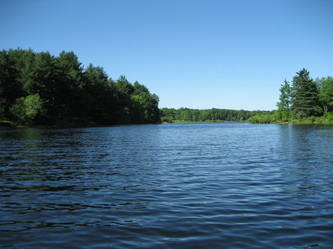 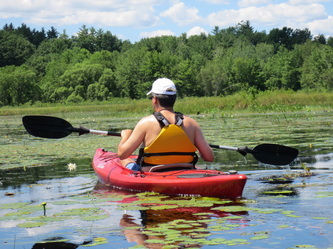 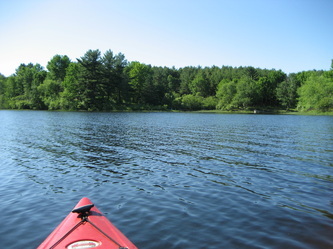 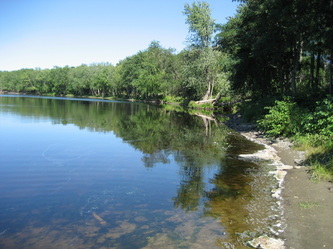 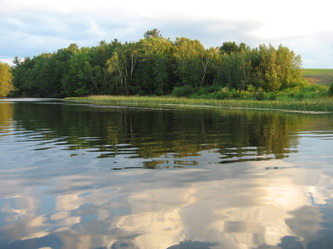 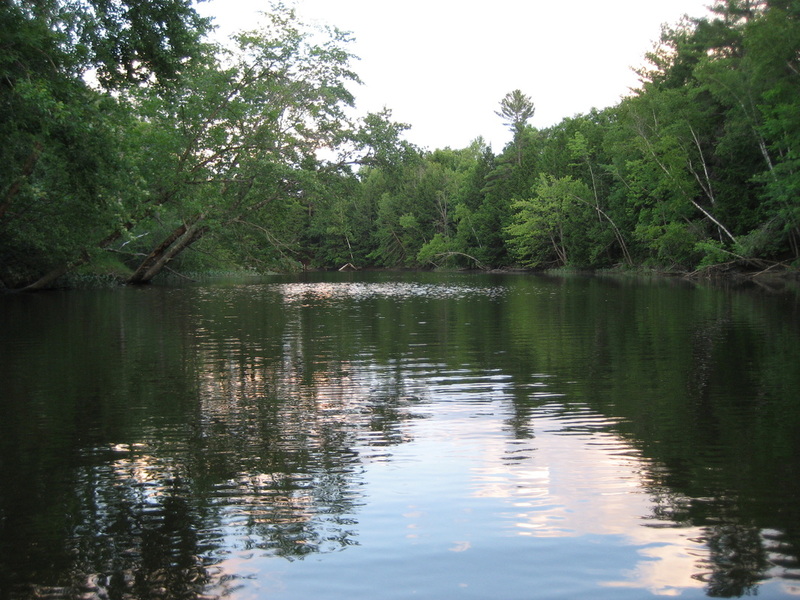 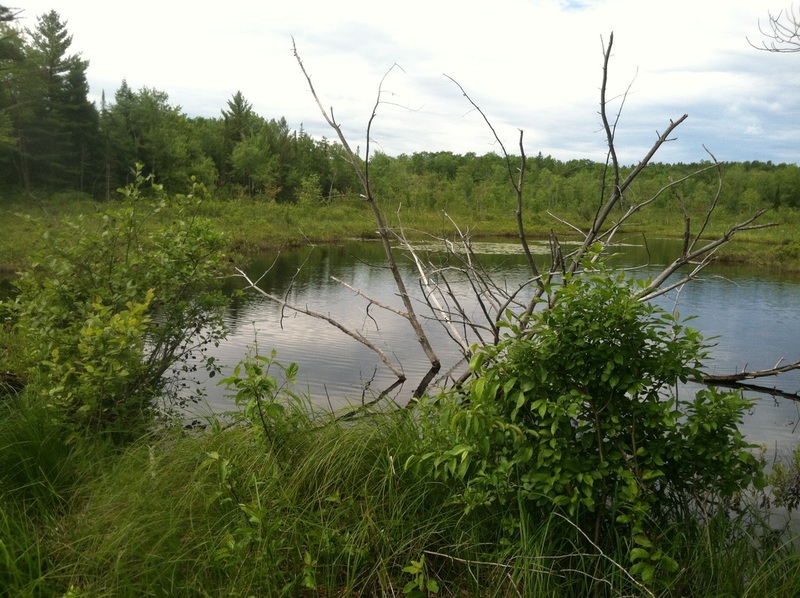 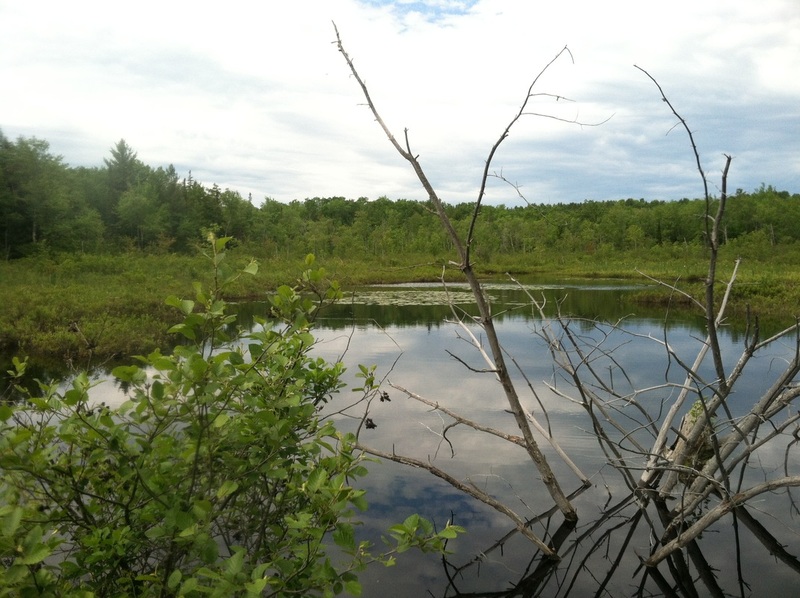 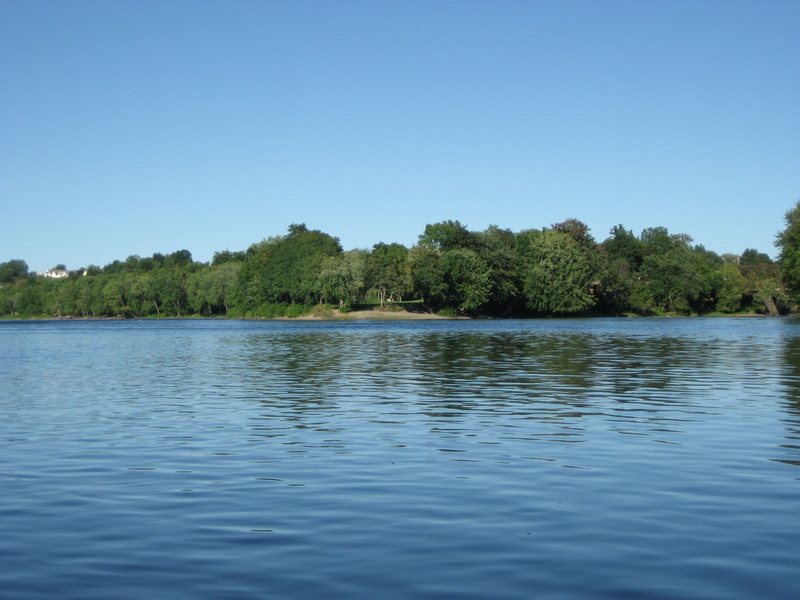 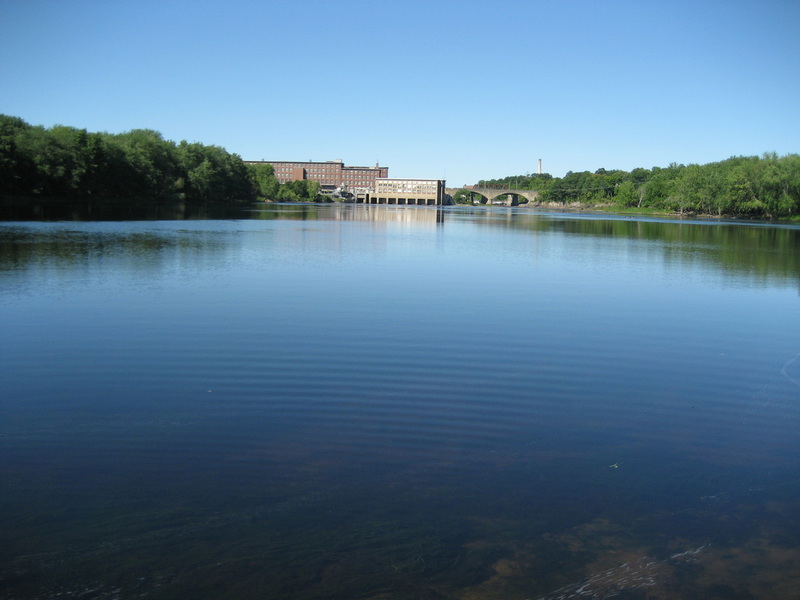 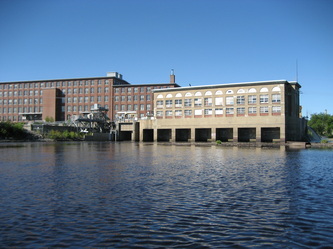 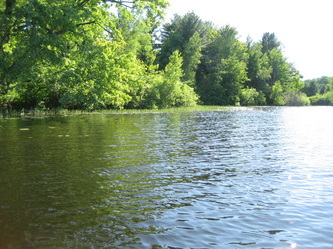 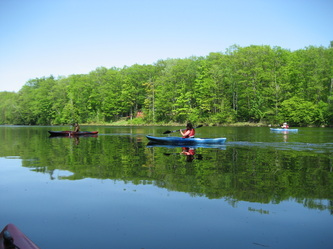 Description: Sibley Pond offers two possible experiences. After leaving the boat launch you turn right and pass under Route 2 for a lake experience, or left for a bog experience. The lake is beautiful, with a varied shoreline of woods, marsh, and boulders, peninsulas and inlets, and some areas with camps and docks. 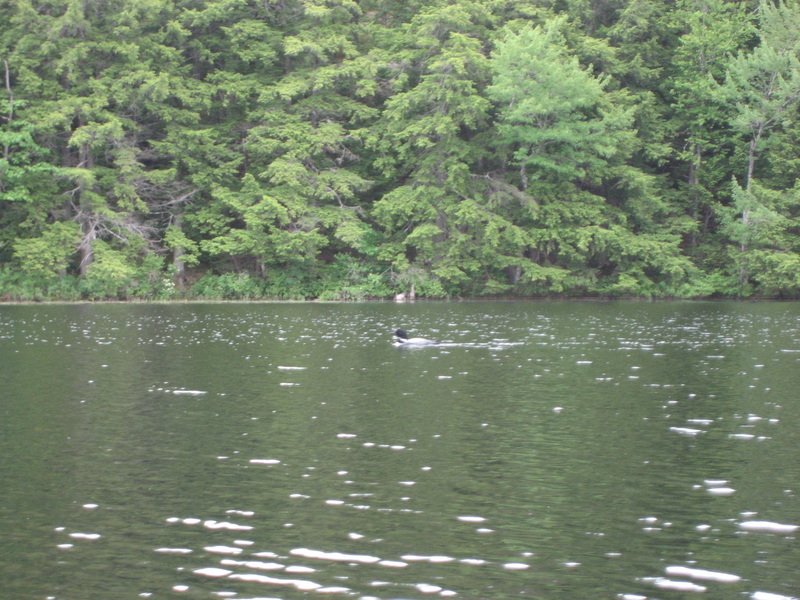 And there are loons on this lake. The bog is a wonderful, serpentine course just wide enough to be easily navigable, but narrow enough to give that cozy exploratory feel, if you know what I mean. 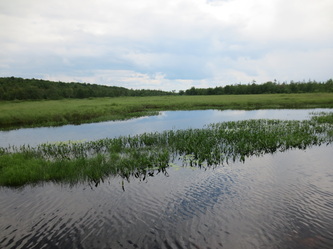 Our visit was threatened by passing thunderstorms, forcing us once to return to the boat launch and lunch in the van while waiting to see if we were going to be victims of a deluge. 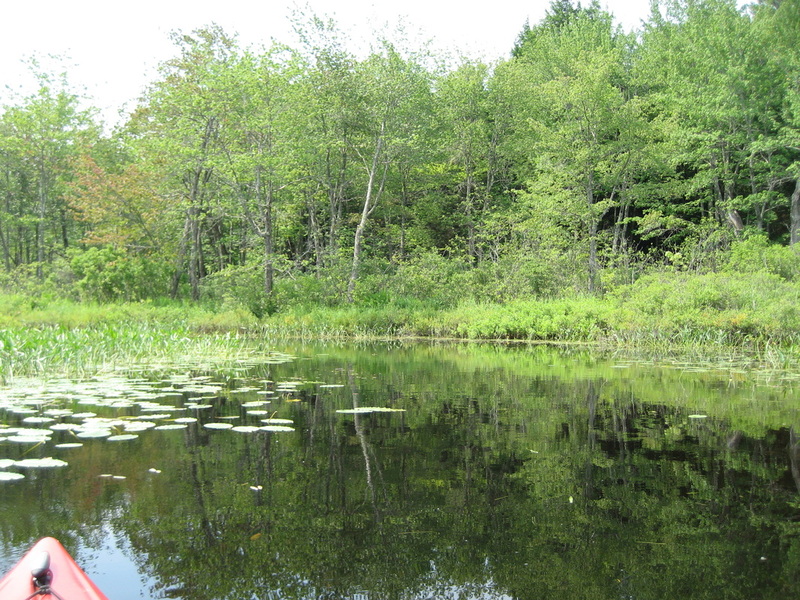 Thus, we didn't explore as much as we would've liked. After it passed, we ventured back out on the side of Canaan Bog, but didn't get far before a storm of another sort arose. 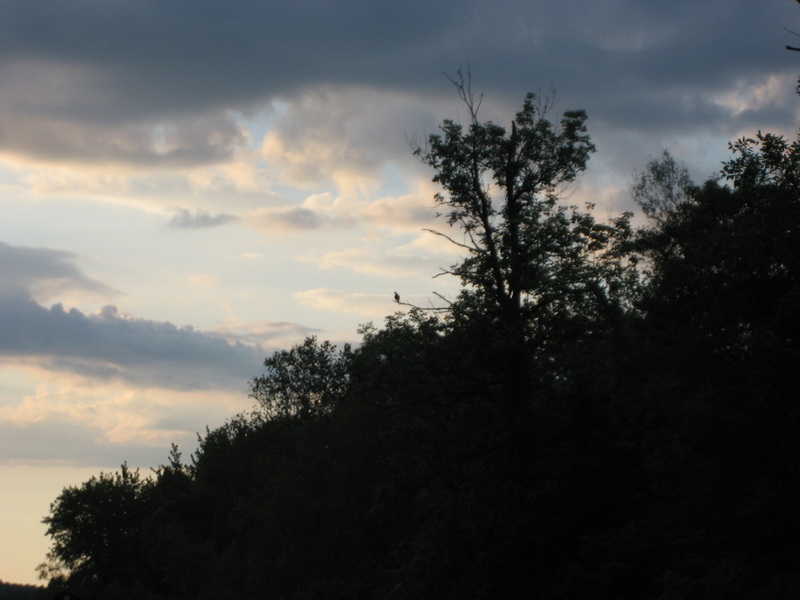 That is to say, when my younger daughter gets tired, her mood turns foul as the blackest witch, and she becomes an insufferable companion. Access: access is the hardest part of this trip. The boat ramp is easily overlooked, being hidden behind a guardrail along Route 2. 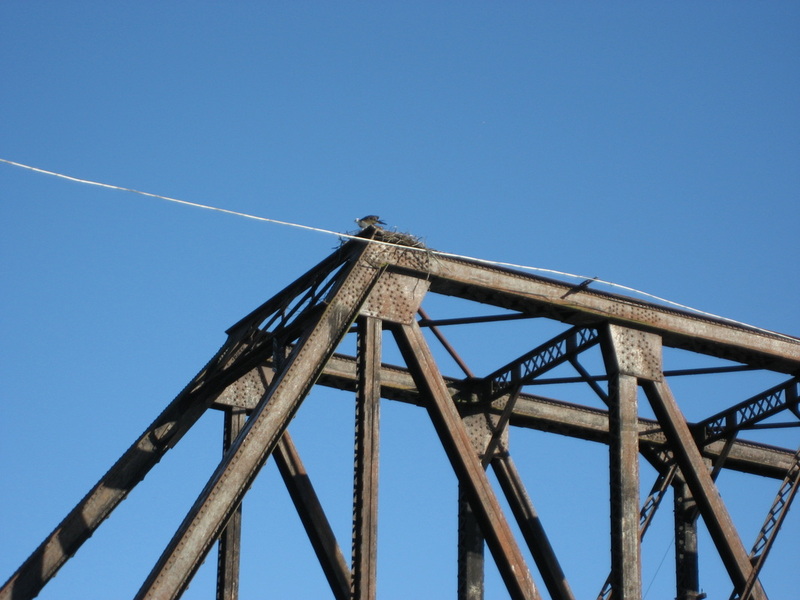 It is at the east end of the bridge, on the south side. It is a long, dirt & gravel on boulders affair. 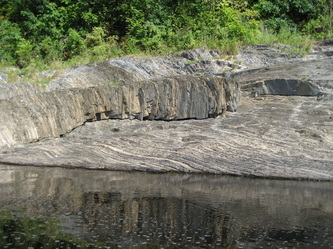 Medium rough. 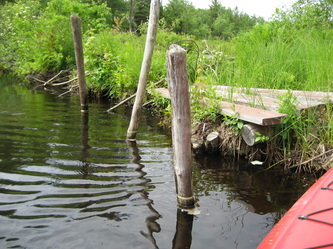 It runs down and into the water and is trailerable for power boats, but it is not very manicured yet. 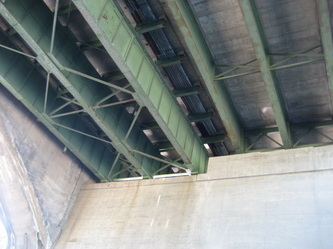 I think it is of recent construction and may receive future improvements. I drove our van in head-first and, although I'm getting much better at trailer backing and maneuvering, I didn't dare try turning around. 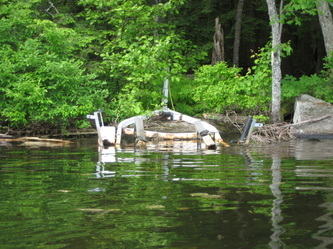 Instead, I unhooked the trailer and reversed it by hand; then turned the van around and hooked things back up. 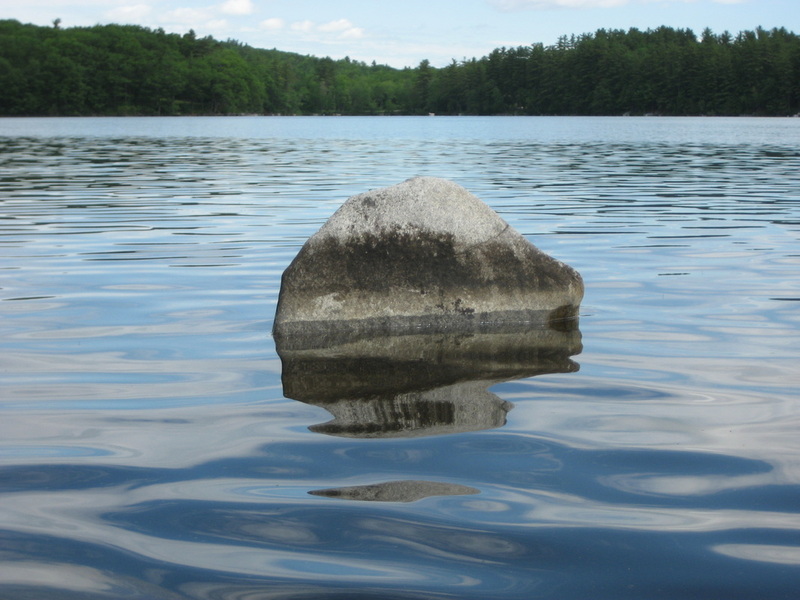 Likelihood of Returning: Medium High. 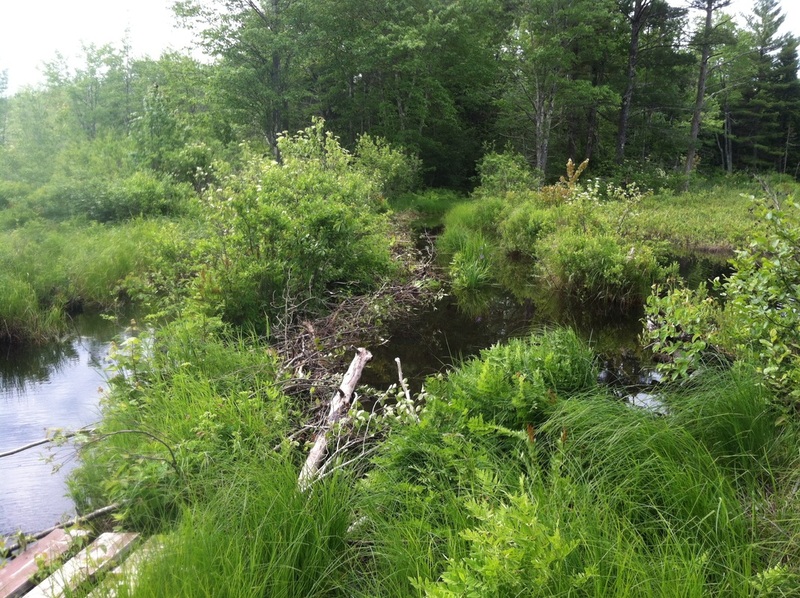 I'd really like to explore Canaan Bog further with more time.